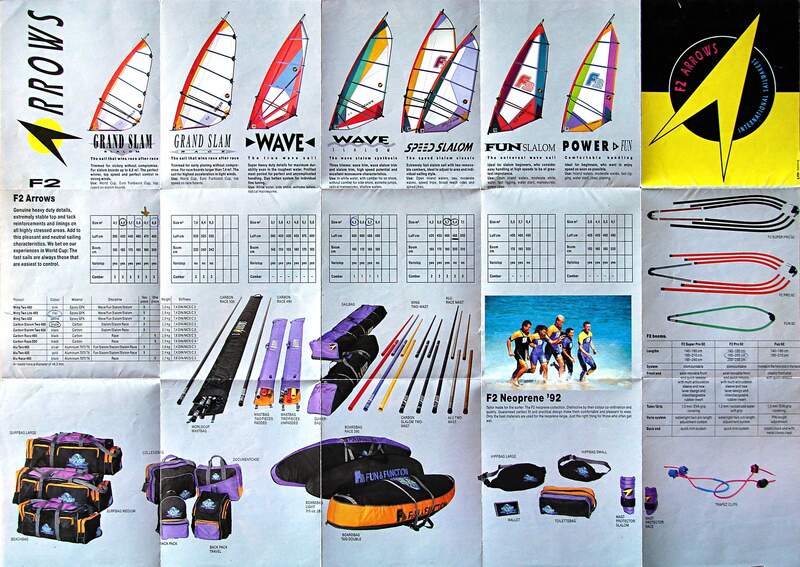 If you started windsurfing at least 15 years ago you may spot your equipment of those days by going through this post. If you don’t find what you are looking for, check again later, because the material I have collected is rather much and I will be adding new stuff constantly. If you are impatient, just ask me what you are looking for and I’ll try my best to find it. 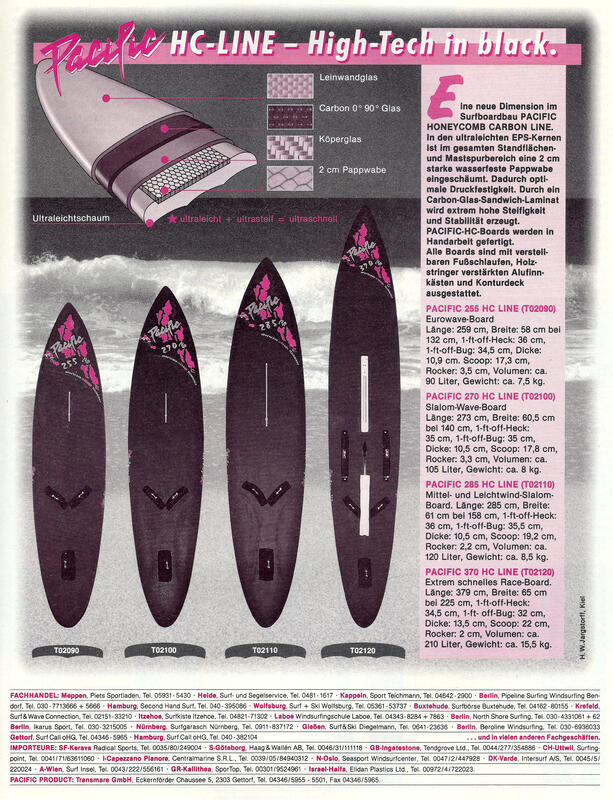 As F2 was my favorite brand – I still own & ride quite a few of these boards, the first part of this post is only F2. In Part 2, you can scroll alphabetically all other brands. 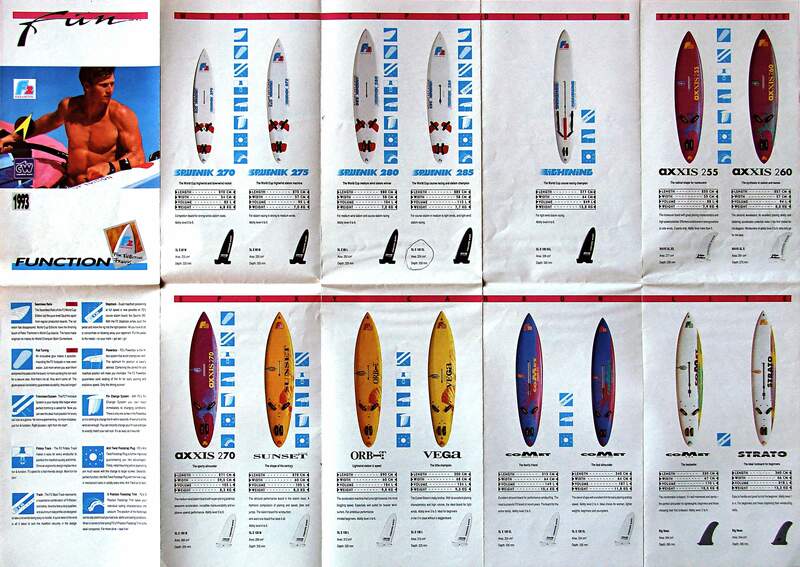 If you have any brochures of boards before 2000, I’ll be happy to include them! 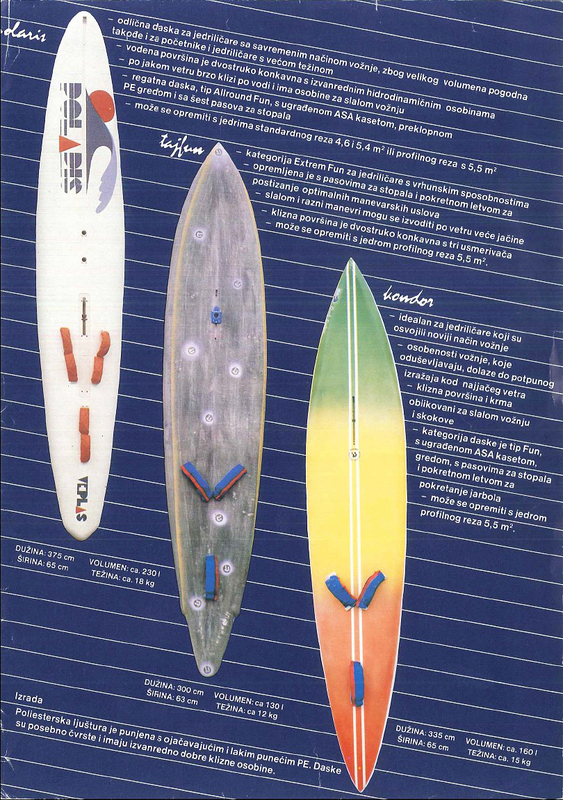 Well known Yugoslav/Slovenian manufacturer of D2 boards Burja, and D1 Levant in the begining of eighties. 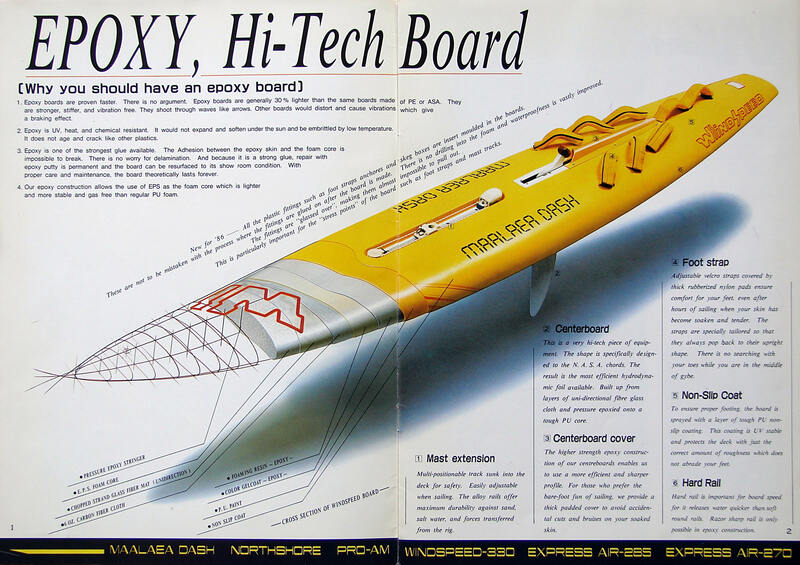 When the popularity of racing displacement boards among the broad masses collapsed, Veplas as a response started producing fun allround boards. 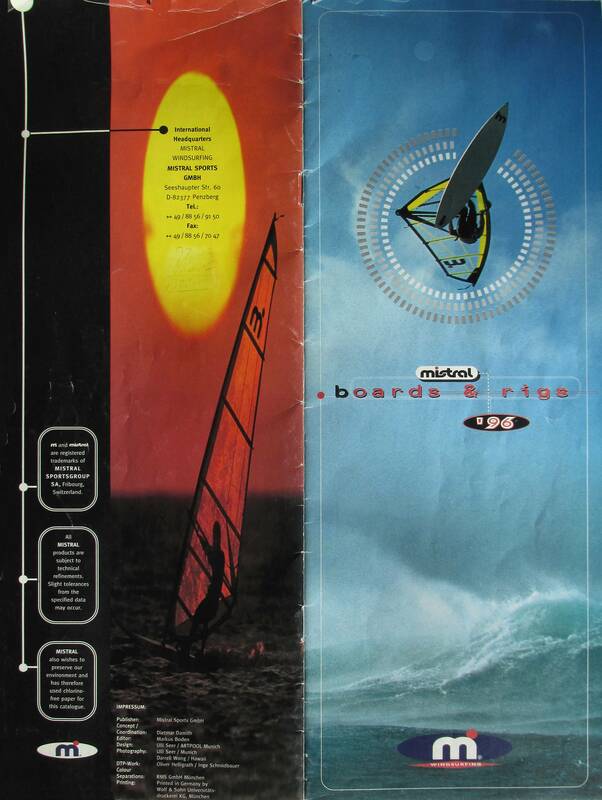 quai-34-1999-catalog-windsurfing-boards : Click &wait to download pdf Because for years the QUAI 34 catalog has been one of the best references for the sport. 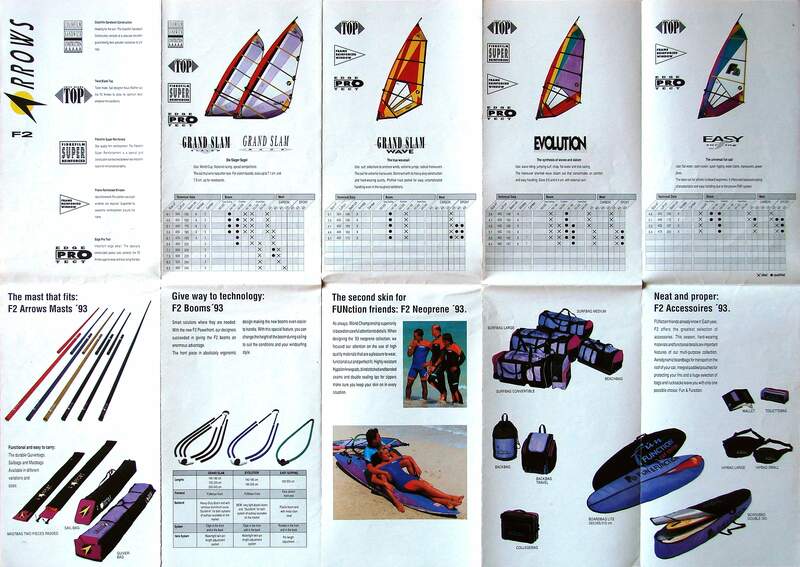 The 1999 catalog was printed in 70.000 copies. I wish you all the best for your 2011 competition programm. 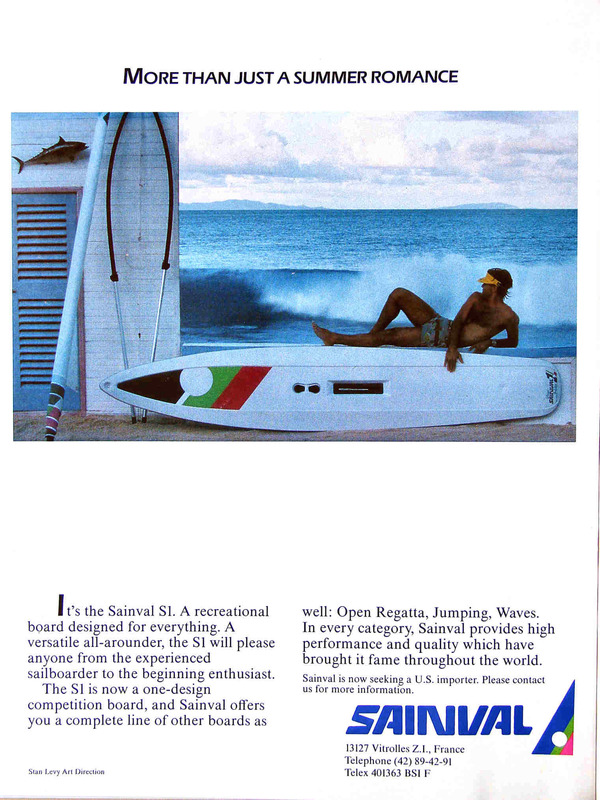 the things you brought back with this article…..half of those brochures were under my pillow….f2, surf partner, pacific, i even had a 3 fin barberis at one time….started at 11 yo with a (wooden boom) windsurfer…..wow……great job man…!!!! This effort was done (and goes on), for us who can appreciate. 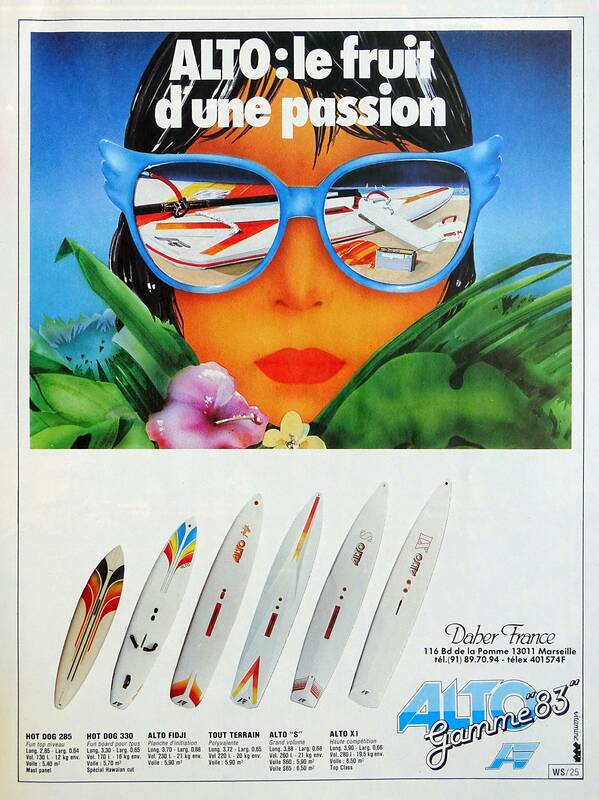 Is there any chance you still sleep on vintage brochures worth sharing? Tough….after 30+ years and 3 house moves…..will keep an eye though….will contact u if anything comes in hand…! Nice to hear I provided reference for a project. 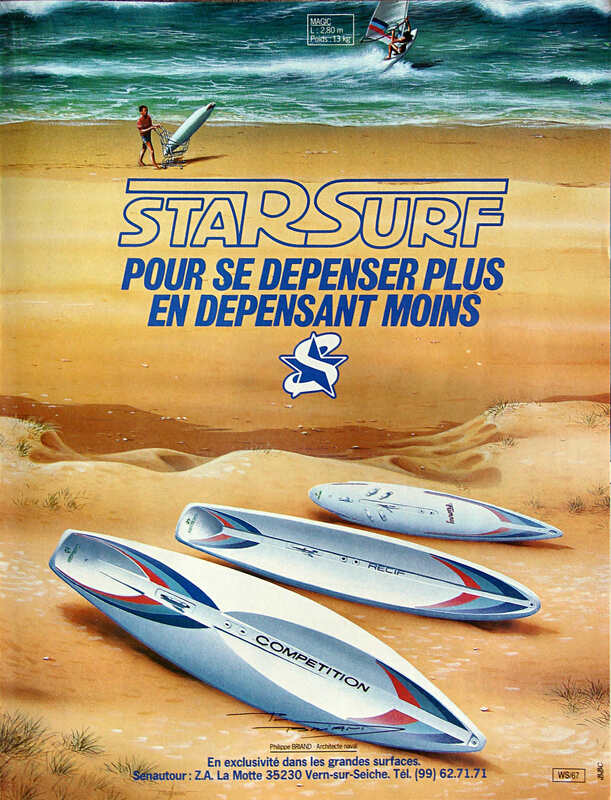 Une sacrée bonne époque avec un max de matos même STAR SURF que j’ai acheté le 1 avril 1980. AUCHAN les avait pendus au plafond, voiles gréées. 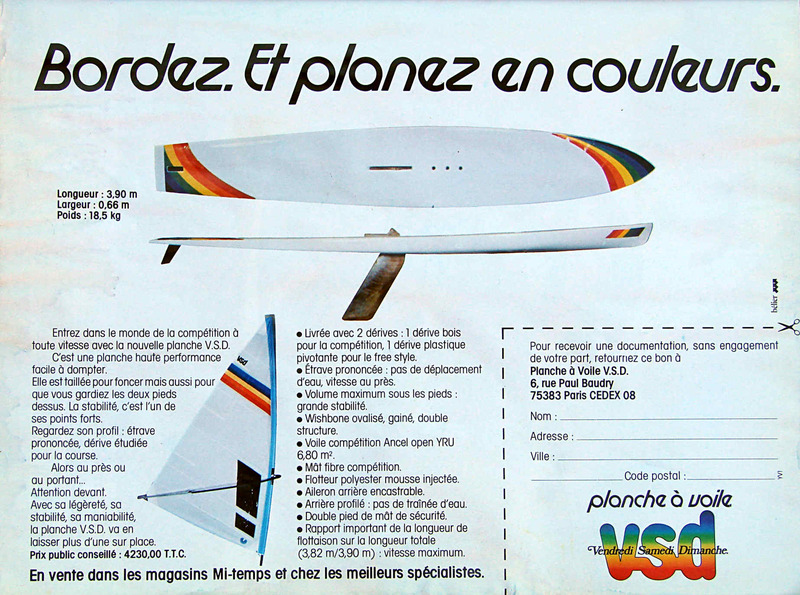 Et la pan am HIFLY, de trés bons souvenirs au lac de VILLENEUVE/RAHO. all right! 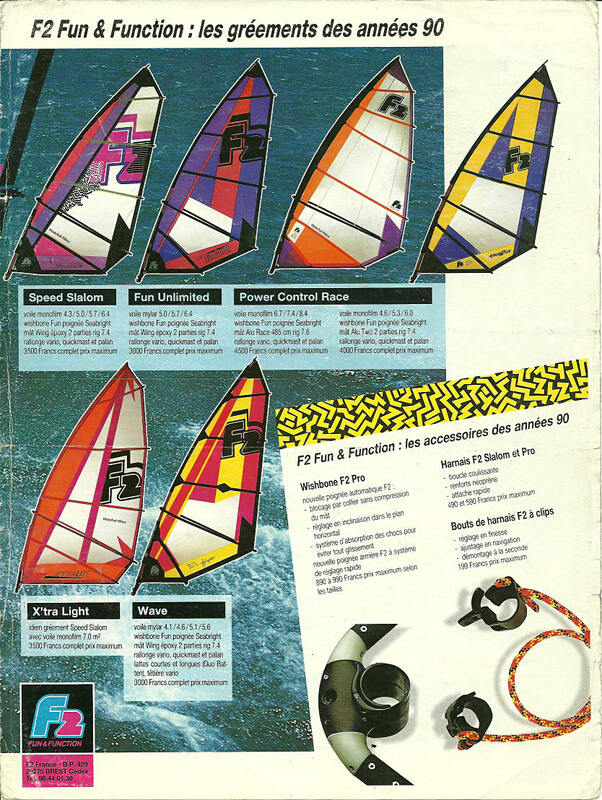 feels like being 12 again, when I started windsurfing. many years are gone now, but still know a lot of this gear! Verry nice, is it also possible with sails? Yes Rob, I have some material and I will show them, maybe on a different post because the existing one has already gone too heavy. 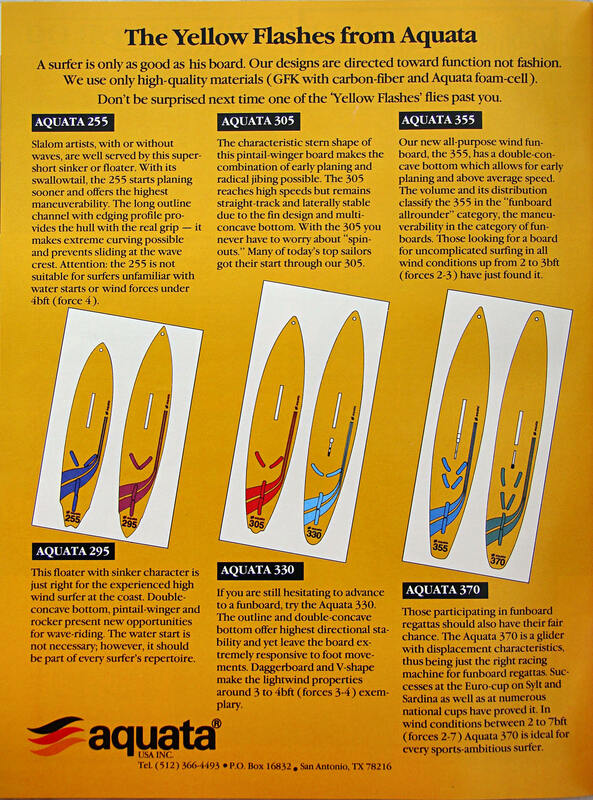 I found your blog while searching for some photos of Aquata boards. 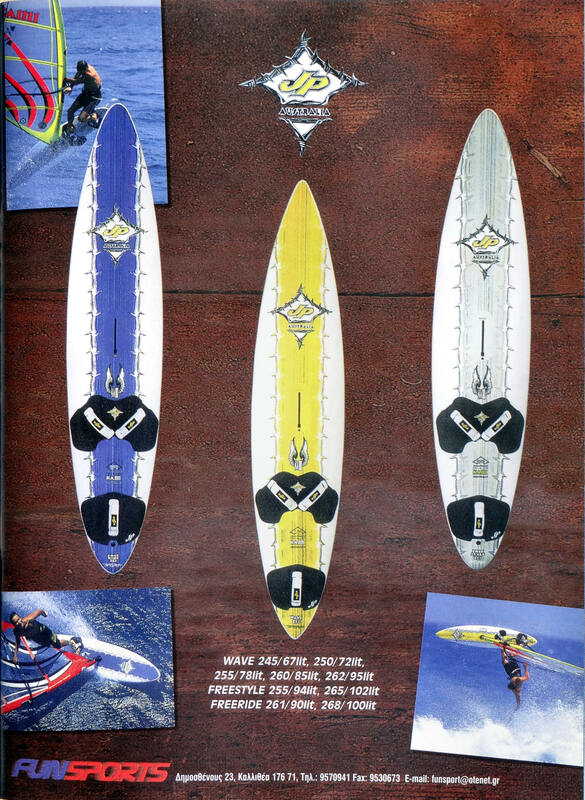 very cool to see my old garda board and sail from the 80’s – still have it and kids use it weekly… is and american brochure available for the mistral garda and equiptment from this time? Using nowdays vintage equipment is a very special pleasure. No apart from the posted Greek ad, I don’t think I have more Garda stuff. Wow!! Brings back memories!! 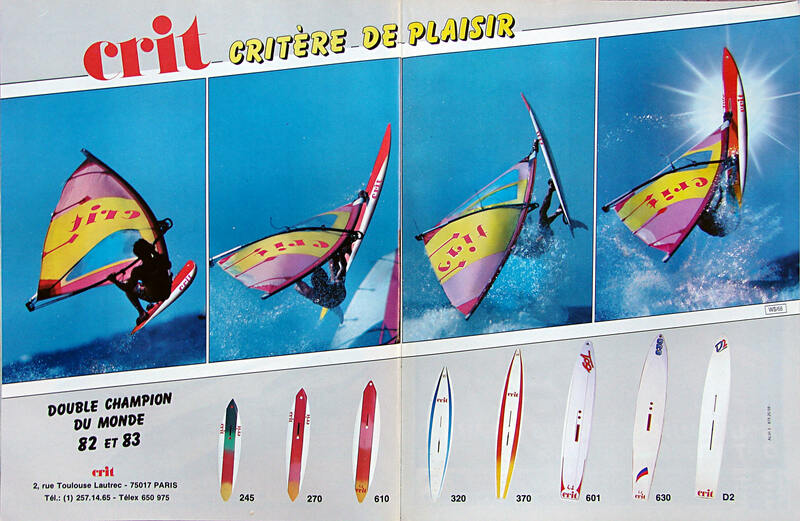 I started windsurfing in 1983 when I was 7 years old with my dad’s Mistral Competition Light and a 6m on a lake! Just looking at the old brochures it brings back loads of memories! 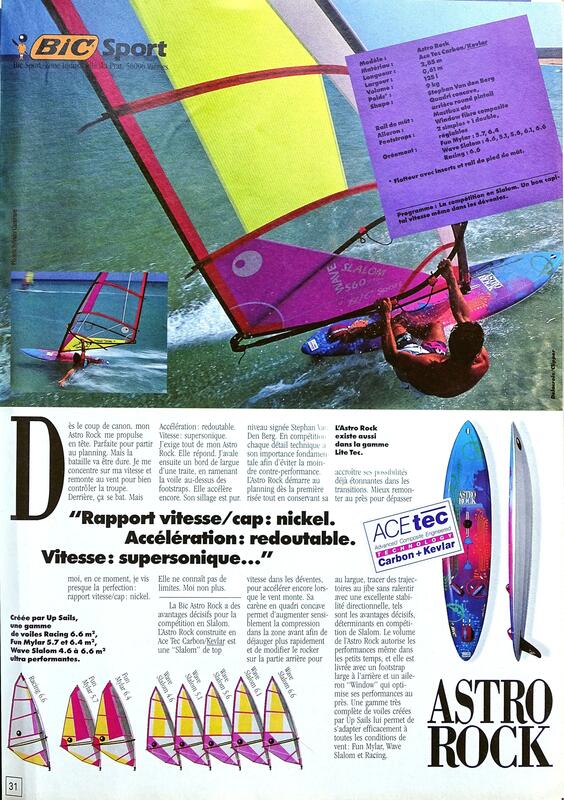 I windsurf competitively in my teens and had boards from Mistral, Cobra, F2, Bic and AHD with sails from Neilpryde! Terrific archive! 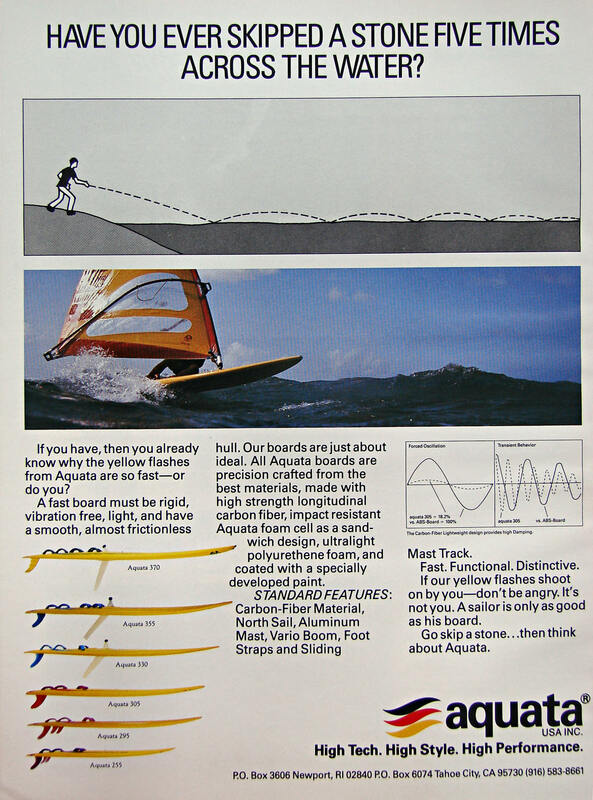 I’ve been trying to find any documentation of my first board, it was called a Sailboard Free, there was also a Sailboard Fun circa 1978-1980? 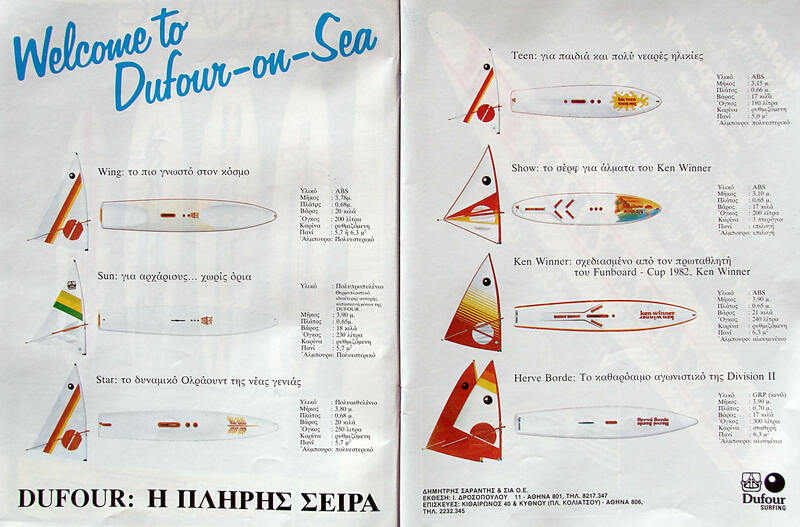 Predecessors I think to the above Sailboard ad. I have personal pics of me on it but have no printed material, would love to read the adverts for them. Sorry Rafael, but I have nothing from those early days. 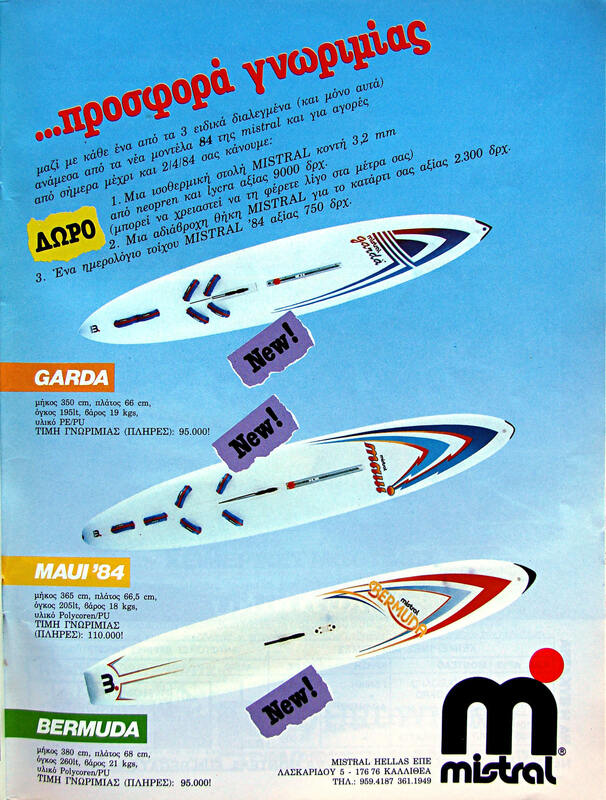 I made my first steps in 1979 with a board I did not chose myself and it took me a year to start shopping around, while the only Greek magazine covering the sport came out in 1981. 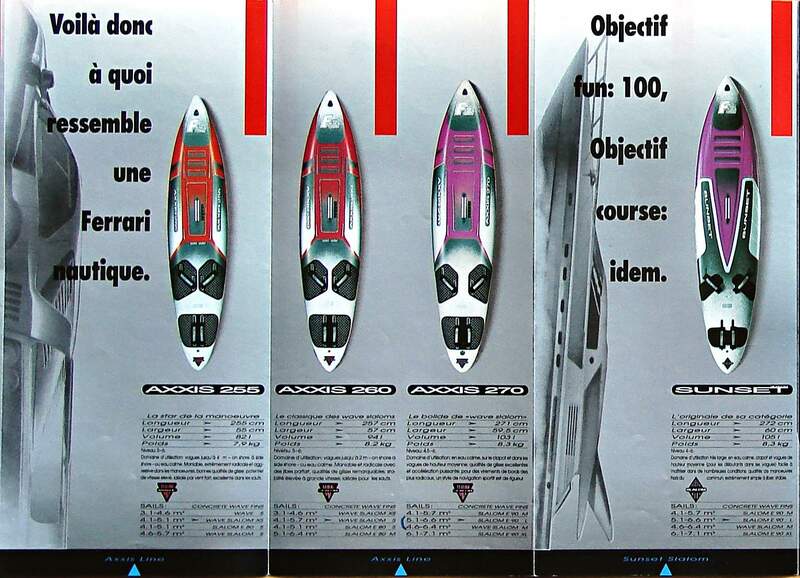 I have started on a Bic Jaz then I bought an Oceanis V270 ( world production speed champion) and then one of my favourite the TIGA 260 Slalom and Tiga WAVE. 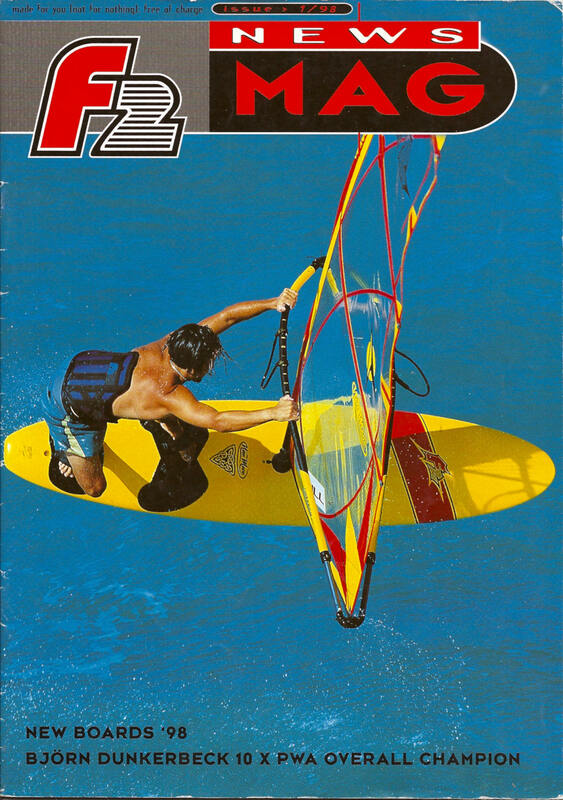 Now I have the Tabou pocket wave and have started kitesurfing. 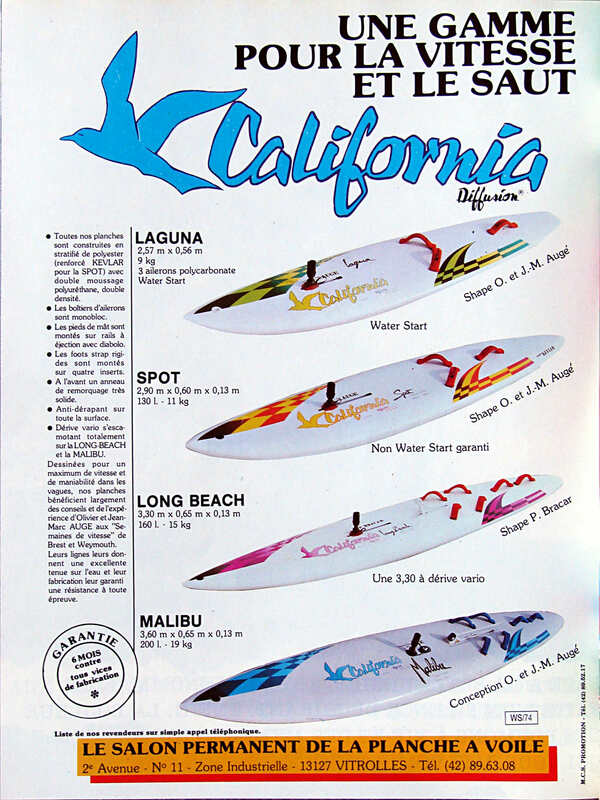 Sorry I don’t have brochures of more recent boards. My intention was to keep alive memories of brands no longer around and items produced at a time that filing & archiving was hard and expensive. I cannot find any excuses for companies still active, not to have fully documented archives from ~2000 on, since all the material was produced in digital form. This is a demand by all the customers who honoured those brands and their products and is also an indication how much these companies respect their history. WOW this is awesome collection! I was hoping you can check if you have something about Mistral RTX & Mistral MTX (Race and Freerace boards) from year 2002. Sorry no 1999 material available. Maybe in the future if I get a contribution. 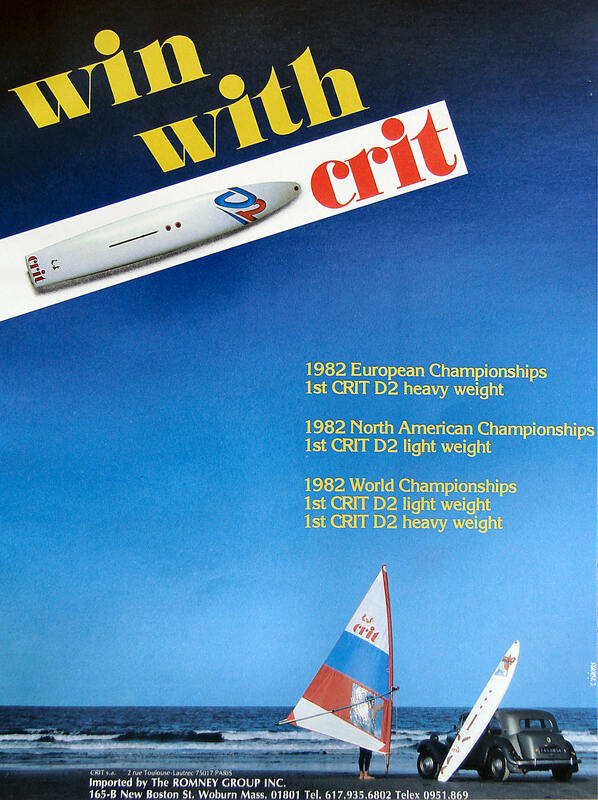 Sorry I was not exact , I meant 1988 and 1989 brochures not 1998. I have a mint condition (for her 20+ years) lightning, but I don’t know the exact make year, very similar to the 1990 graphics though. 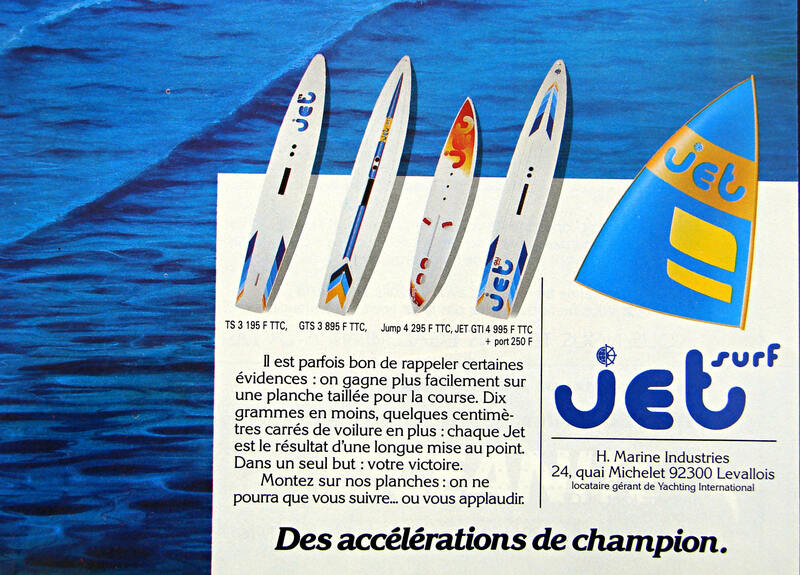 I love these old pics and brochures, iIt makes me remember of the past when i was a child. Thanks a lot for this stuff!!! 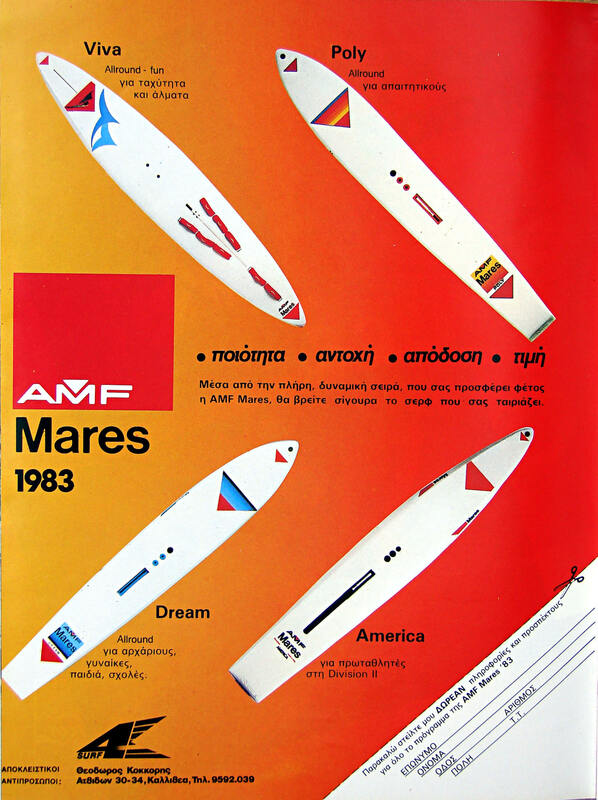 It has been a great pleausre to discover the original advertising of my first board: 1983’s AMF Mares “Poly”. 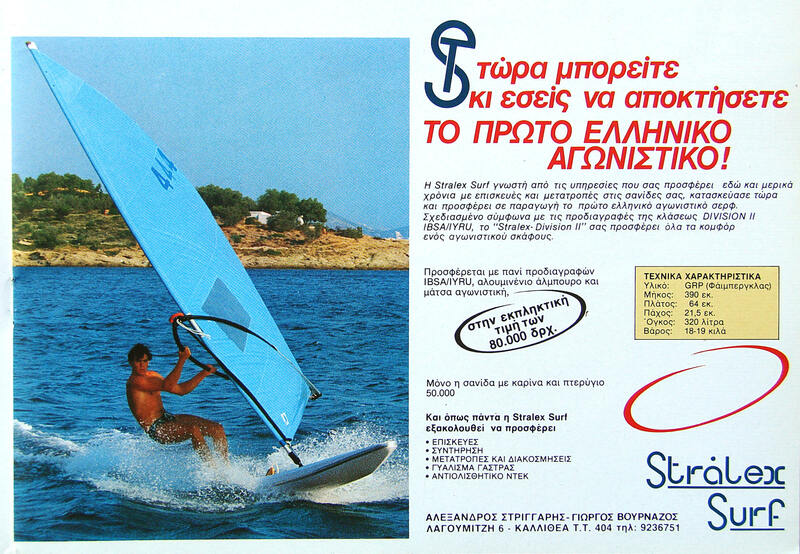 I like your windsurfing site and I will explore it when I return to Athens, with proper internet. 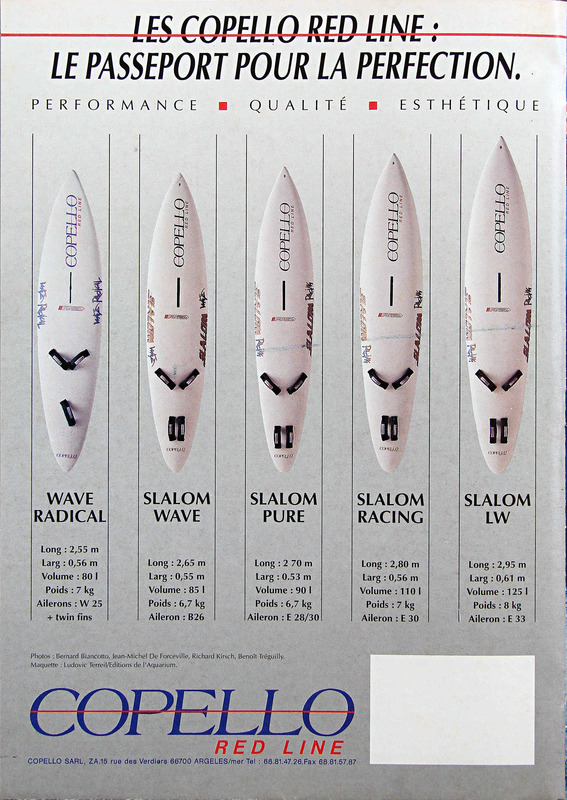 It is an all-around board made of PE, L: 2.80m W: 0.69m Volume: 220l Weight: 19kgs, expected to be used for learning & leisure under mild conditions -up to 4 Bft, therefore I would expect it to be riged with 5 – 5.5m sail. Fist included to my lists in 1985. Find some old school riders around to advise you. 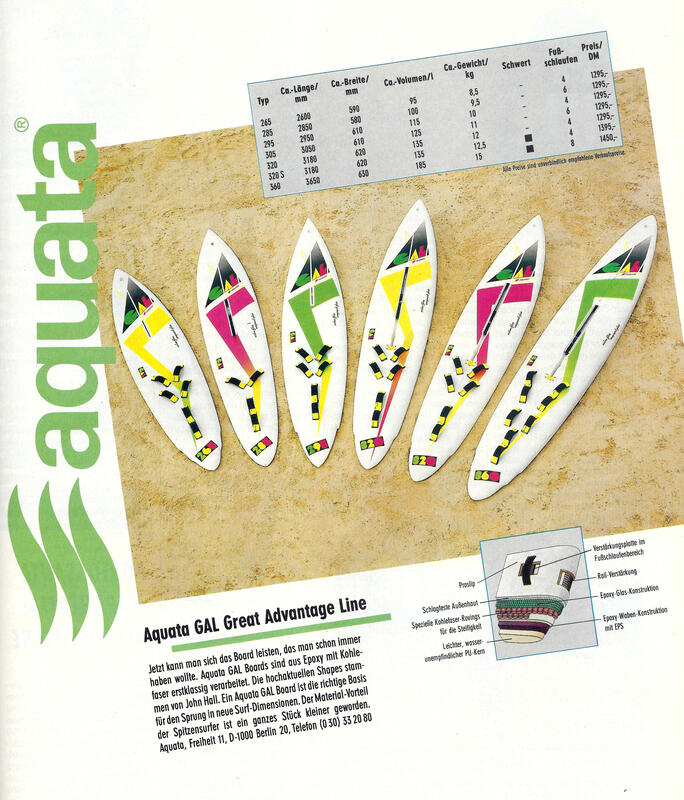 Lots of memories; great to see a brochure for Aquata! 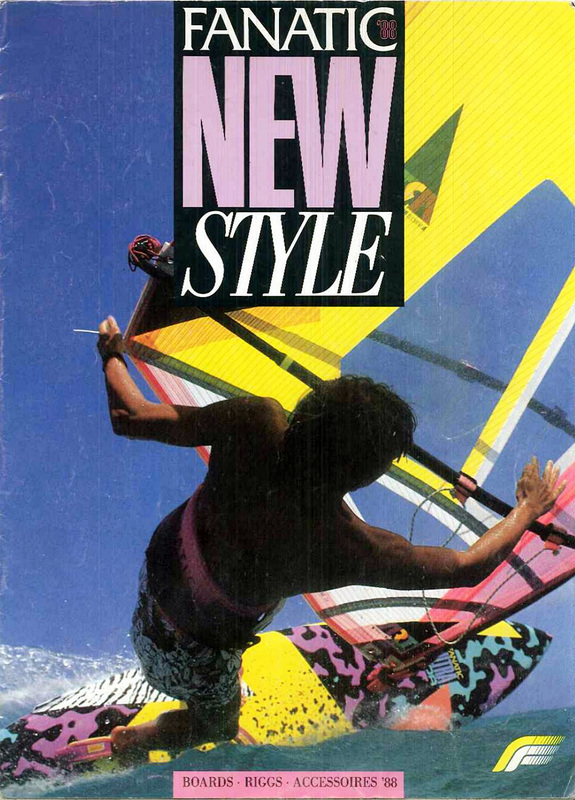 I should still have a stack of early 80s windsurf magazines at home in Italy. 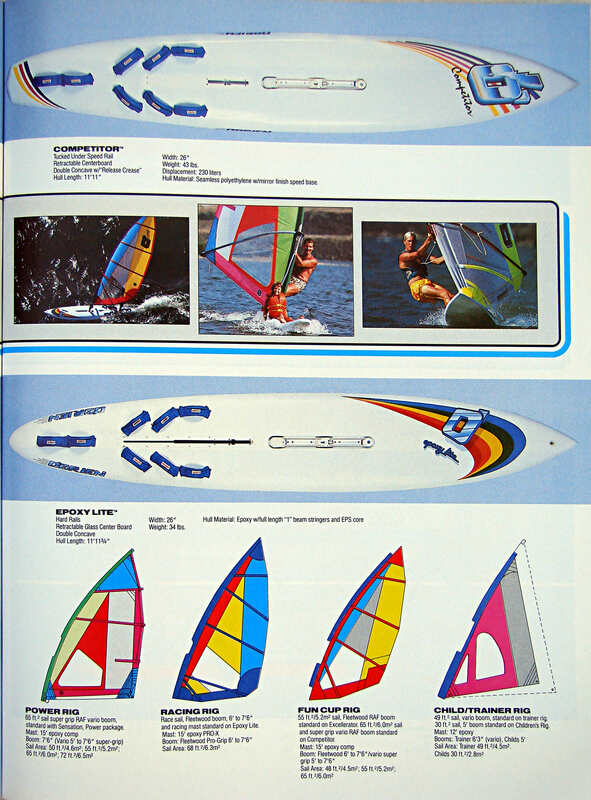 this is a great overview and remembers me on my beginnings of windsurfing. 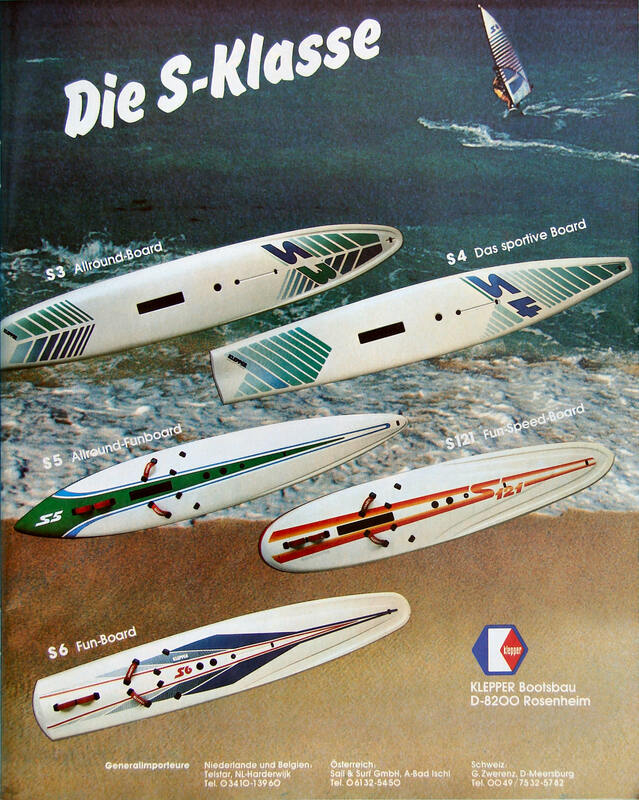 Started with Kneissl Regatta, then follows Sailboard 335A, after that Mistral Diamond Head and now I use an old custom made board of a no name shop that closed a few years later . But the board is running as fast as in 1985. 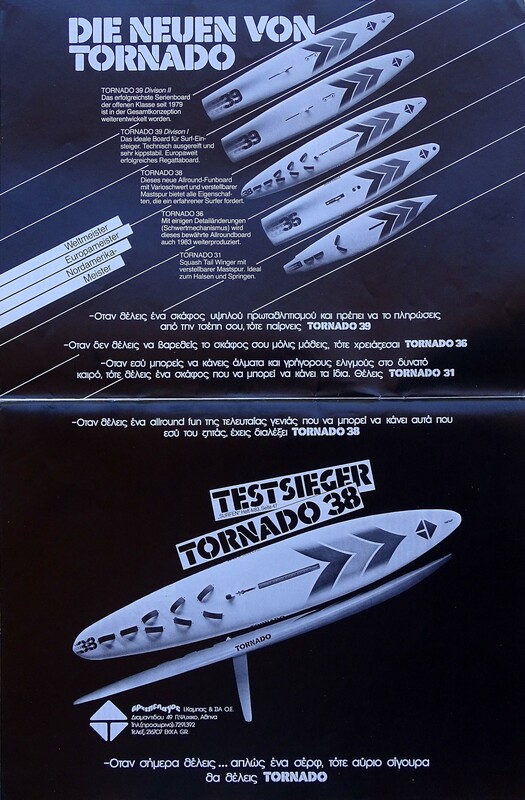 I remember a lot of boards I’d tested like Klepper, F2 Sunset slalom, Mistral Malibu, TenCate Spacer. 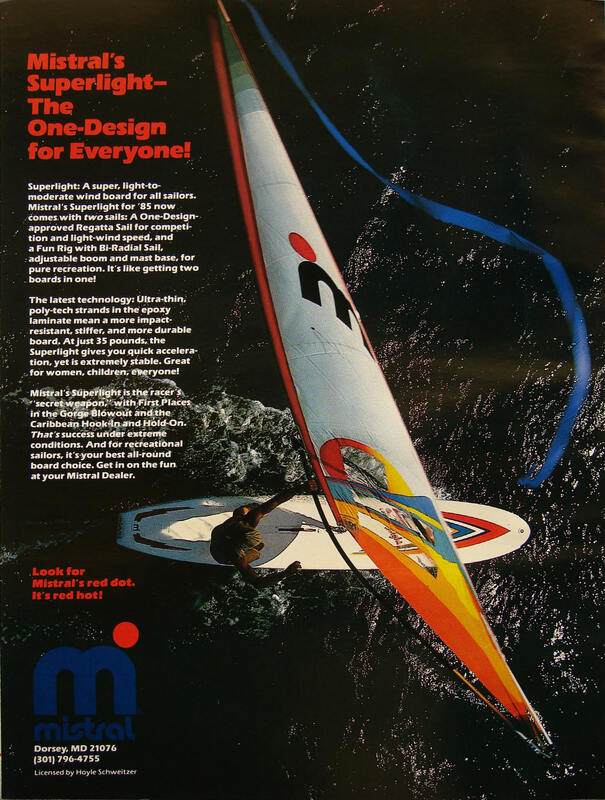 I own another old Mistral Brochure. Are you interested to add it to your collection? I will do it with pleasure Norbert. Just send it to my e-mail address. 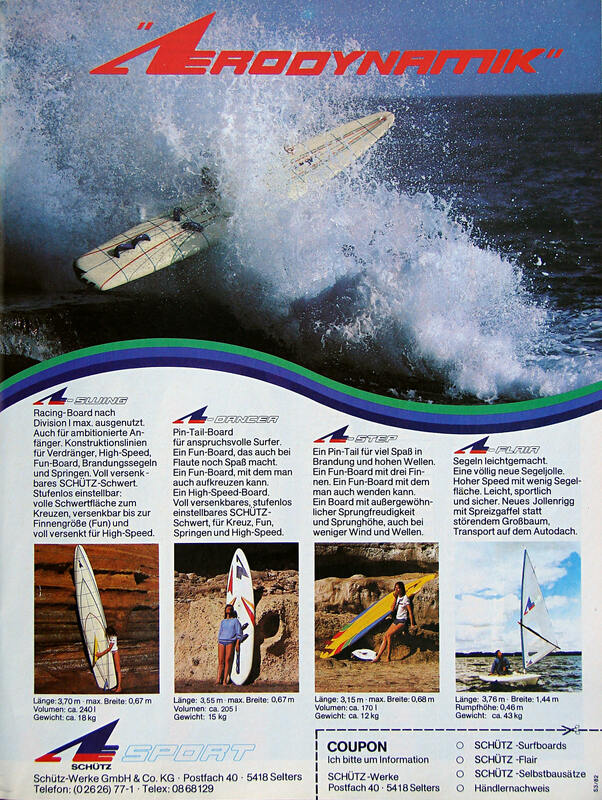 Any foto you may have of the Kneissl Regatta is also welcome, as this is the first time I hear the brand. Thanks for this great trip down memory lane! Wow, this is amazing I am not that nostalgic, but I do get emotional seeing this. 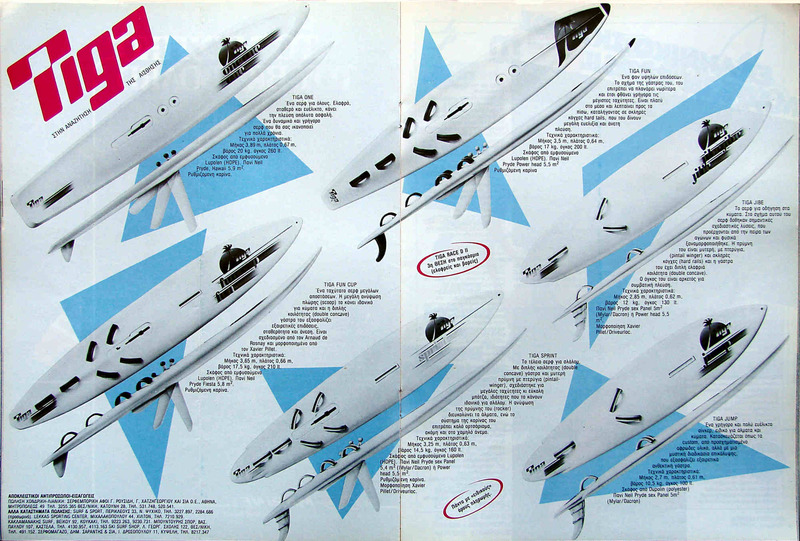 When possible, please help to find the 1984 Klepper brochure (with the s206 and s207 and others). Preferably in dutch, but english is great as well ! Hi Bart, I will try my best. 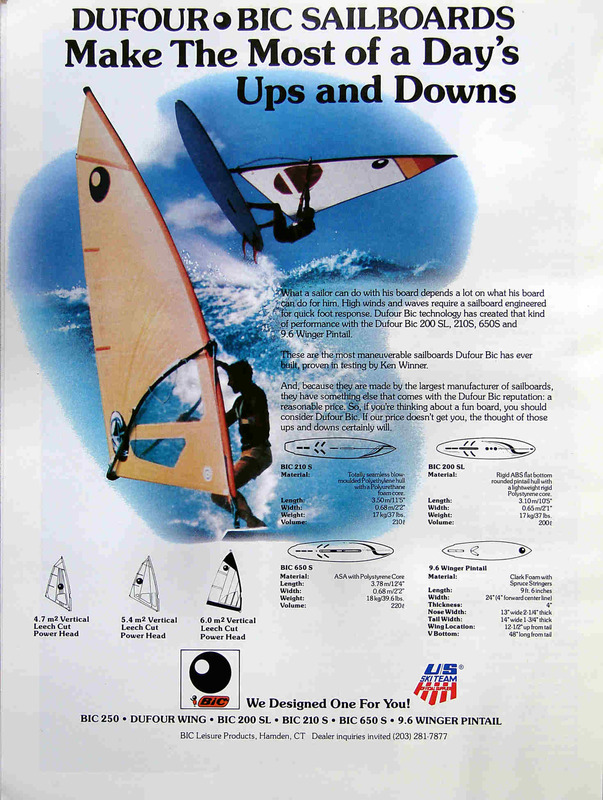 …many, many thanks from Italy: at least I have seen again my old Sailboard Race, mythic division II boat; if possible can you find also ads about my others surf? 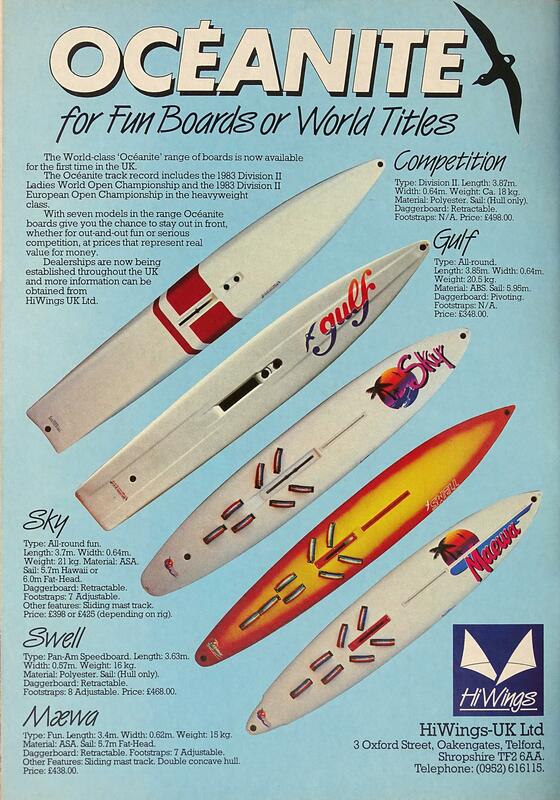 They were always Sailboard, the Grand Prix for div.I and Fun (shortboard). I will keep your request in mind when I dig again into the vintage archives. Do you remember the year of production? surf partner? Are you sure Brad you are talking about a Mistral? cheers guys, i just got the greatest flashback! the f2 comet, my first planning! 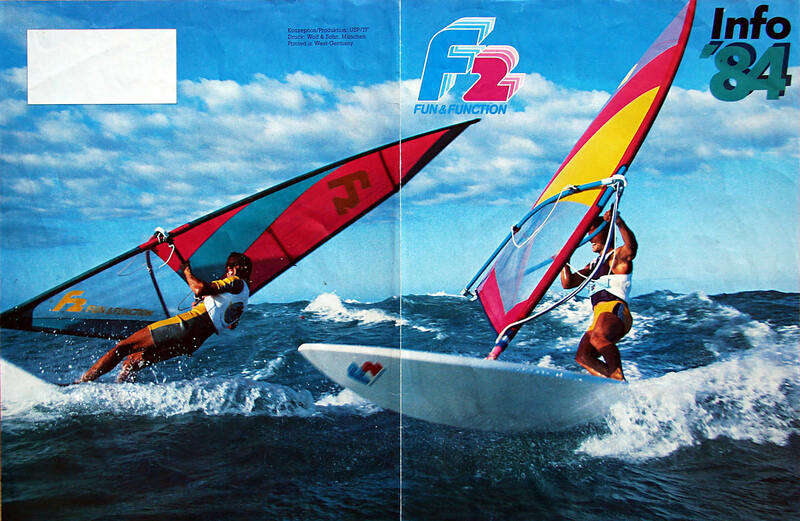 I’m selling my 1985 Fanatic Fox Light Wind 370, finally! Thanks for the memories! thanks for the memories. 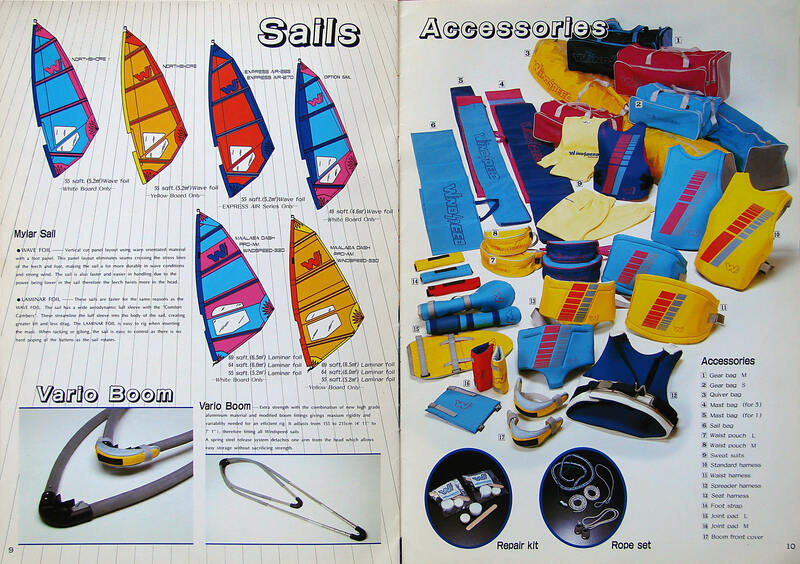 God we used to spend our cash on a lot of crap kit back in the old days. 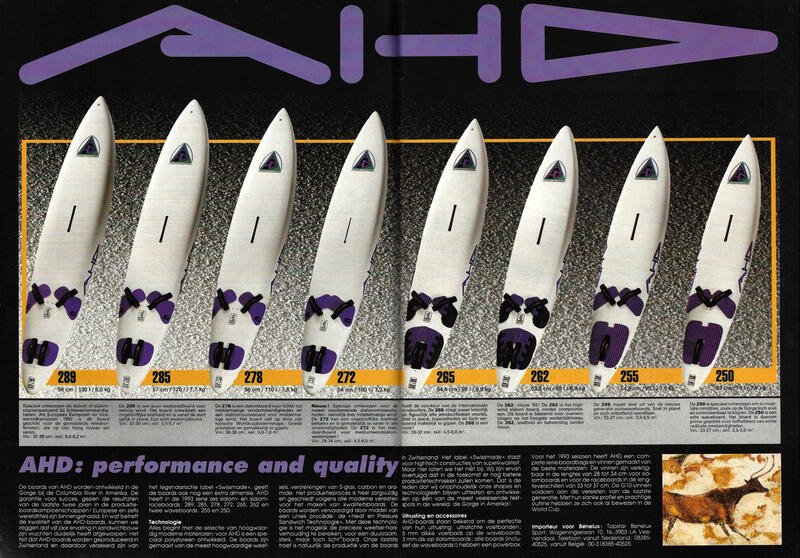 Just goes to show that the manufacturers were just shooting in the wind literally with design, and had no idea what would work, they just went with a trend. 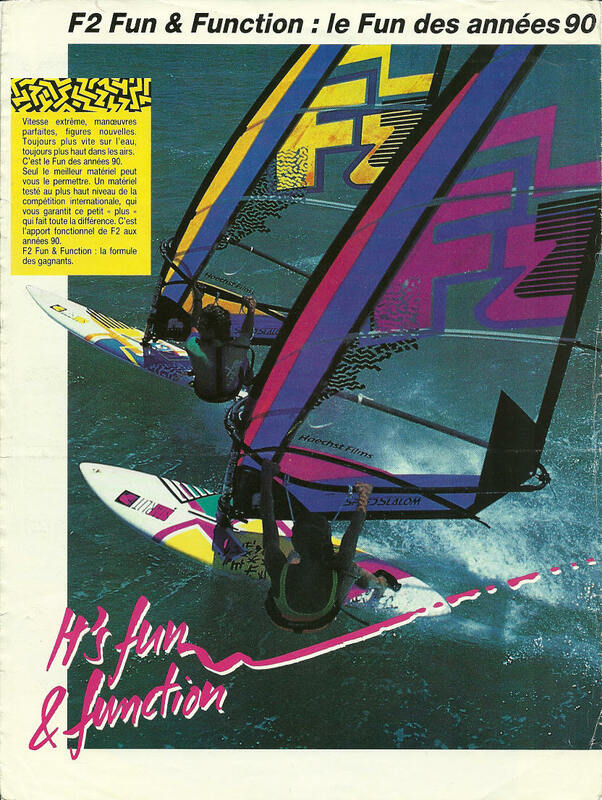 Having said that, would love to sail a Div 2 board or a windsurfer regatta again in a force 3 in the mediteranean, there was something simple and refreshing about windsurfing then. Unfortunately the wind was not strong enough these days, but we look forward to the next event. By the way I like your Environmental portraits especially the subway ones. Hi have you got any info on old Wayler boards? I am after the volume and a bit of history on them. I have one in fairly good condition and I love it. 3.8m long, I am able to send a pic if you like. 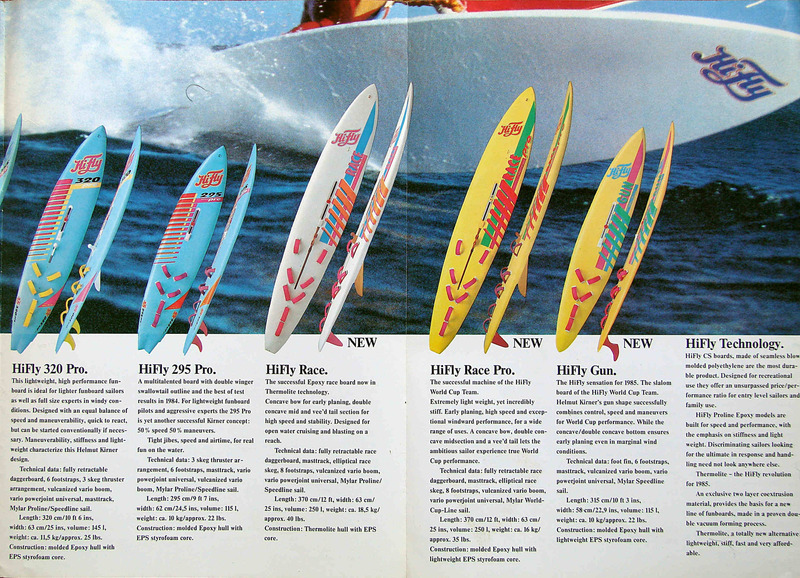 I also have a TC Spacer and a HiFly 500, also really nice boards to use, all are in original perfect condition. 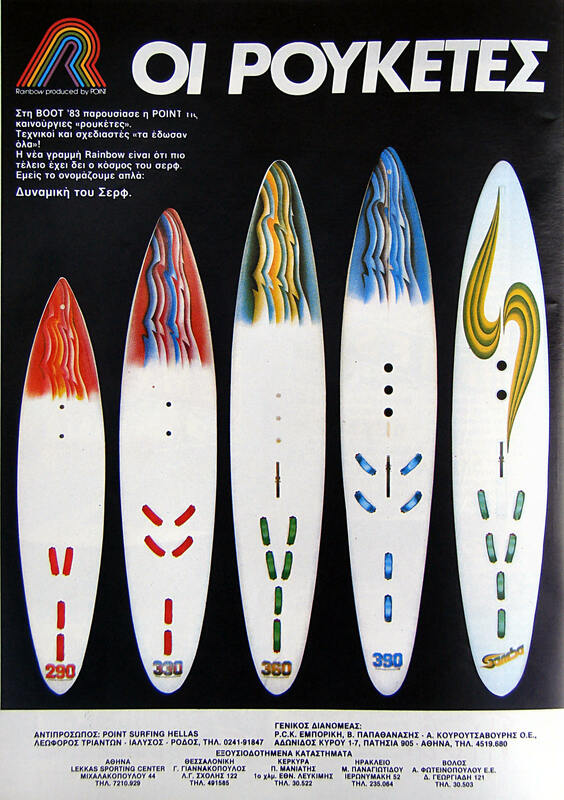 I’m glad you still enjoy this nice collection of vintage boards. Unfortunately I have no more material on the Waylers. 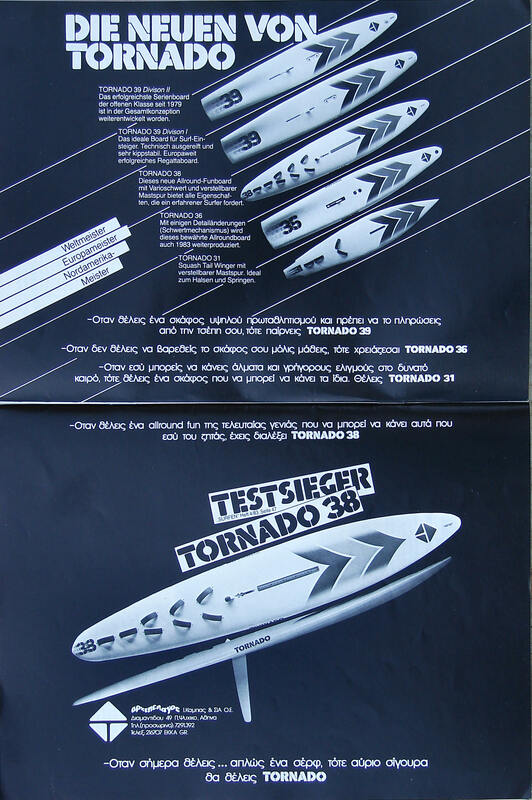 Really good memories from looking through these brochures. 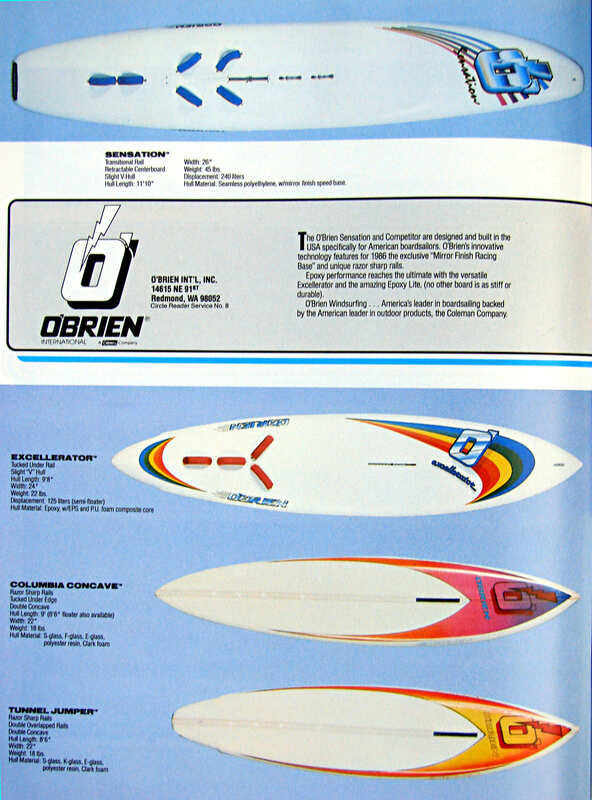 I bought a “Windsurfer” new in 1984 and was taught on this board…..then later I bought a Windurfer Rocket 99. 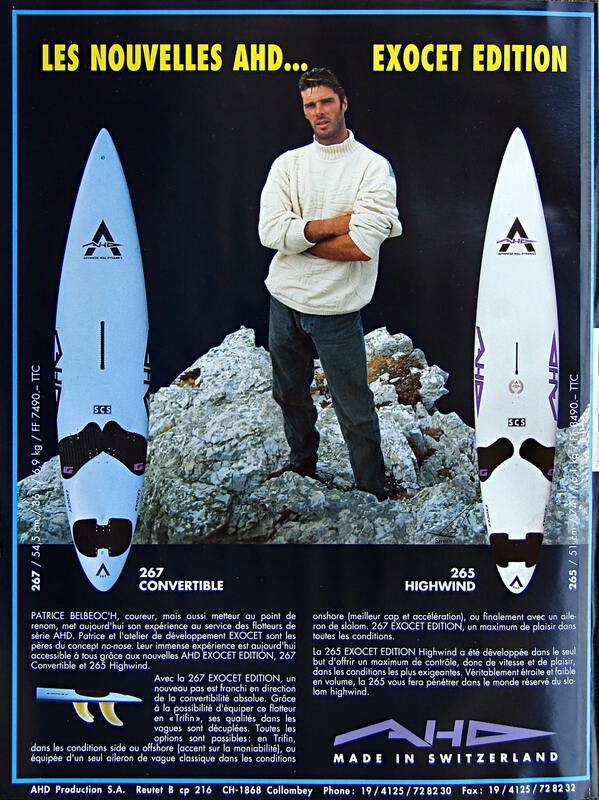 My origional longboard “Windurfer” lasted 26 years until I became brave again and jumped over a wave at Yzerfontein on the West Coast of SA which broke the board in 2. 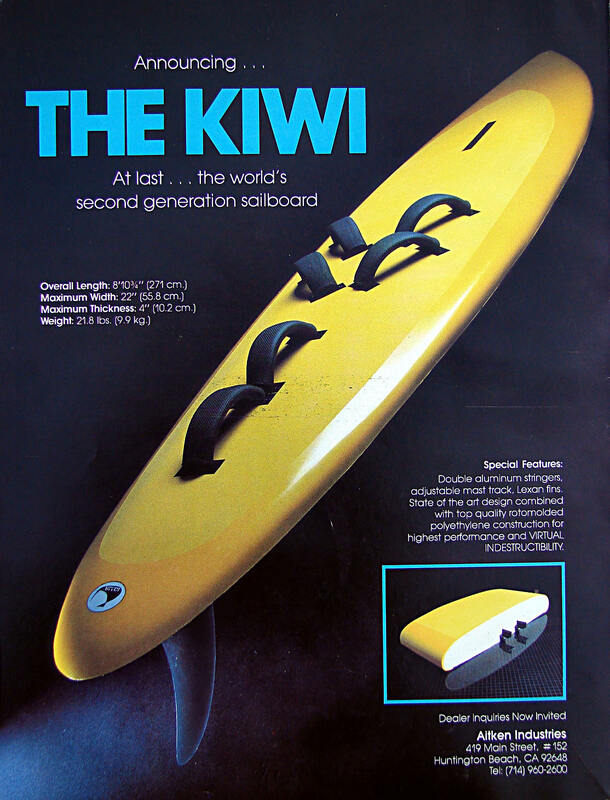 I was so sad losing this board after 26 years. 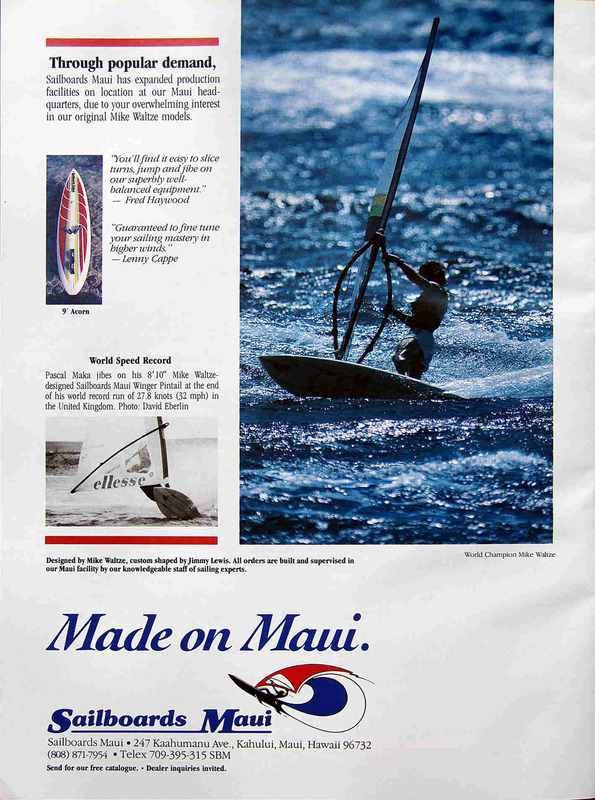 Recently I bought a Wayler windsurfer second hand still in very good condition and my 15 year old son is now very eager to start learning. Cannot wait for the December holidays to go out to the West Coast again. 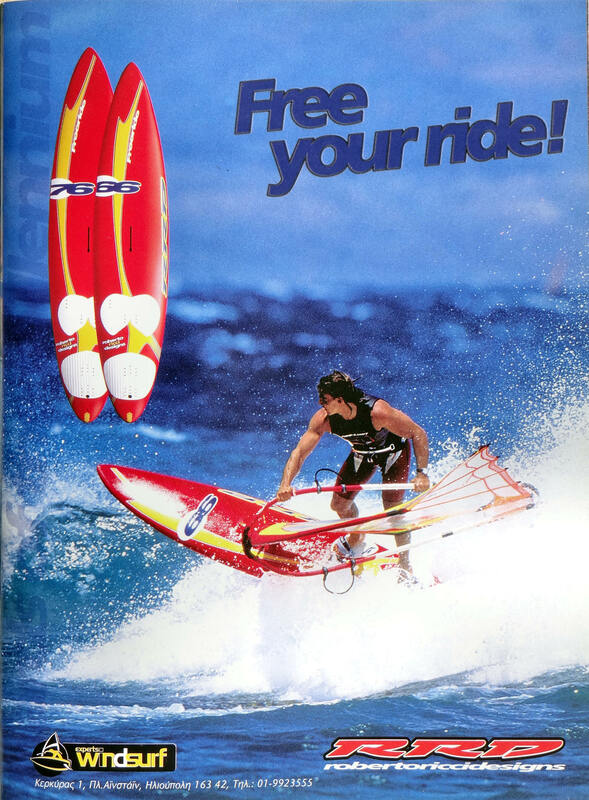 Honored ending for your “Winsurfer” Herman. 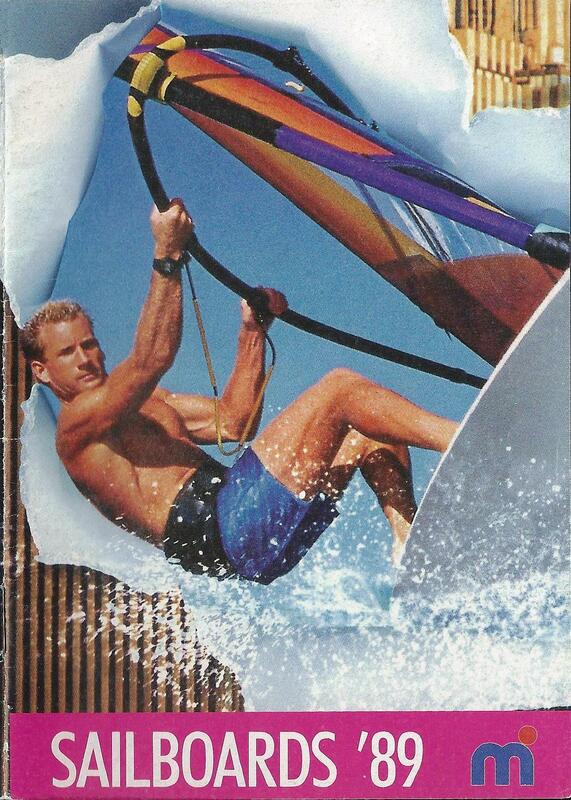 I wish you & your son some marvelous windsurfing holidays. 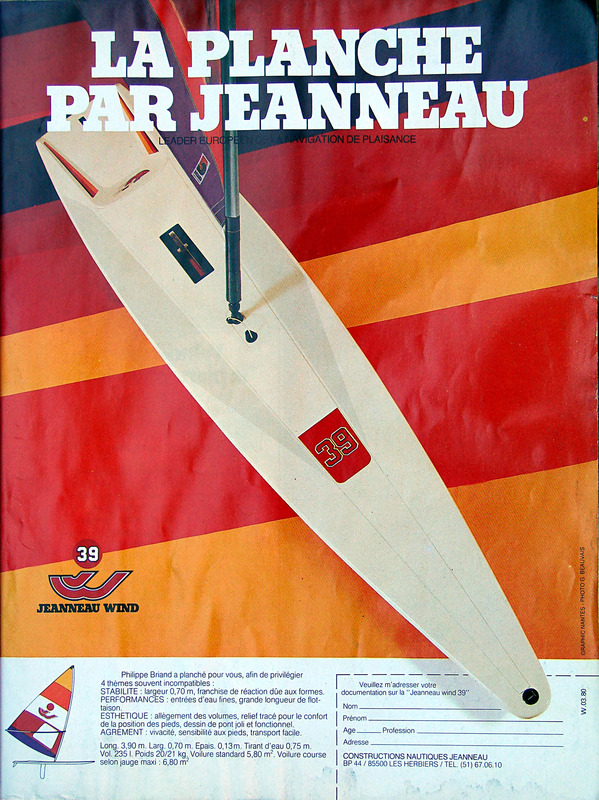 Hi There, Wow your a real historian when it comes to vintage windsurfing. 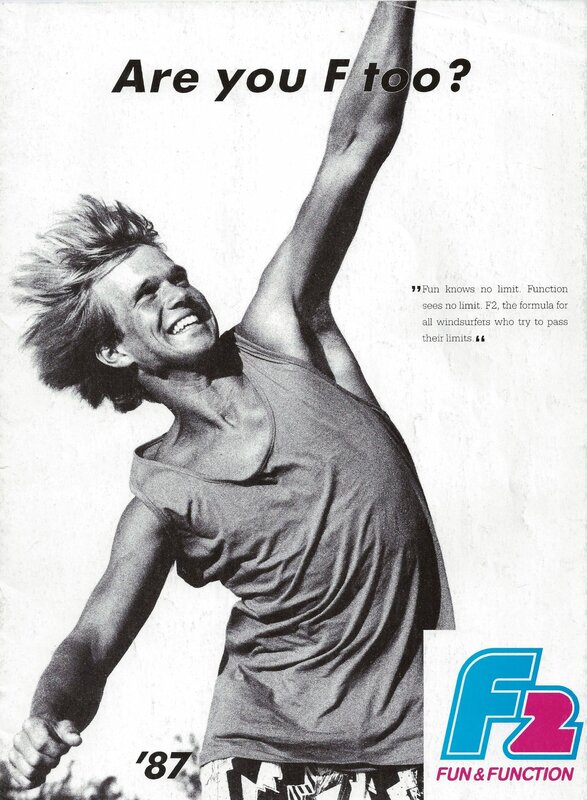 Loved looking at the old ads. I have just started collecting a bit of vintage gear. 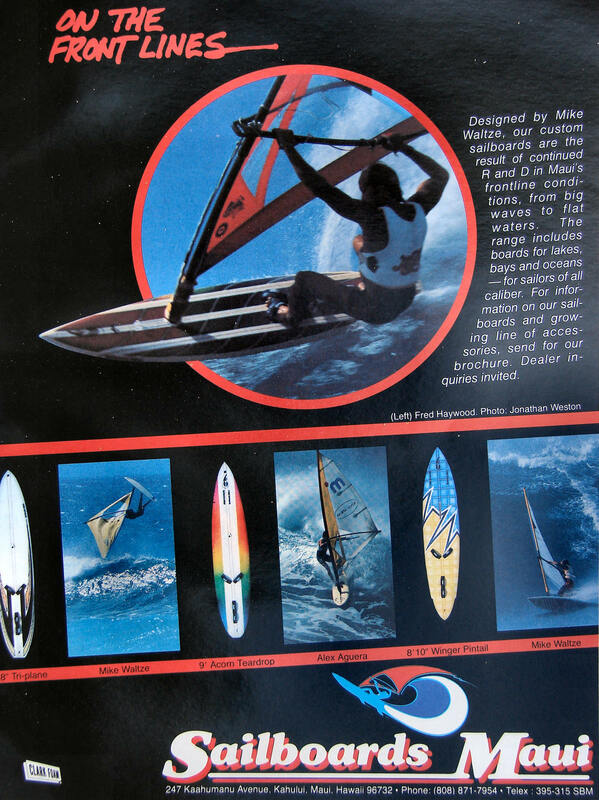 I have an old windsurfer one design and just picked up a Wayler YPSI in good condition. I found this link while trying to get a part for my Wayler Mast Post. Well done to you the work you are doing, it is terrific. Best wishes from Australia. Thanks Craig for your words of appreciation. I’m sure you will enjoy your vintage gear. hy wasnt there an alpha phantom in circa 81 82 love the crit that was one of my boards but i realy want to see the alfa? alpha phantom thank you. 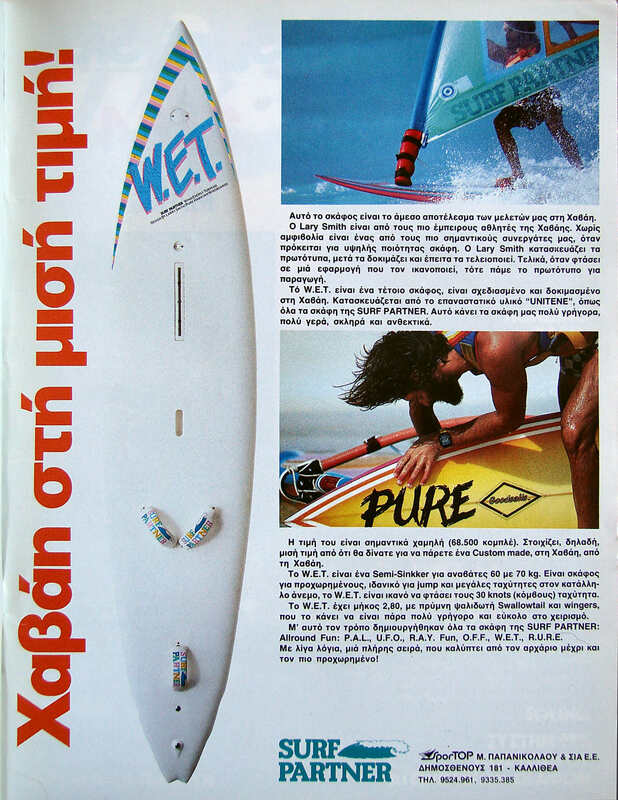 uri san francisco used to surf in israel. Thanks for the message. Although I had prepared Alpha 1983 & 1994 material to post, I neglected to do it. Check the post. 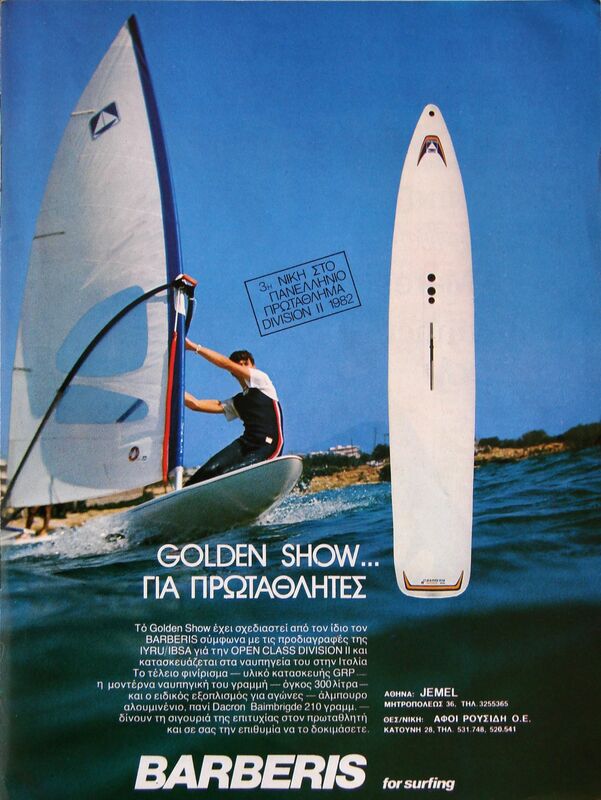 I included the Greek 1981 Alpha range presentation, which unfortunately has poor photos. Second post now. I just sold my old Wayler and TC spacer and picked up a BIC Metal Rock (139lt) really good condition, also on loan to me is a F2 Sputnik 285 (115lt) what are your thoughts on these boards? Have a great Christmas and New Years, from Brisbane Australia. Definitely you moved to the Funboard class Damien. 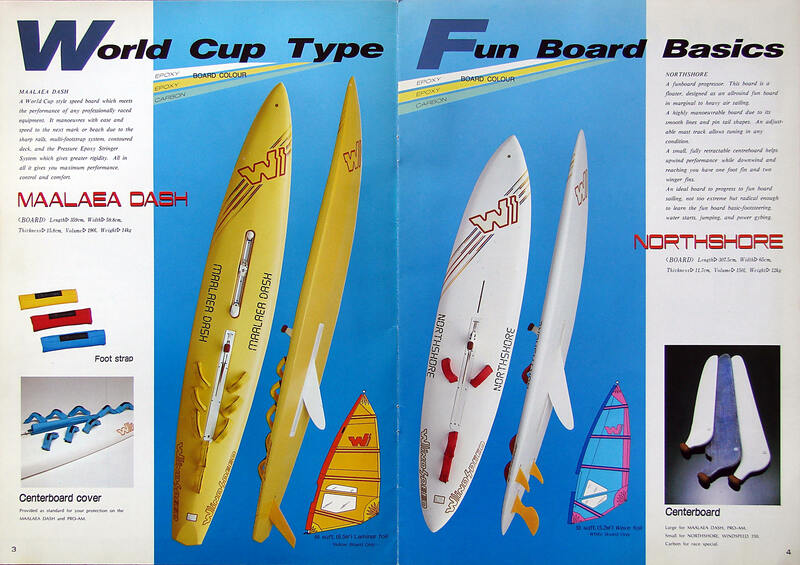 Both boards were very successful shapes and you will greatly enjoy them. 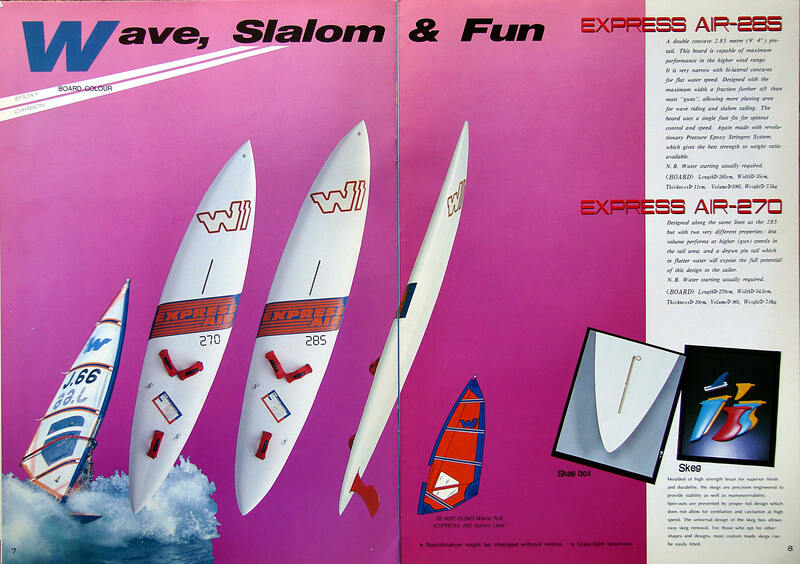 One smaller wave fun/wave oriented board would complete your rides range if you sail in areas with some waves. Let us have some feedback. Just realised the F2 Sputnik 285 I have on loan to me is the World Cup Edition. I am yet to try the F2, but the BIC Metal Rock is an amazingly fast board. Almost instantly on the plane in 15knot winds with a 4m2 Wave Sail. Thanks for a great site, BTW is there a Part 2 for this site as this is only Part 1? It is in the same post, but starts again alphabetically , because I didn’t want to re arange the already posted material. Hi, have someone who has an old Wind Speed, he is after some info. I have ample photos and will be getting a copy of the original manual for it too. Can I send you the pics please. Where do I find your email address? Great site. 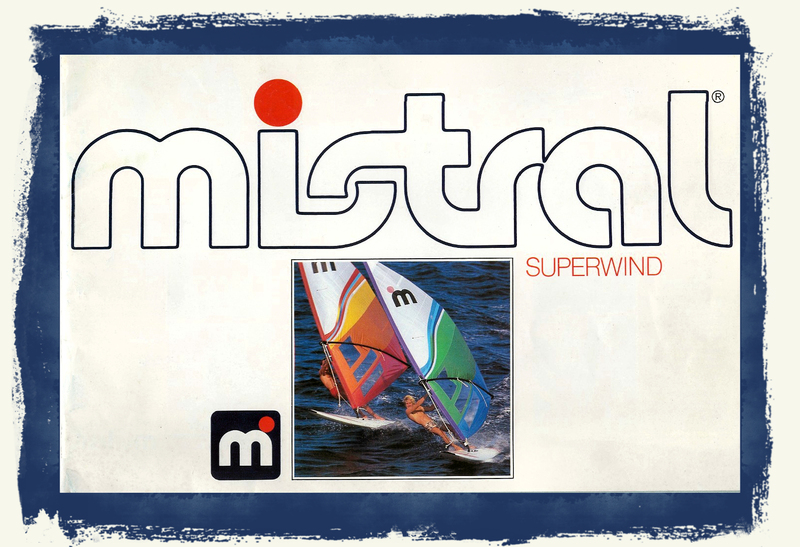 I started windsurfing in 1980 and still have my Mistral Superlite, Malibu and my very special Cobra 290 carbon fibre, one of the firsts to have carbon fibre. 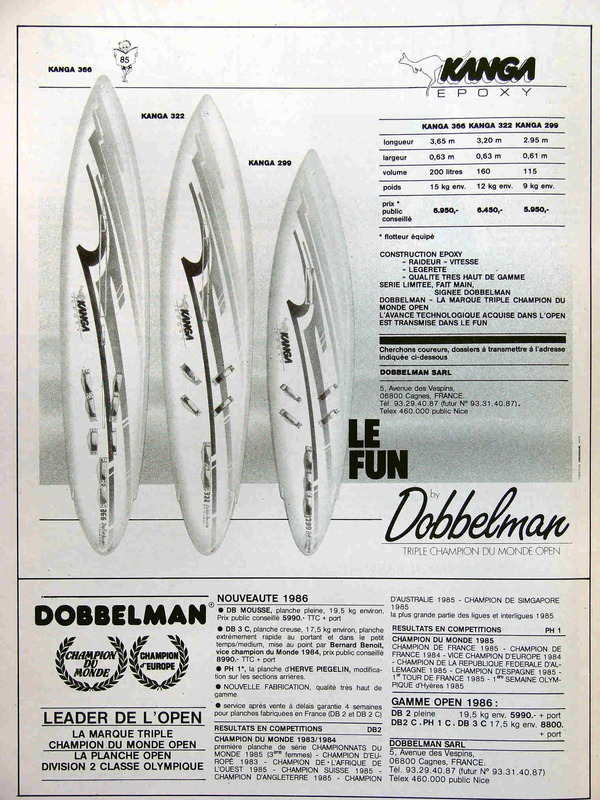 If anybody knows how to get parts for the Malibu daggerboard would be much appreciated. Ciao from ITALY. Very nice site, good memories!!!! 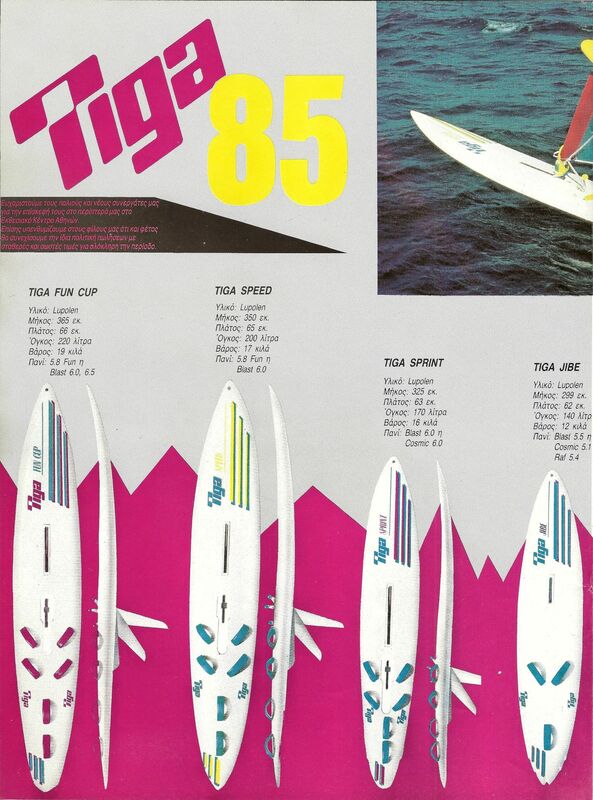 Fantastic the good old days the F2 the Tiga, the sinfull i only miss the Bic Show with the three fins – my first funboard !!!! OK,I know what you mean, but stepping on a board and go blasting makes me feel great. 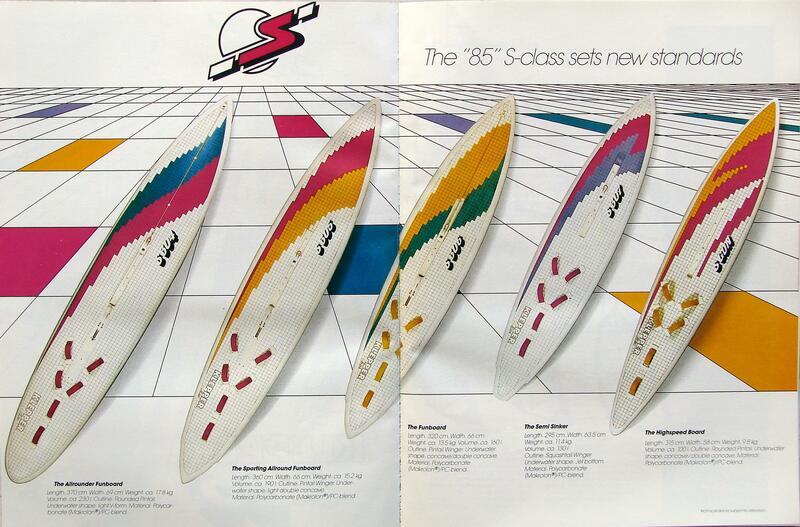 I had a 1984 F2 Comet and your old brochures have made memories come flooding back. 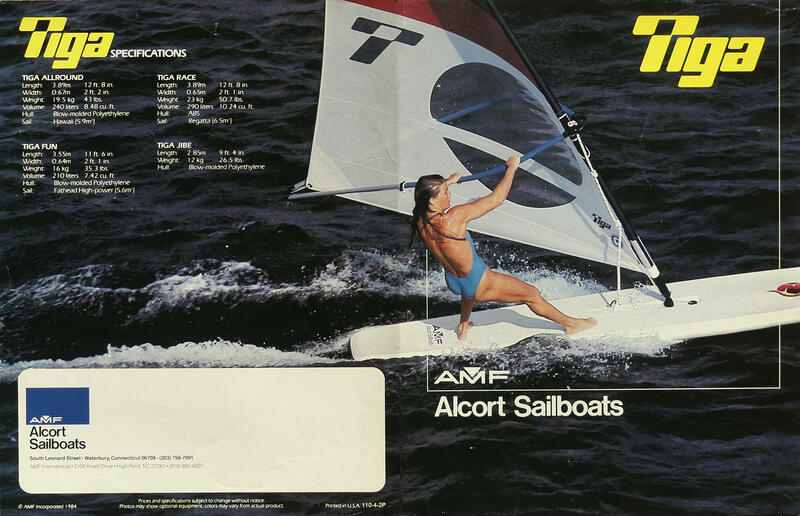 Look at the old sails, monster booms and pictures of everyone enjoying the sport, not like nowadays where windsurfing is aimed at wave sailing. Congratulations for the acquisition of the S5. This is a very special board. 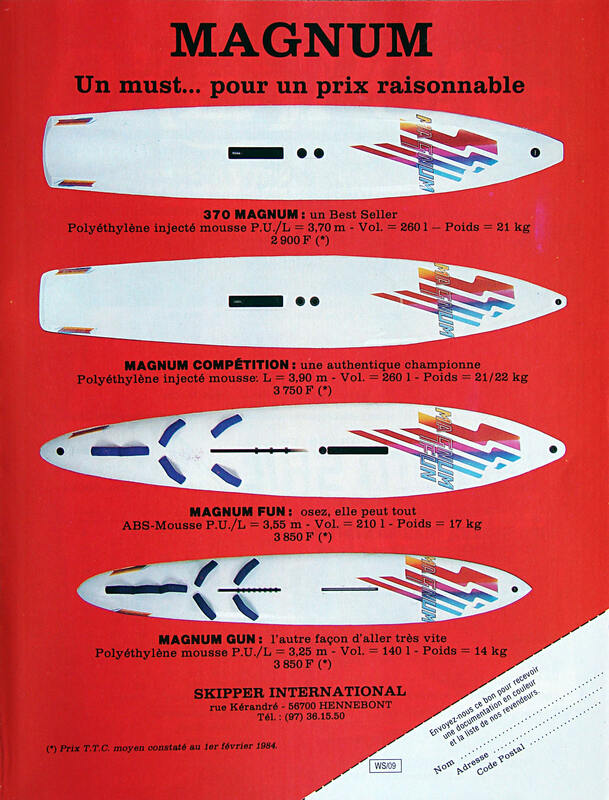 Back then, most production boards were more like the S3 & S4, while such a pintail/missile bow shaped board & fitted with footstraps, was definitely exotic. Do you have the dagger-board and in what conditions do you plan to sail it? 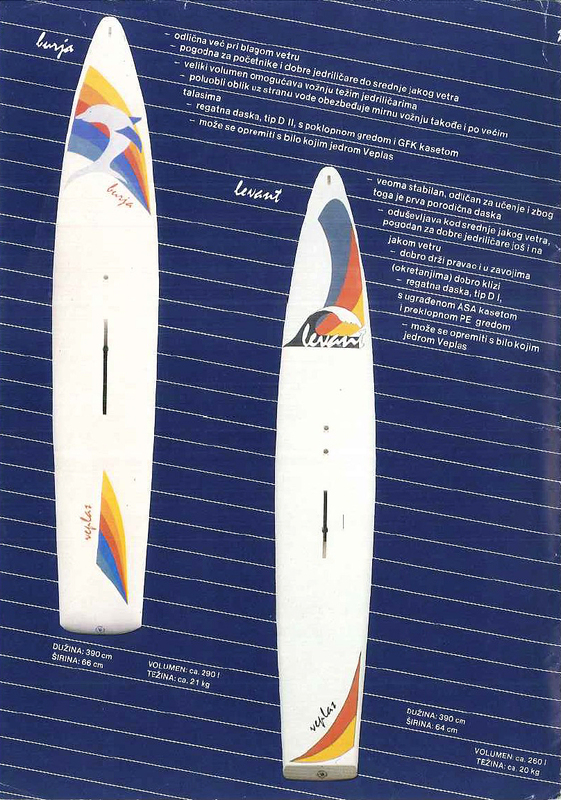 Because if there is no dagger-board, then I would try to sail it with a Freeride fin more than double the normal size. 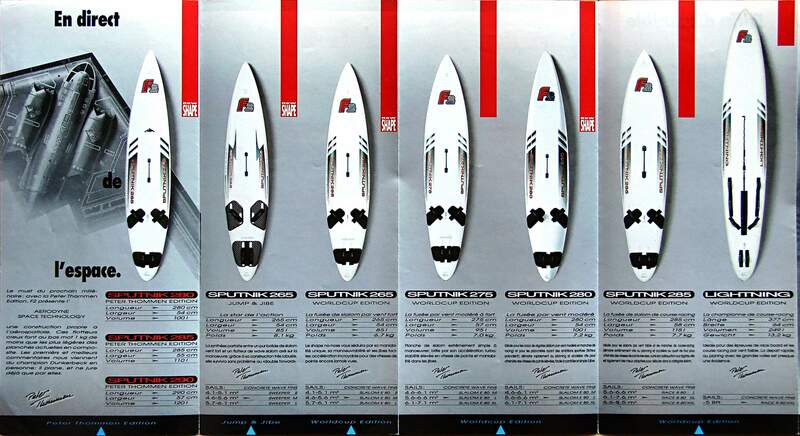 There are some finbox addaptors that allow the use of different types of fins, but I don’t even know the type of the finbox of the S5. 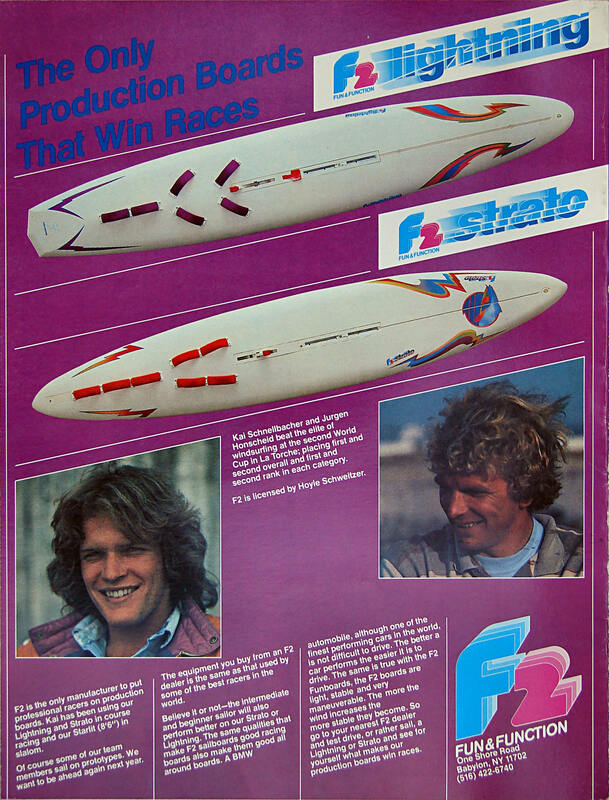 In addition, I doubt the finbox is strong enough to tolerate fast sailing on a single large fin. 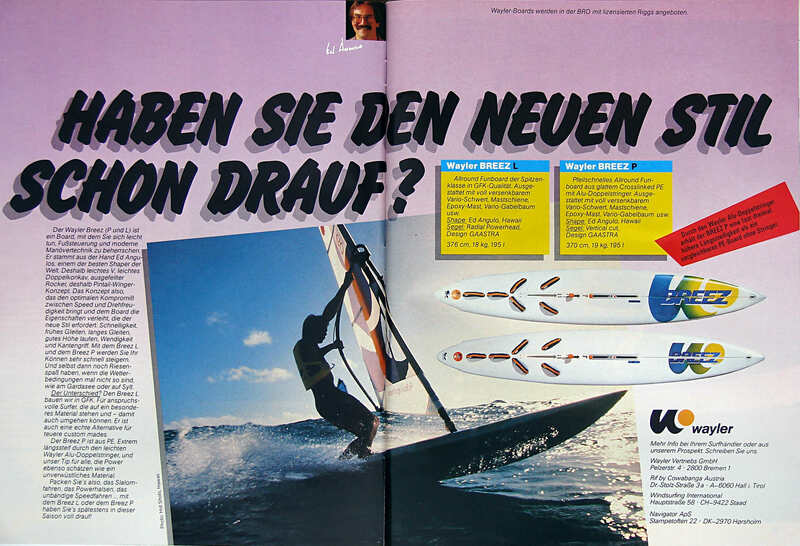 The German magazine SURF, on February 1982 tested 2 Kleppers S3 & S6, so maybe during that year they also tested your S5, but I have no access to this archive at the moment, while even if I found the test, no fin details were usually given. I wish you luck and your sailing comments are welcome. Dear Zoosan! Thank you for your answer and for the unknow informations! it is so close to the datas you estimated that I will buy this fin first. I hope that the good weather will come soon and I can try the board! 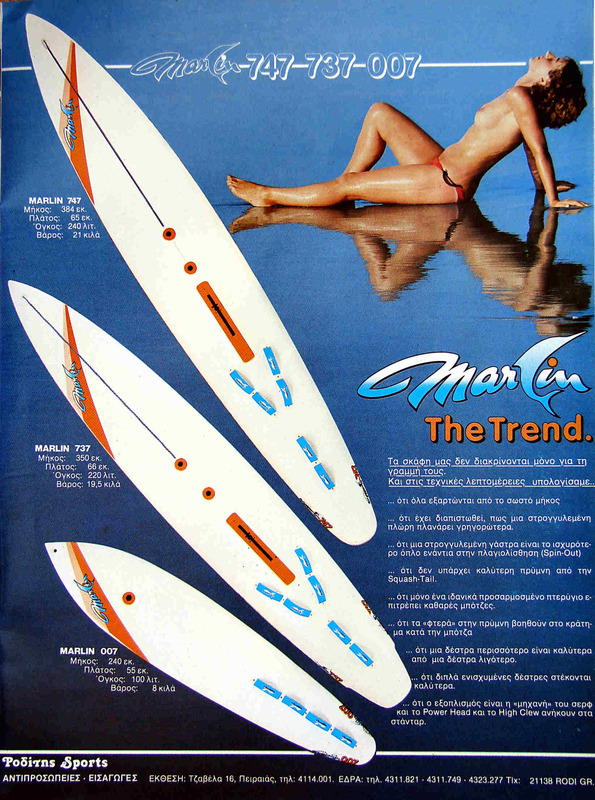 Just after some info on a BIC 200SL Tri-Fin with dagger board and original fins. 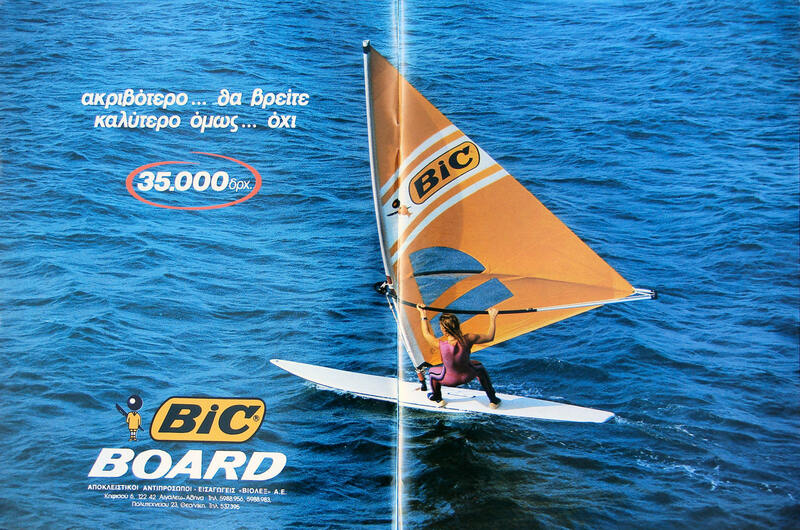 I cant seem to find anything about this board anywhere on the internet, not even on the BIC site. I even got the original large pin style mast connector with the board which is in good condition. The clips to hold the mast foot in are not the best so I am going to modify with stainless fittings instead. A friend seems to think it could be a prototype? Sorry Damien, but you’re not going through my post carefully. No prototype, just a 1984 production model. This was no prototype. You just have to replace it with pins that go down both sides of the mast step. They were designed to pop out under enough stress so that the board wouldn’t come apart. i am surprised this has lasted as long as it did. 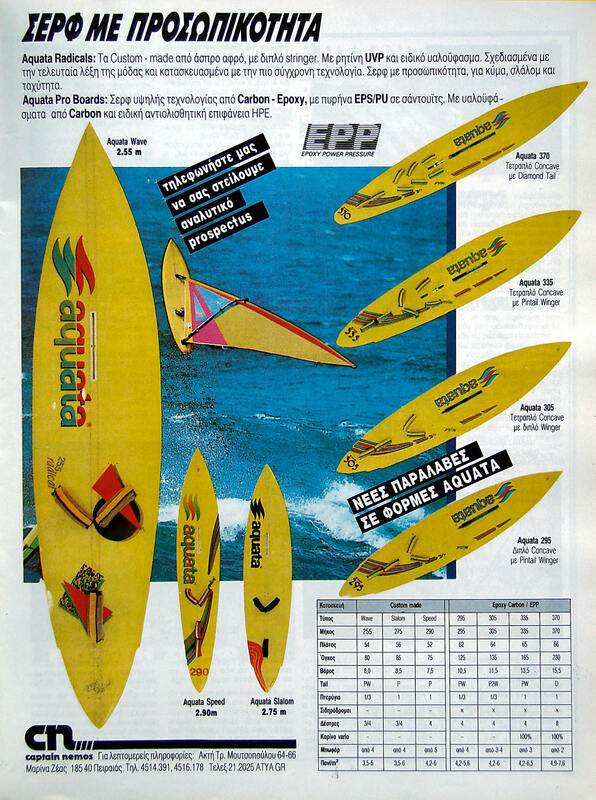 The golden ages, when the windsurf was more than sport, one board for all conditions, and we sail everything. 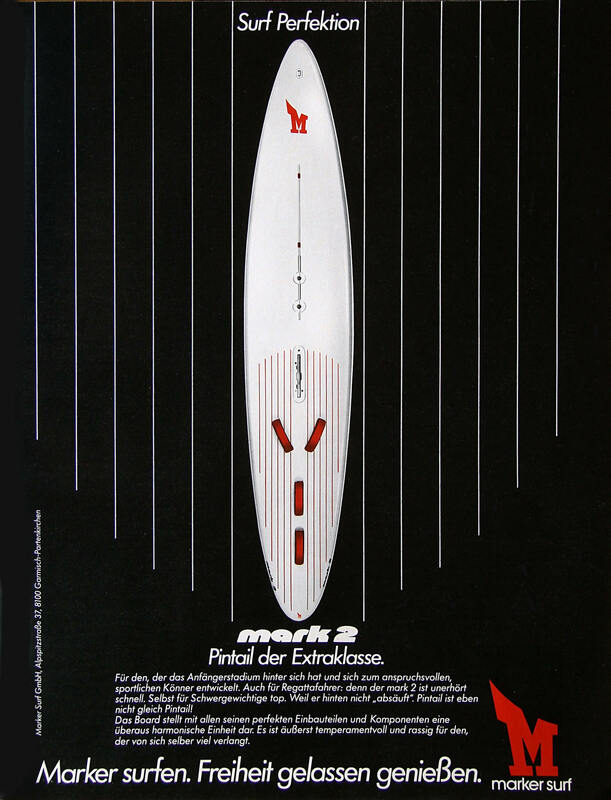 I have yet my TC Shot but I never had the girl of the adv, I didn´t find my other myth, the HiFly extreme 272. 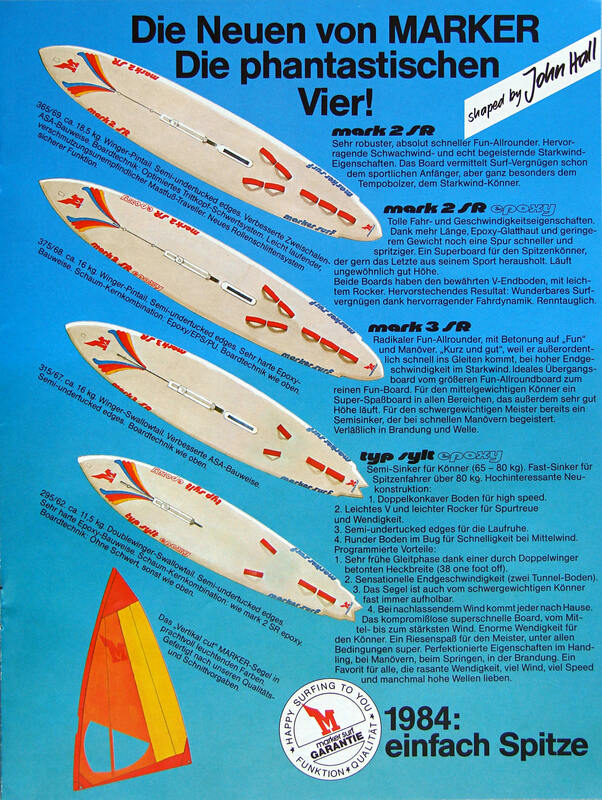 Now 42 years old, 3 boards, 6 sails, one wife and 2 boys, …too much for a 90 litres board. From Spain, thanks zaosan!!! Nice memories Paco. Show your boys how to do it! 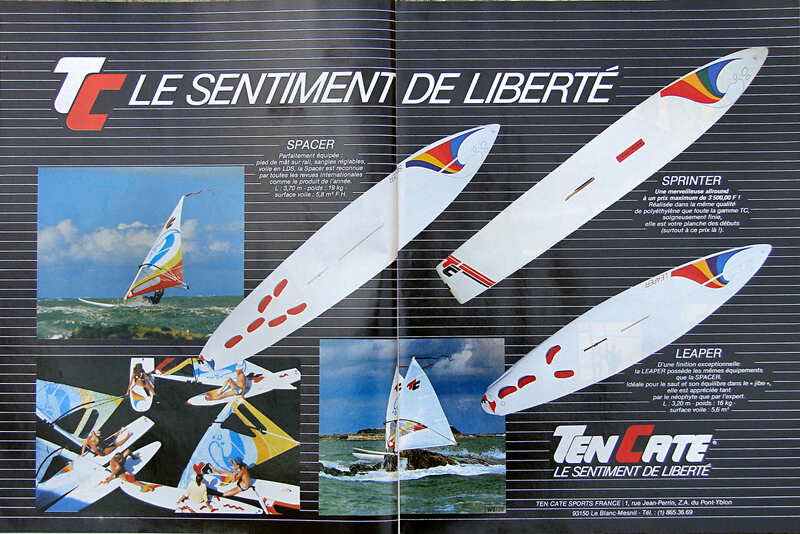 Already for years I am looking voor the mistral brochure from 1986… In these days was completely ‘in love’ with that range of Mistral and I kept it under my pillow. Now I would like to dream on. Can anybody help me? Thank you for the archive work and time spent. 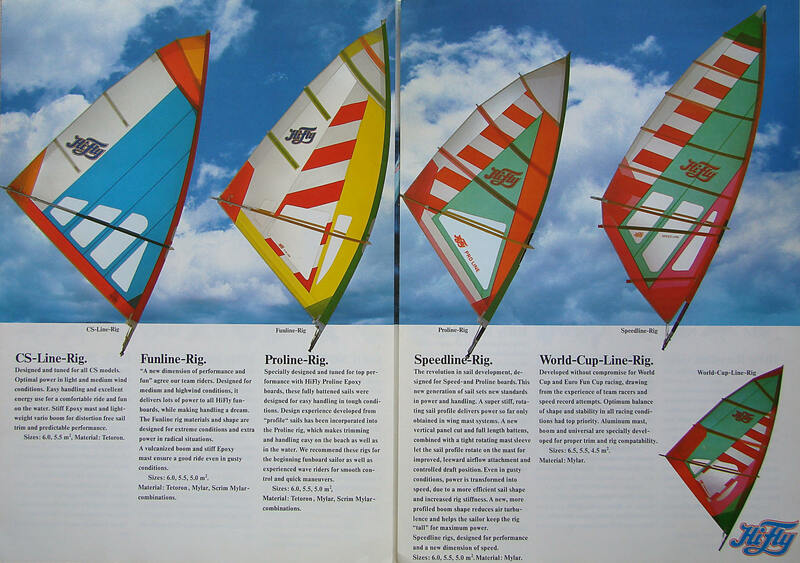 My current gear is from the 90’s : Hot Bee Fanatic with a cam World Cup racing Neilpryde, infinity North sail. It works very well even if the laminated material of the sails is starting to tear apart. Nice looking at all those brochures which built up my dreams. As you are, I am sad the brand didn’t keep track of there advertising material, it was digital also in the late 90’s I am sure. Thank you and congratulation for this post! 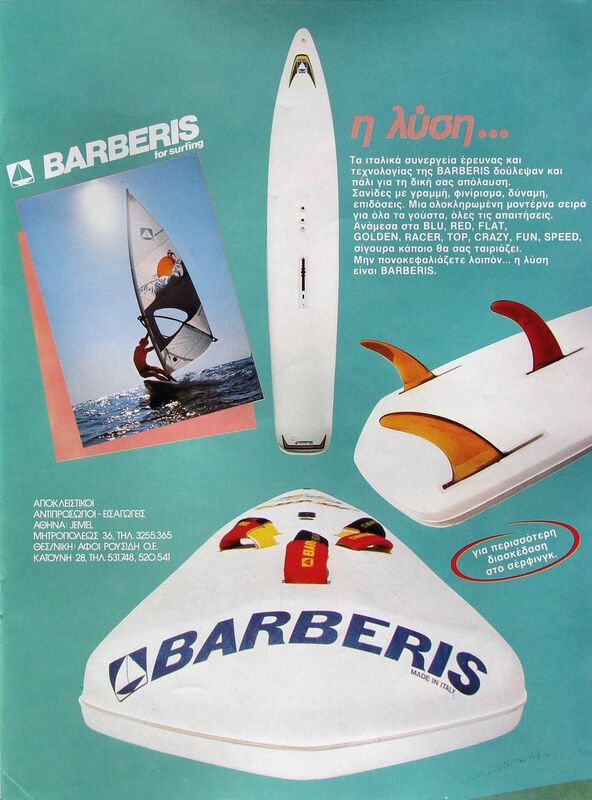 If I hadn’t been so closely related to the Greek F2 importers back then, I’m sure I would have sailed a Fanatic sometime – but I NEVER DID. 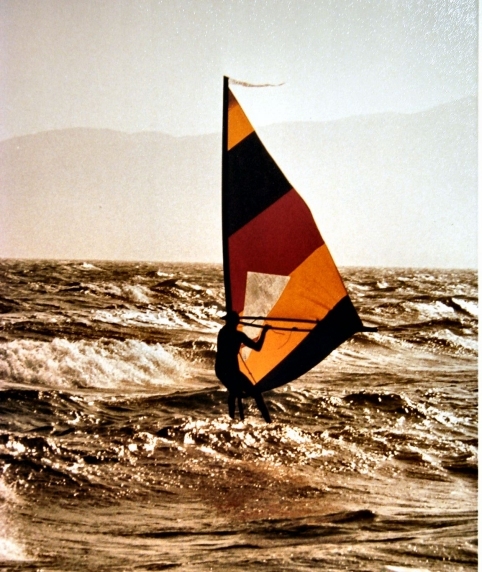 that I RIDE MYSELF: photo:Sordelli 1980 (3), from my post Windsurfing early ’80′s. They did not even ask for the permission to use my photo, which is the basic rule of good manners. So we come to the conclusion, that if a company cannot follow the basics, how on earth would you expect them to have a proper archive! 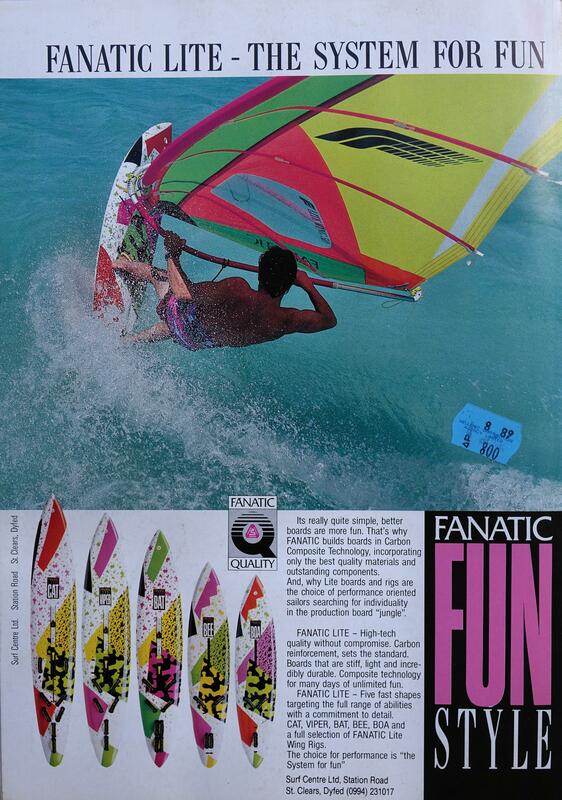 I guess the fanatic modern brochure featuring ultra and hot boards is from 1990 if I refer to the 30 years fanatic book. Good winds …. Maybe the last session this year today for me…. 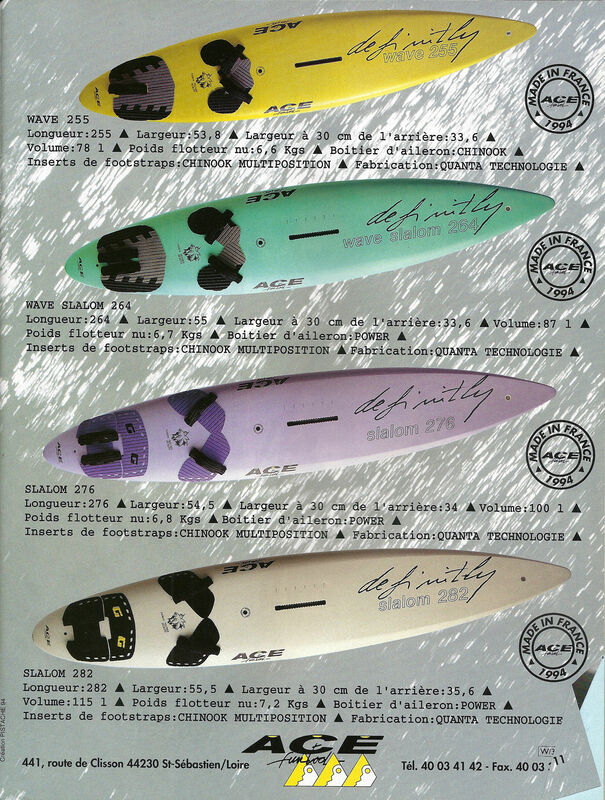 Still with the Bee but with more modern sails….from 2010’s… The combo works perfect even with 7.8sqm! You have to try a fanatic…. I just had a bic allegro before…. Cheers and thank you for this blog. 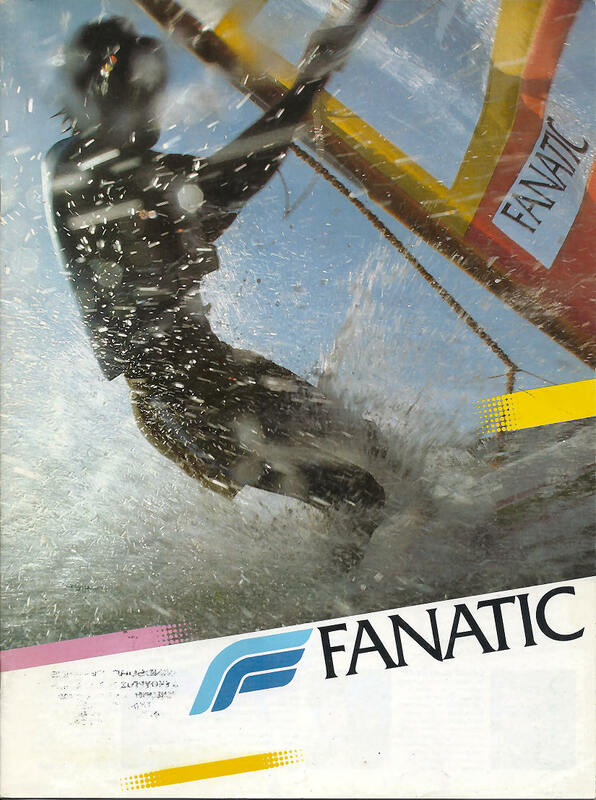 As already explained in a private message to u, the picture you refer to is a scan from an old fanatic brochure, so unfortunately if that was incorrectly used, it was wrong 32 years ago in the brochure, made by the previous owners of Fanatic. 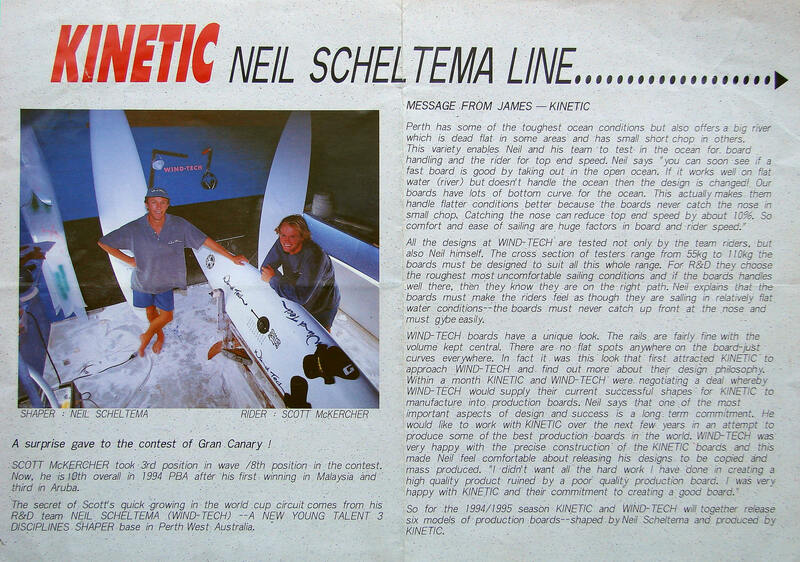 When Fanatic changed hands to the curren owners we did not get records of all marketing materials unfortunately, even when we requested them for the 30year story. So apologies that the scan is incorrect, we could not know this and of course would not use pictures without permission, that is something we definately are aware of. 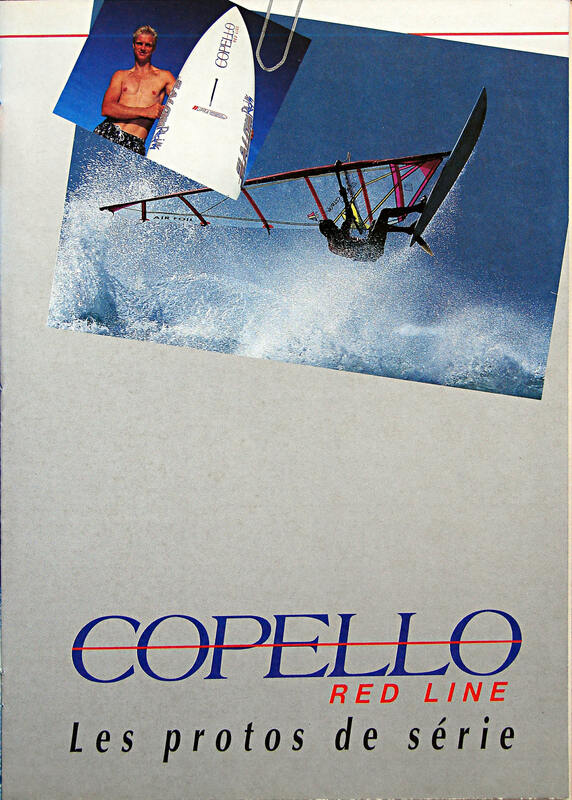 Great collection of brochures you have there, enjoyed looking thru them, reminded me of my teenage years waiting for the latest mags/brochures to drop in, the colourful 80’s…. I personally scanned the analog photo and published it in my blog in October 2009 for the first time, so someone is misleading you. 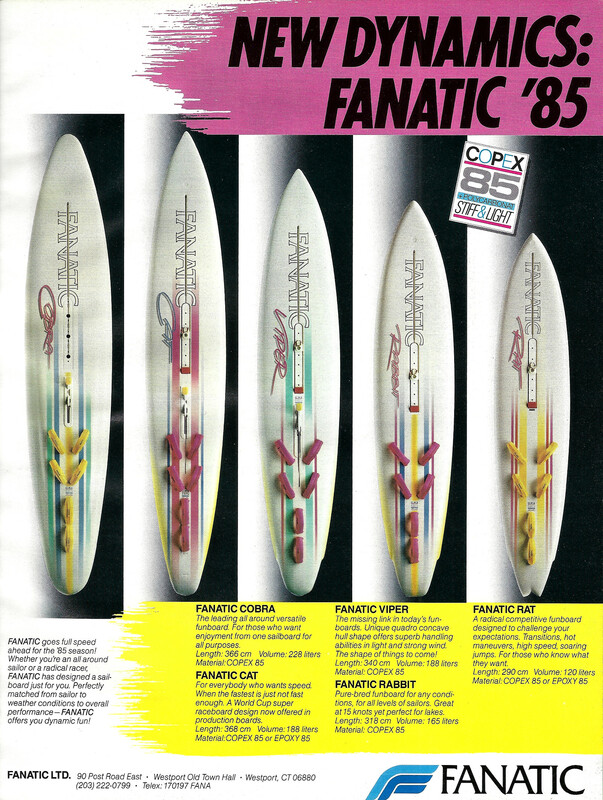 Nevertheless, your sincere apologies are accepted – after all, I believe any veteran windsurfer has an affection for the historic brand of Fanatic, which still today produces some of the most appreciated boards. That’s all he could come up with…Maybe you could help us out? Unfortunately my archive is based on printed material, so I cannot trace the commercial you are after. Great website, took me back to the 1980’s. 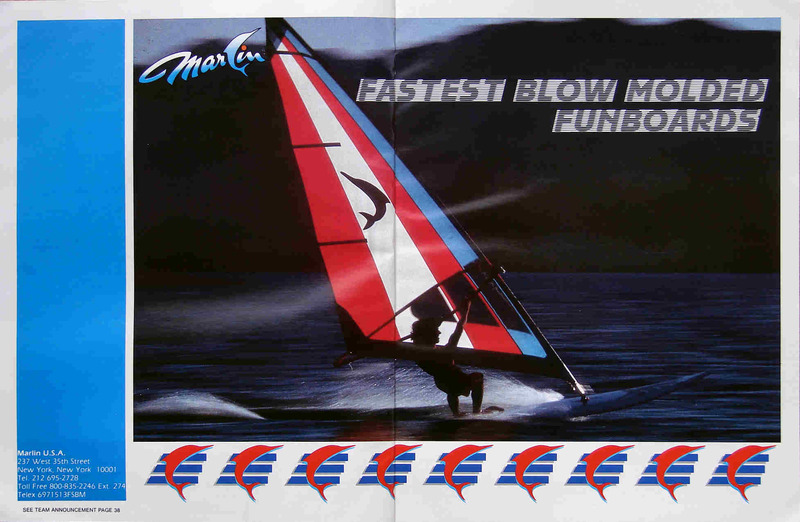 I had a Sailboard Race and also used a Magnum Fun back in the day. Thanks for putting it all online. Thanks a lot for putting this site together! 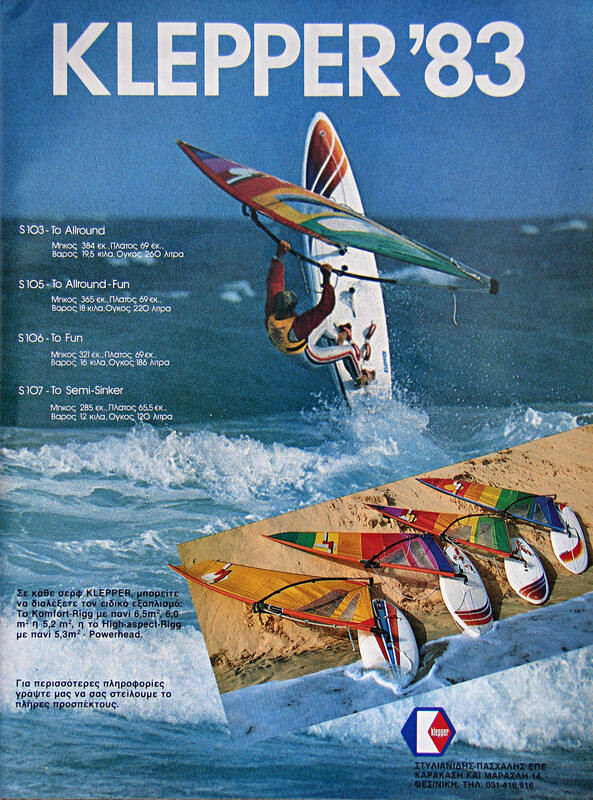 I started windsurfing in 1979 so this site is a blast from the past! Thanks Roel and welcome to my blog. 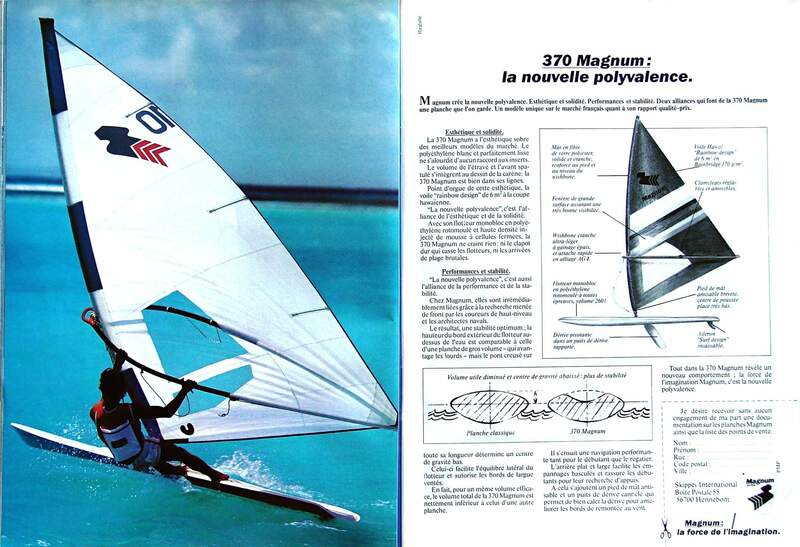 Having started windsurfing the same year, we have come a long and fascinating way. Wow there some blasts from the past. 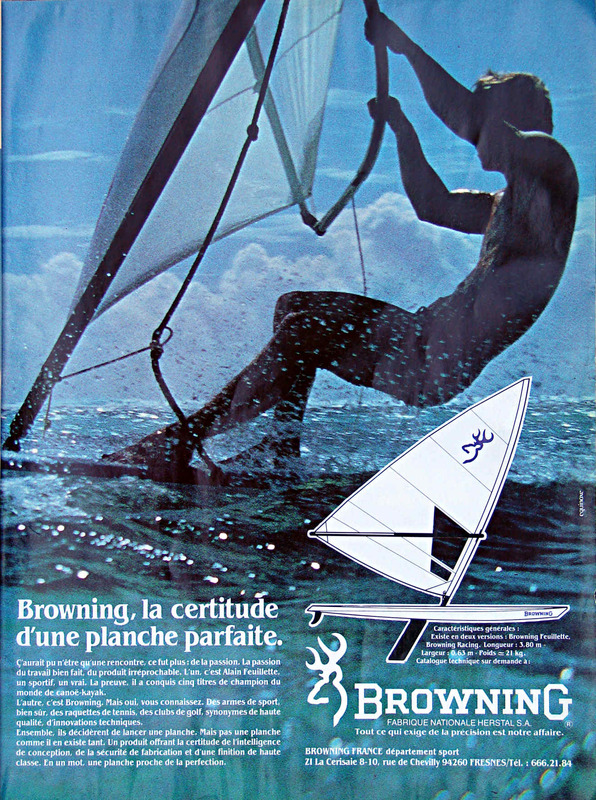 I started when I was about 11-12 (78/79) drifted away from it in about 85/86 started work etc wish I hadn’t had Dufour Wing to start, then Laser Sufsprint, then Sailboard Race. used to compete against Dave Perks, Dave Hackford, Ade Bugler & win sometimes. Good friends would let me go on there short boards, (being light I could water start in a brezze lol) Circle One swallow tail,, F2 Strato, Bic Show ? think it was…Mistral Maui. 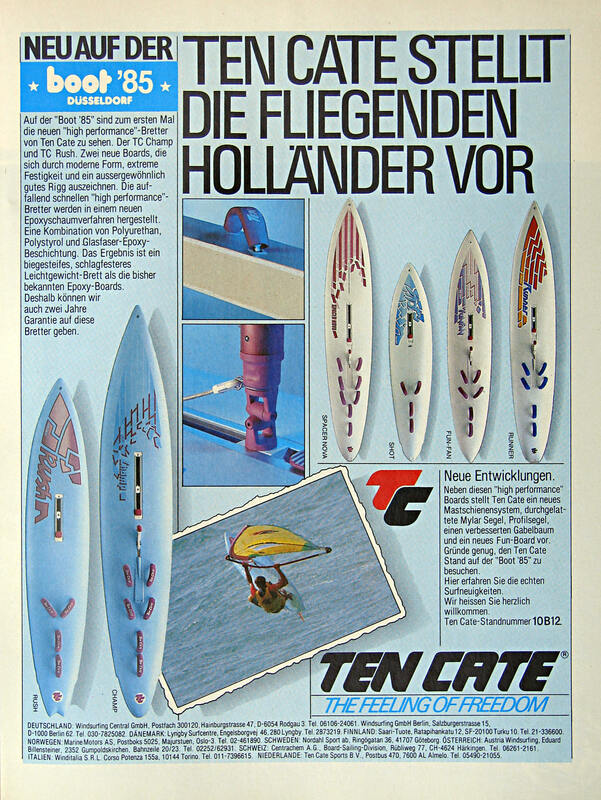 Some of the other 1’s around TC39, Ken Winner, “Something” Turbo?, Mistral Light & super light, + of course Windsurfer used for major contest in 79/80 I think it was + another one sponsored by Peter Stuyvesant cigarettes cant remember what board was used though…… Waveglider was the make. 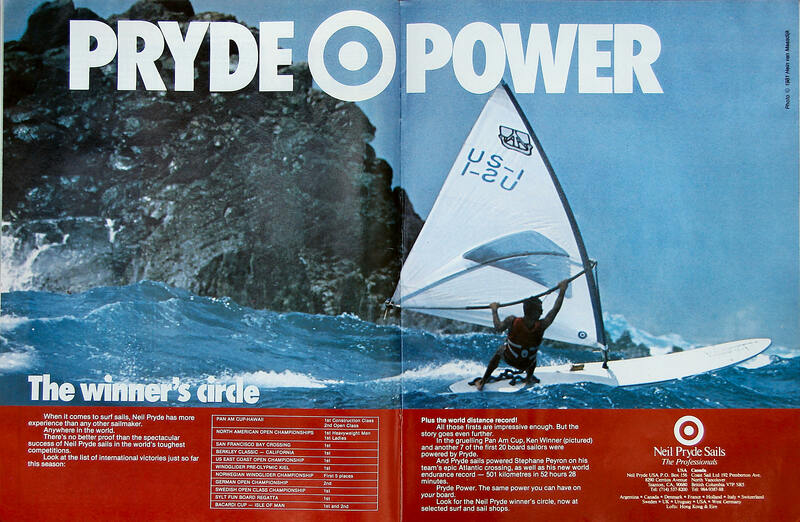 All windsurfing was done of Weymouth. As you started one year earlier than me at an age half of mine, I’m sure you are still sailing & kicking! Circle One is unknown to me – have any more info? 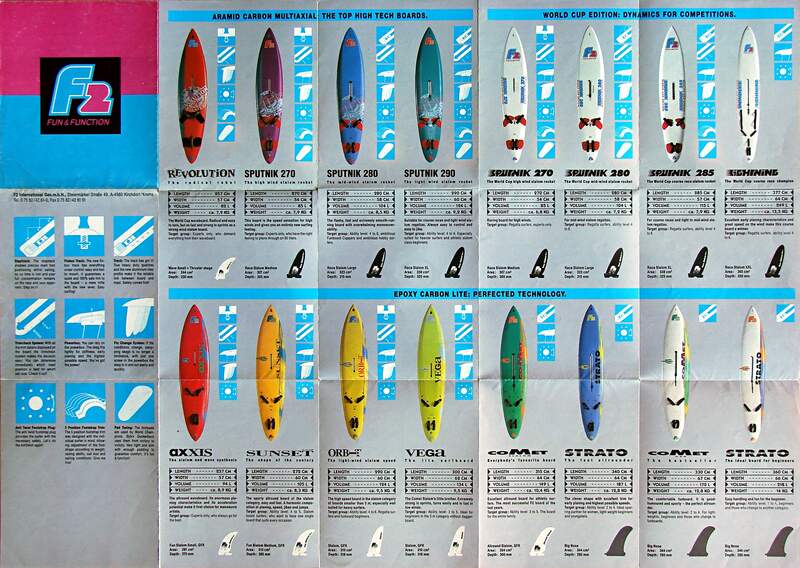 I know 90% of these boards, and owned around 25 of them. I started in 1979 on a Ten Cate when I was 10 years old. 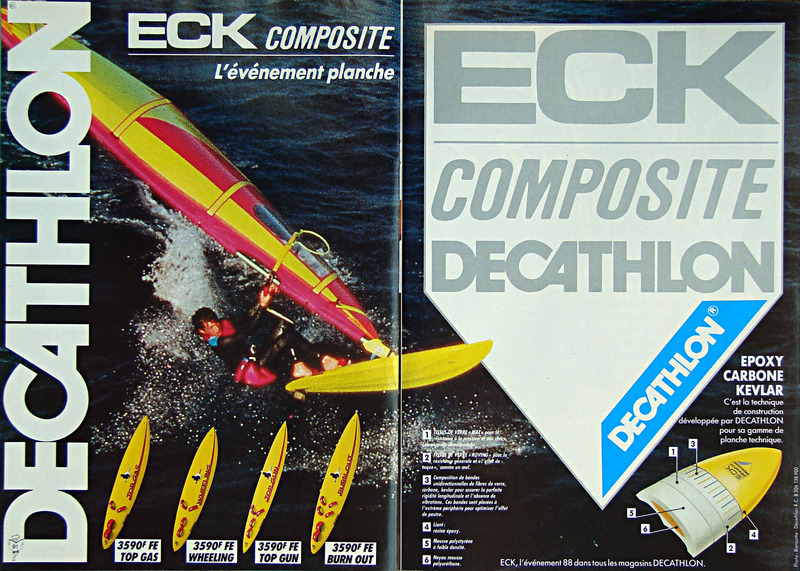 And most of the equipment was junk until the mid 80s in North America anyway. 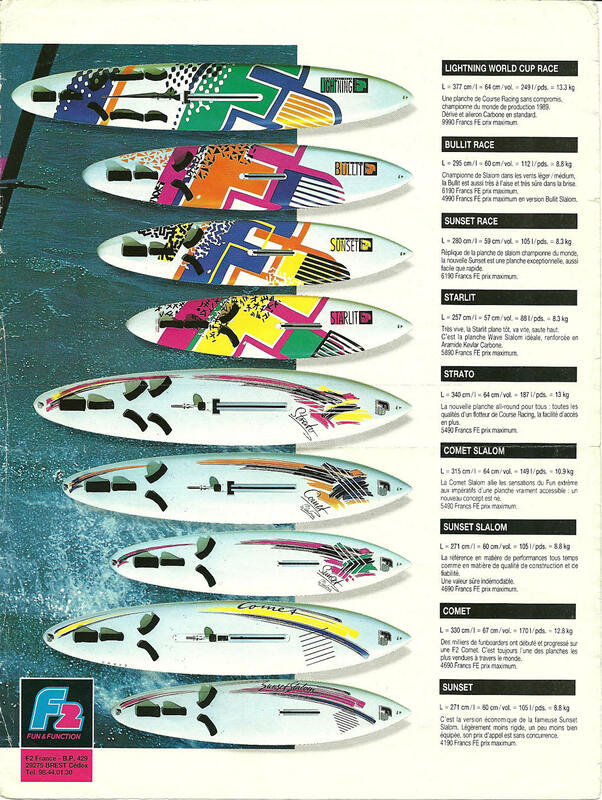 Mistral Malibu was the board to own in 85 everyone else was runner up unless you rode glass boards. 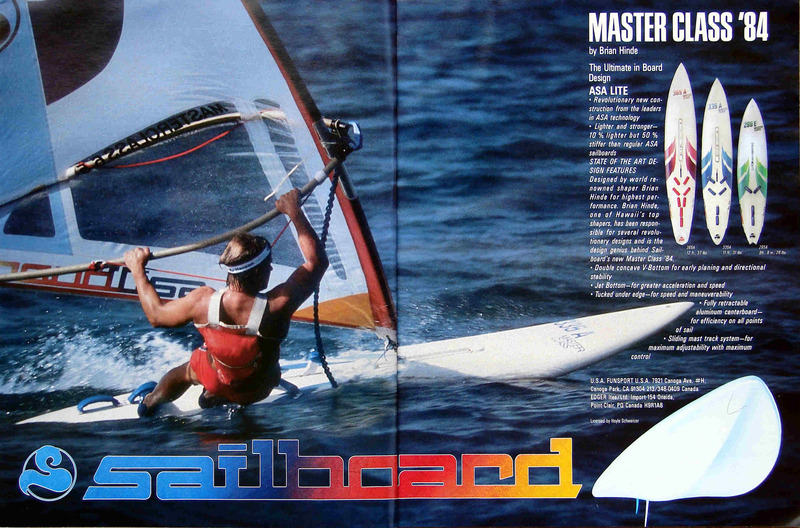 Ya right, Mistral Malibu was one dog of a board ….but you must have been a good sailor to win on that. 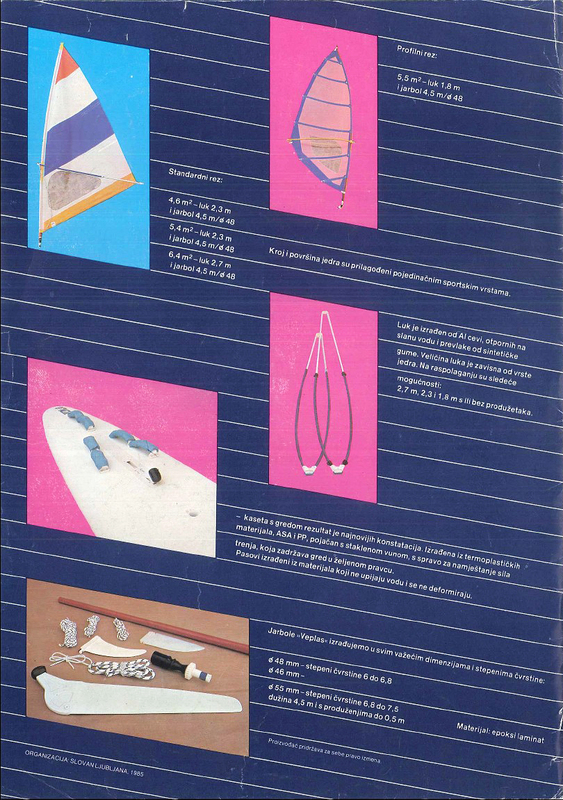 Wow….so much memories from the eighties as I browsed through these brochures. 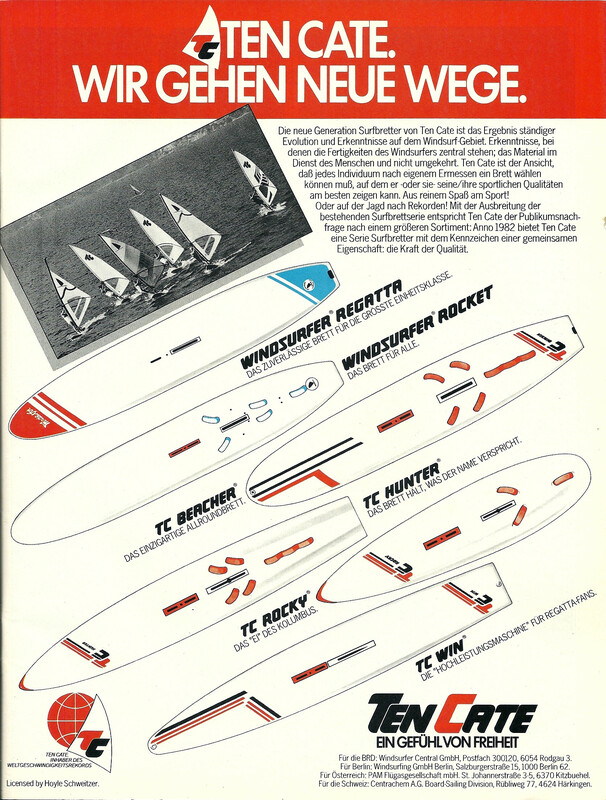 I learnt how to windsurf in 1983 on a “Windsurfer” when I was 14 years old and later bought a Winsurfer Rocket 99. 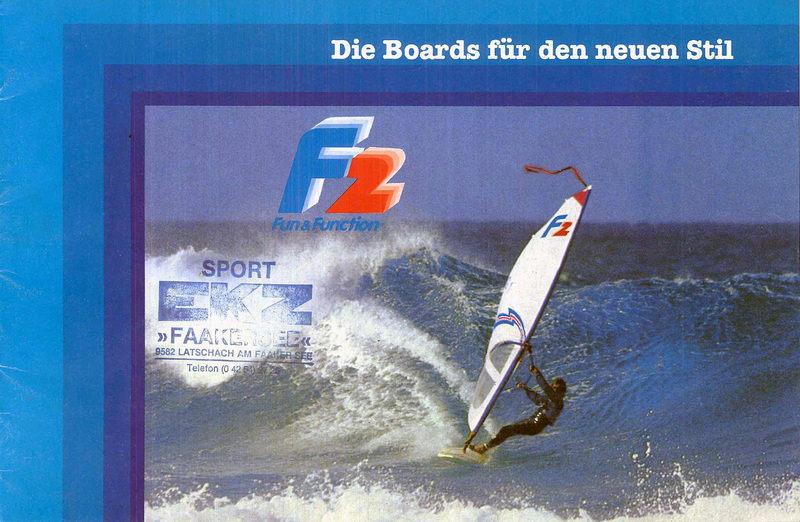 Eventually my old faithfull broke and these days you cannot find second hand fun boards here in Cape Town…….what a pitty since my son is now 16 and desperately wants to learn to windsurf…….any comments from around here? 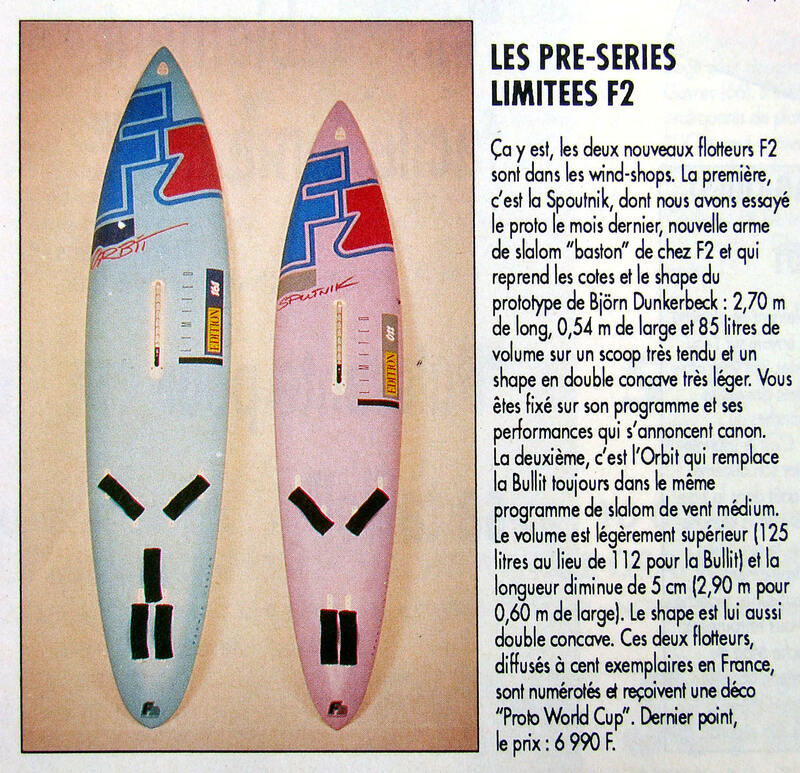 Everything about this board is presented in 2 pages of the posted F2 news MAG 1998 – Click& wait pps presentation to load. You will surely enjoy the board, as it is a board you can use most of the time. Beautiful blog and I’m sure the people that are motor enthusiasts are as pleased with it as I am with the sailing part. 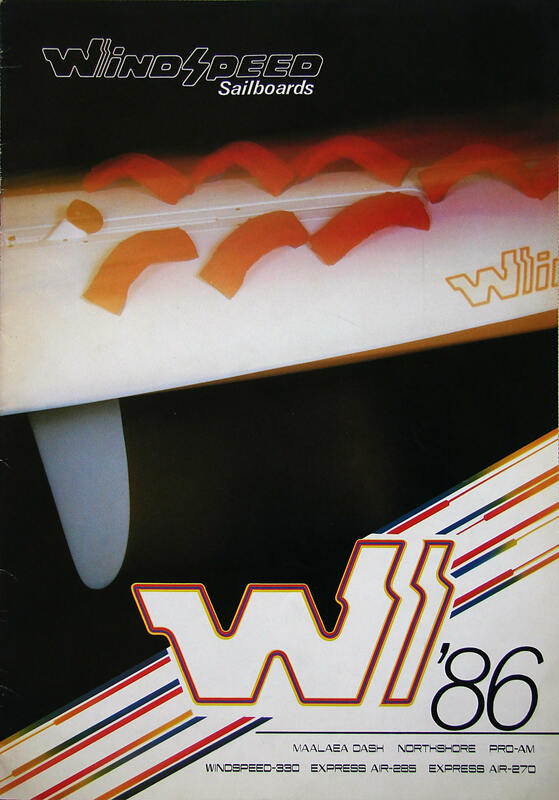 I’m sure you will enjoy the upcoming Part 2 about the wooden Grego vintage racing board & its creator Leo Zerboulis. Just stay around and keep sailing. 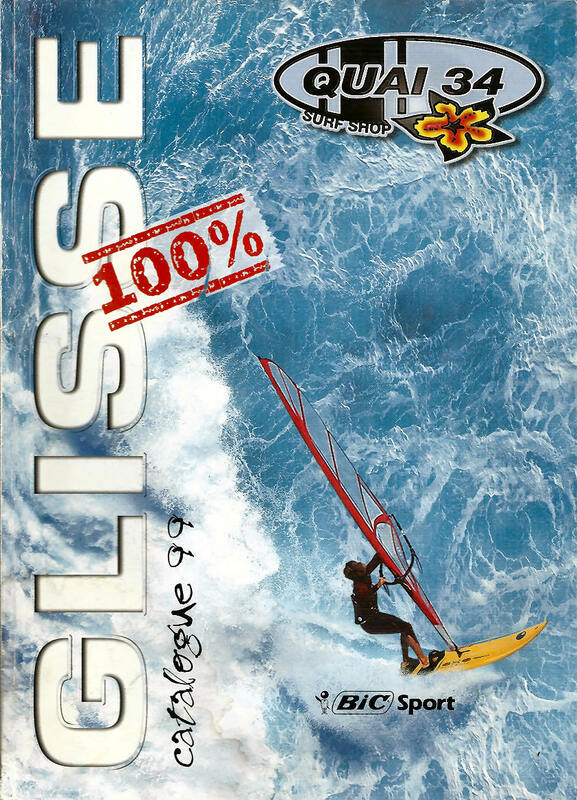 Thanks & yes, we are getting older year after year, but at least we were privileged to be around when windsurfing started and we still ride with the wind! Unless you are determined, weight I would say not more than 75kgs and have good sense of balance, you will not have an easy introduction to the sport. 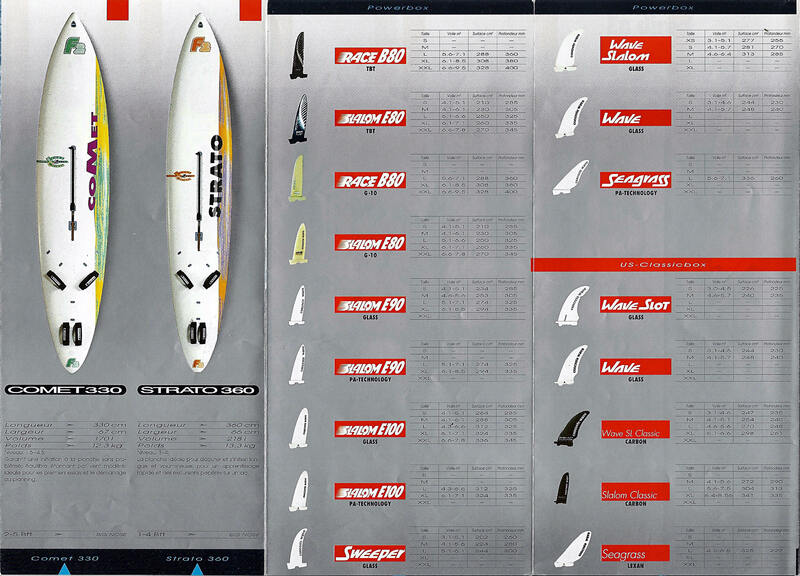 Nice board, even nicer version the Epoxy Pro, this is a step up board for someone to get to funboard sailing. Long & narrow by today’s standards, I would only suggest it as a first board to riders of less than 60kgs. Masts can be easily found, fiberglass or even aluminium – careful with the fiberglass, not to have exposed fibers due to weathering. If so, a new layer of resin must be applied to avoid unpleasant skin irritations. Such a mast should be had for free. A mast ready to be used should sell no more than 50 USD. This is applicable if you got the period sail as well. 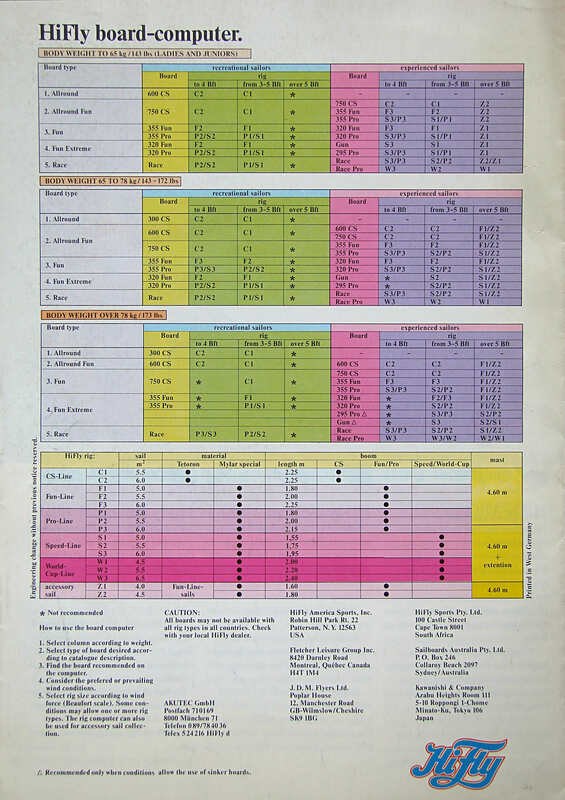 If you are going to use a more modern sail, the sail’s specifications will lead you to the right mast. 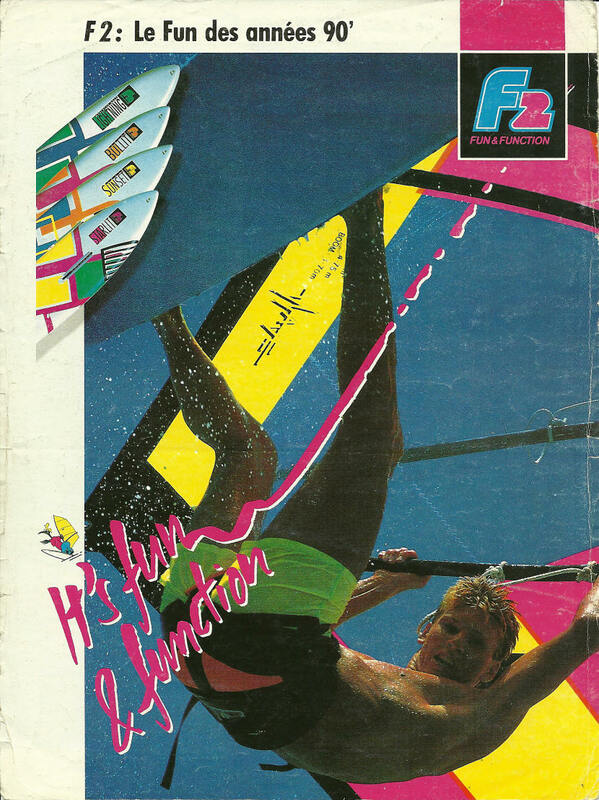 Hi Zaosan, I have some windsurf brochures from the mid to late 1980s (Mistral, F2 and Klepper amongst others) and I would like to share the scans with you for posting to your blog How can I do that? Your material is greatly welcome and if there were more contributions, we would provide the missing links of the no longer existing brands and the plain profit oriented companies with long history but ridiculous – if any – archives. Send me whatever you like in best possible resolution at ddsavidis@yahoo.com, and tell me how you wish me to compliment the posted scans to show they were offered by you. Perfect Dimitris and thanks for responding. I’ll start scanning and emailing these to you this coming weekend. It depends on the graphics. Haven’t you identified it from the posted photos? Thank you for the reply and your time. I haven’t been able to identify it from the photos but attach picture of it to see if you can help. 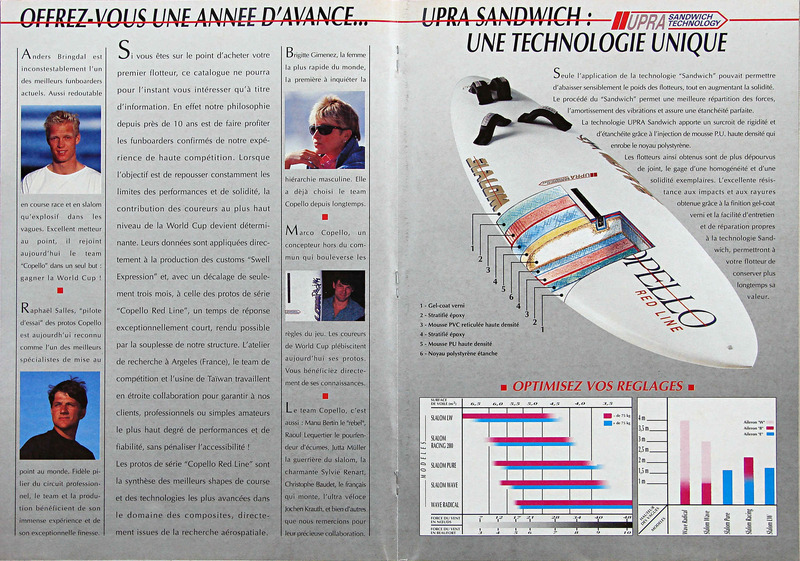 Only a few days ago I spotted your board on the back cover of Boards magazine of August 1989. So you have a nice Fanatic Bee 1989 and I have posted the mentioned photo in the relative section. I really hope you will enjoy your board this coming summer. Nostalgic little trip through boards I have known and some I’ve never heard of. 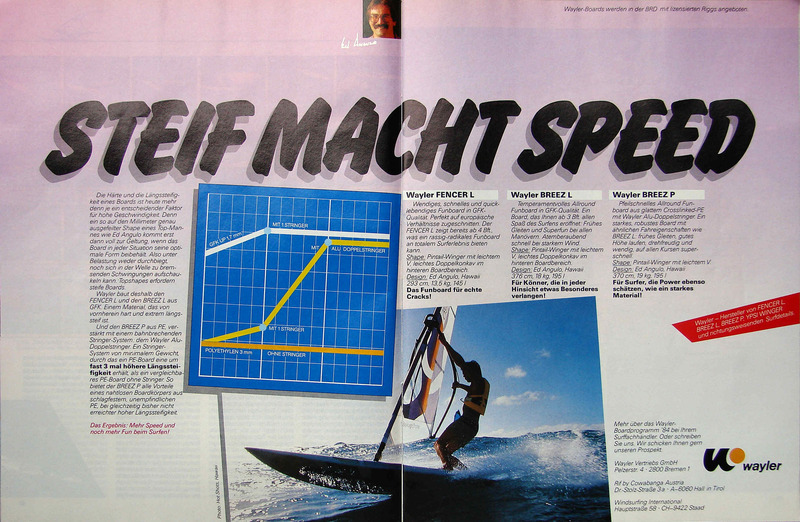 Started in 1983 sailed fun, raced, sponsored, and now into GPS speed challenge and still going strong. What a fantastic sport for fitness and pure fun. I like your course through the various disciplines of the sport Paul. Thank you for doing this heroic cultural effort to document all these lovely broschures. Sent me way back. Thanks! Thanks Tomas, such feedback justify my decision. Nice to still have the Mares. 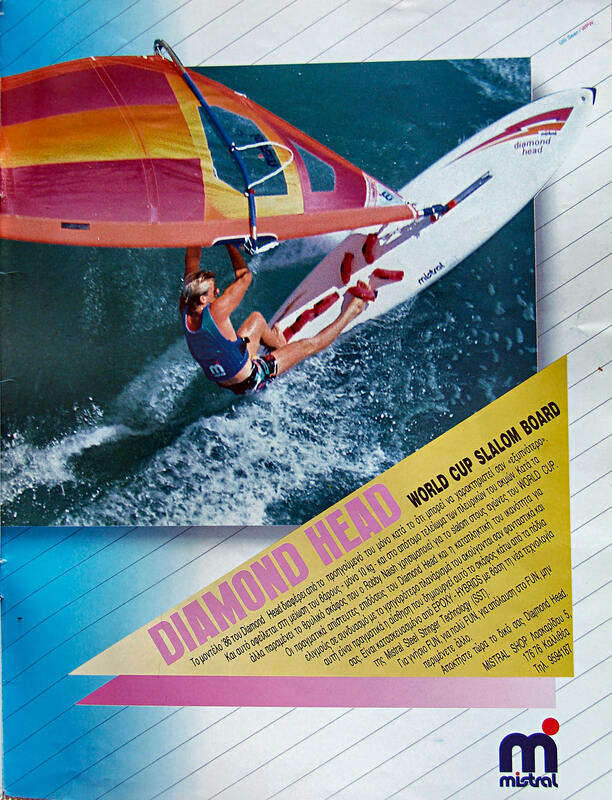 A five-time U.S. National Windsurfing Champion, that competed during the ’80’s till early ’90’s. 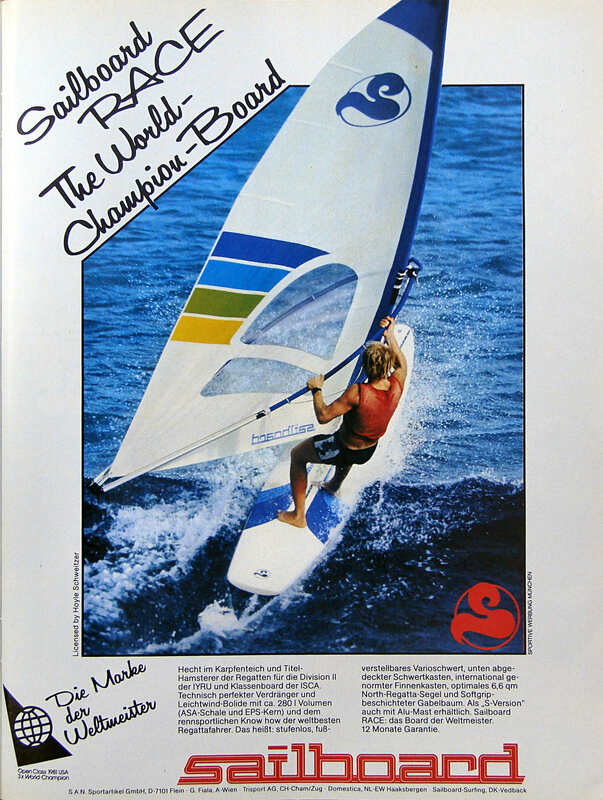 Married to Stina Hellgren Sayre, former Swedish boardsailing champion, he met at the 1983 World Championship. 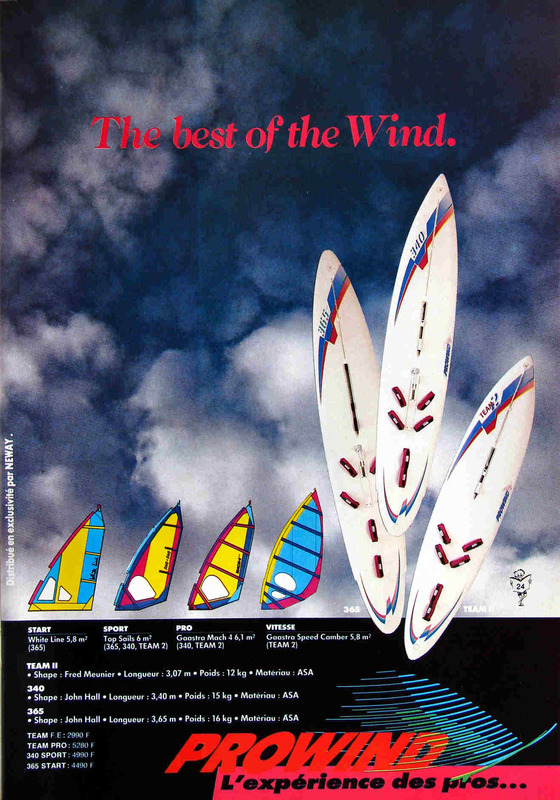 He encontrado esta magnífica recopilación de catálogos antiguos de windsurf! HEY!! brings back oh so many great memories of winfsurfing gone by at 0130 in the morning!! trying to stay awake,.keep the faith…. 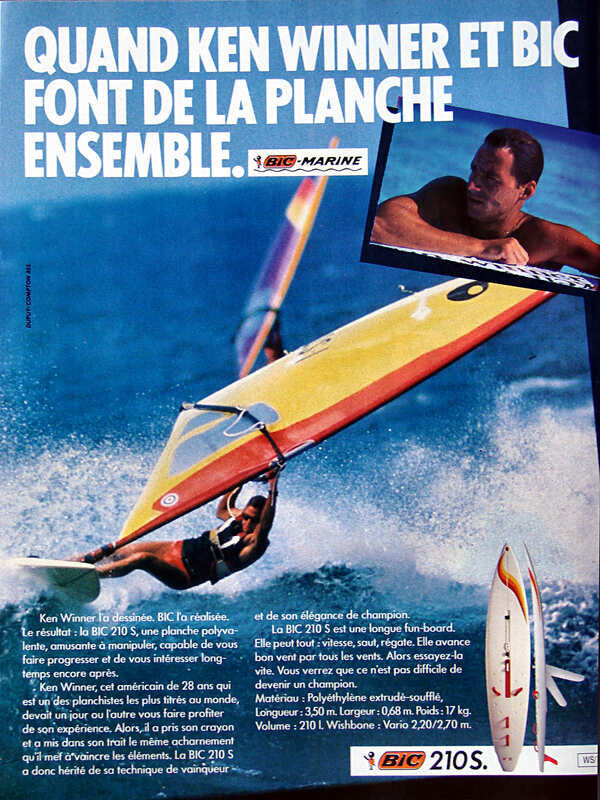 Feels good realising how privileged we are, having been involved with the early times of windsurfing. So cool. Thank you! What a time travelling blog. Anything more from COBRA would be great! Welcome Alex. 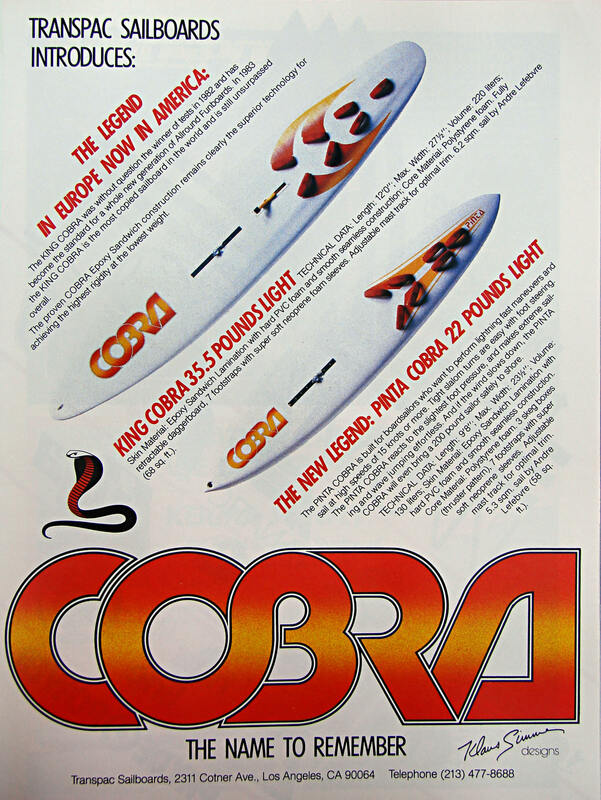 Cobra looks unbelievably durable to time, still manufacturing most of the existing production boards as we all know. Wow FANTASTIC! 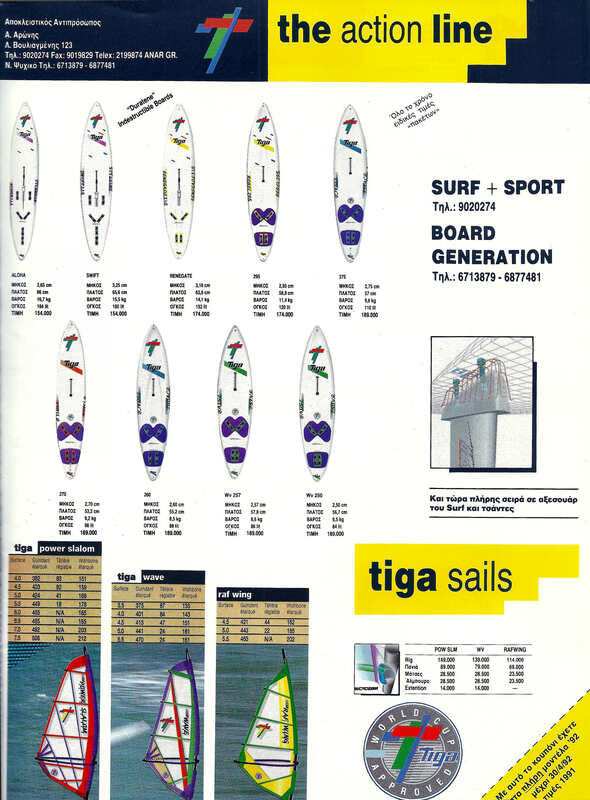 Only missing my Tiga Jibe (think it was a board from 1986)…. these images bring back lots of memories… 🙂 🙂 and big smiles! I’m sending you the Jibes of 1985 & 1986. I hope your board is one of them and then I will post the relative range. 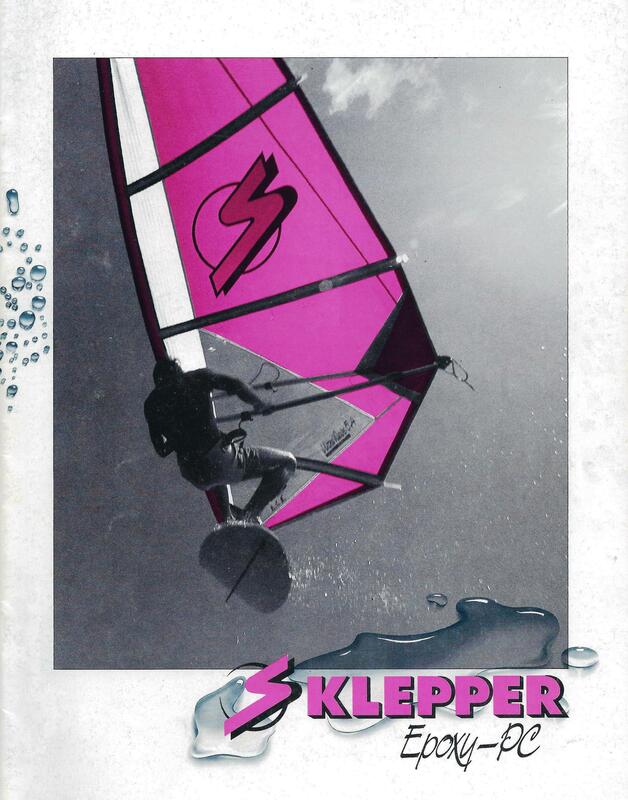 Keep smiling – that’s the essence of windsurfing! Thanks for the images of the Tiga! 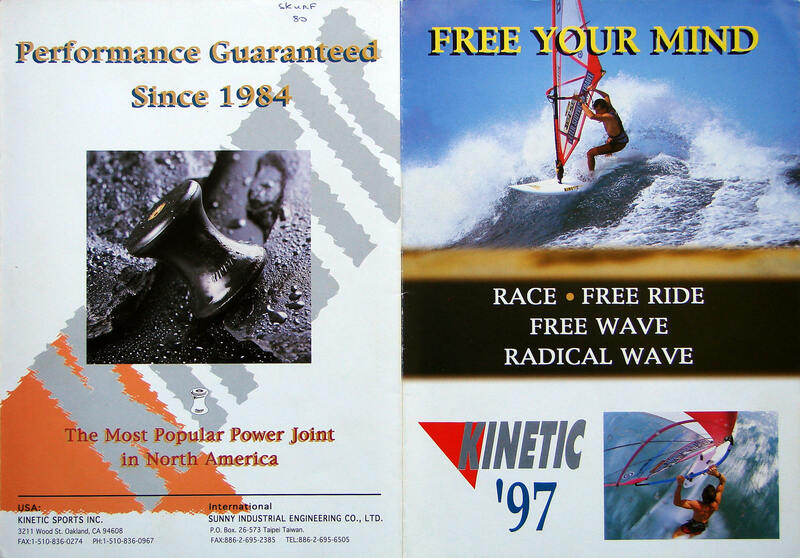 regrettably I got rid of my early pryde catalogues from the warp speed days through to 2000 (newer archived @ np) and my old seatrend brochures – classic material I hope to find some day…? Thx ! I’m sure there is plenty of interesting material getting dusty. We should try to motivate people to make it available. 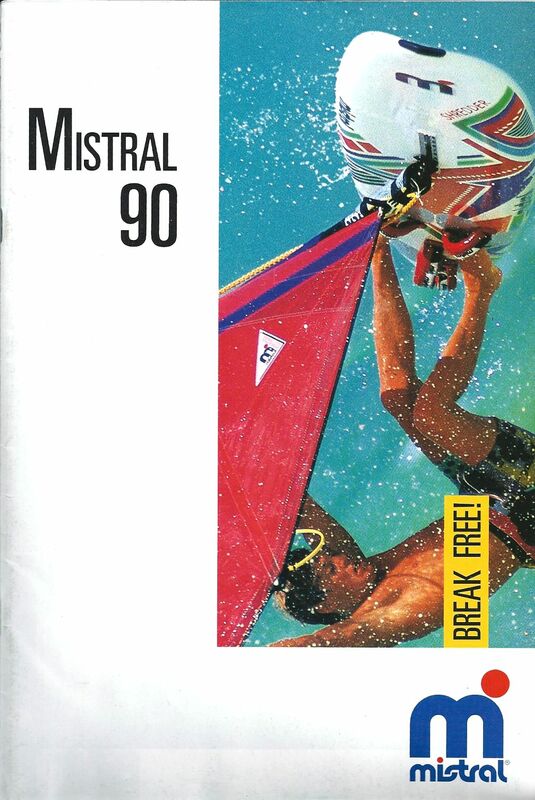 How do I send you a Mistral 1996 boards and rigs brochure by computer. You can send me either scans or photos (if your scanner cannot accommodate the size of the brochure) at relatively high resolution and I will post them mentioning your contribution. ps: Yahoo accepts attachments up to 25 MB, so if the material is larger you should split it. 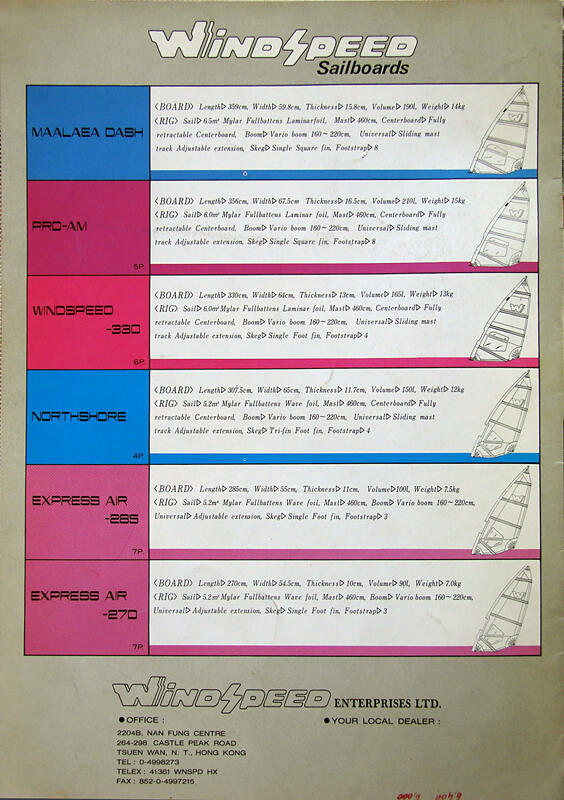 I’ve scanned my 1985 Cobra brochure that I still have lying around. The pictures have been sent to your email. 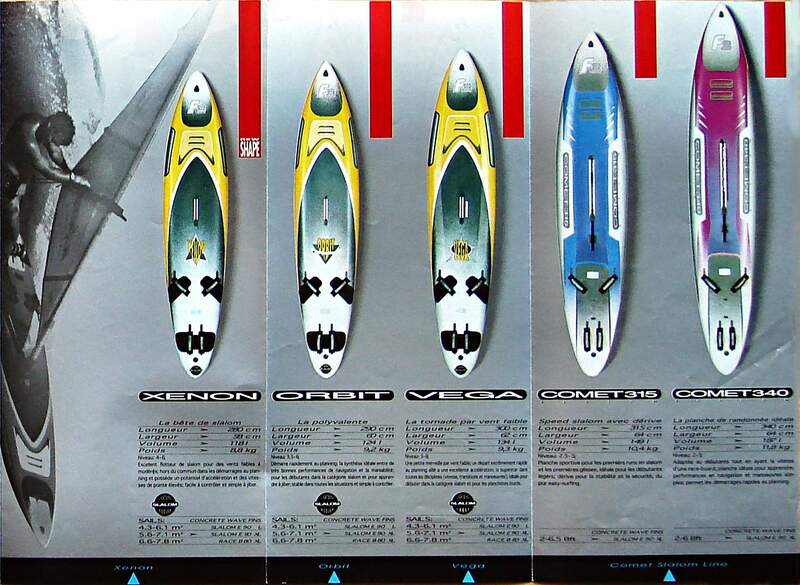 Thanks a lot for the great Cobra brochure scans contribution! I have already added them to the vintage archive post. For me it is a great pleasure to get contributions from people who keep good memories of their historic material and even greater when they still sail them as they were made to. 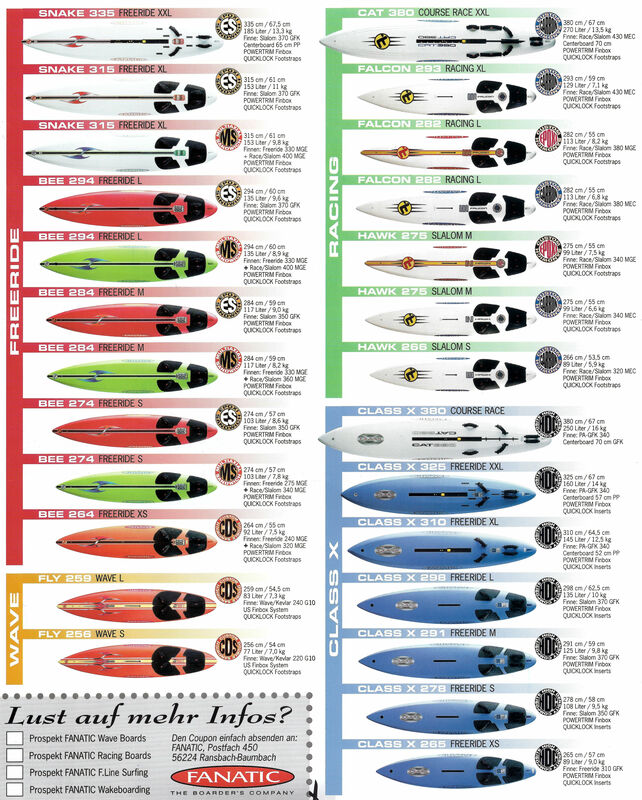 All early F2 boards are here, plus plenty of the Mistral. Did you check carefully the posted material…? 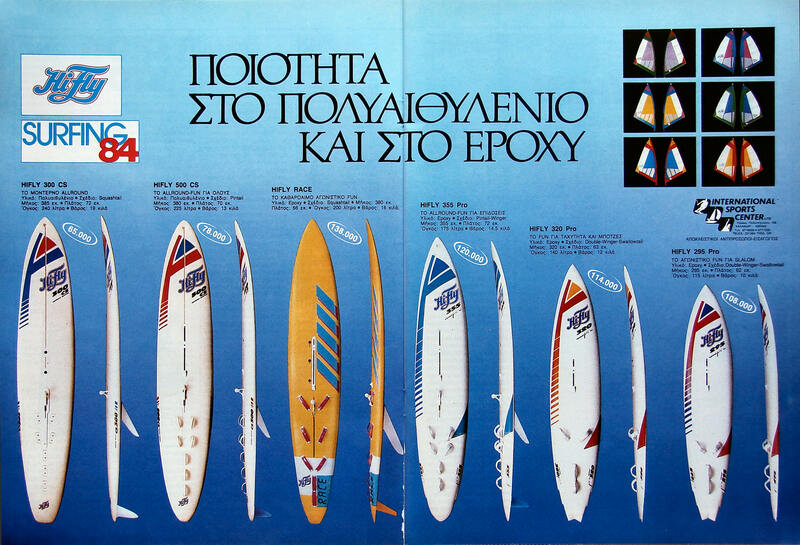 I just uploaded for you some ’81, ’82 & ’83 boards, but unfortunately most of them in Greek and so-so images. If I find something better later on, I will substitute them. 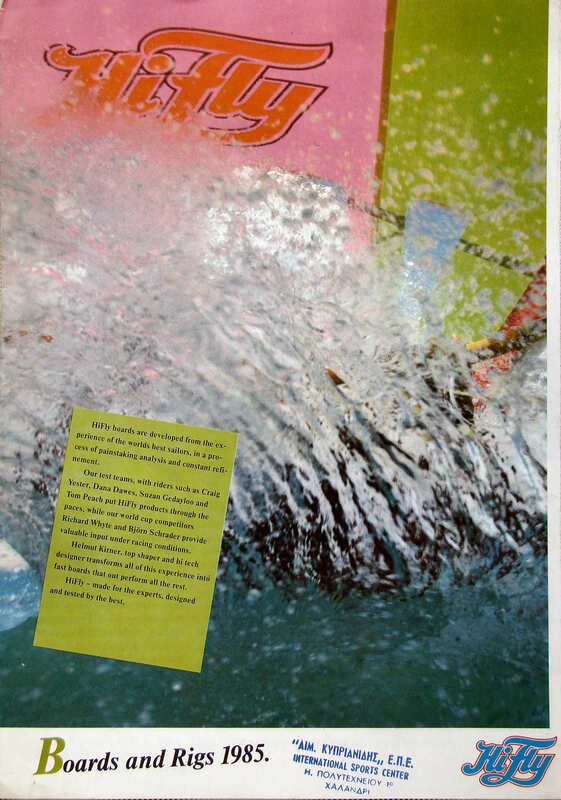 Nice to hear you have interesting material to contribute to the historical files of hitthewave. Please take some good rides wherever you are, and don’t forget to contact me upon return to Corsica. Fantastic your site. Reminded me so much. I still have 1985 F2 Strato at home and cannot throw IT away. My Sunset Slalom and my Fanatic Ultra Mosquito live still as decoration in Serifos at a friends Place Möbel. One day we Surf together there. Thanks for the kind comment. Of course I understand your affection for these fine old boards. May I offer something different as a decoration to your friend, and take in exchange the Ultra Mosquito? 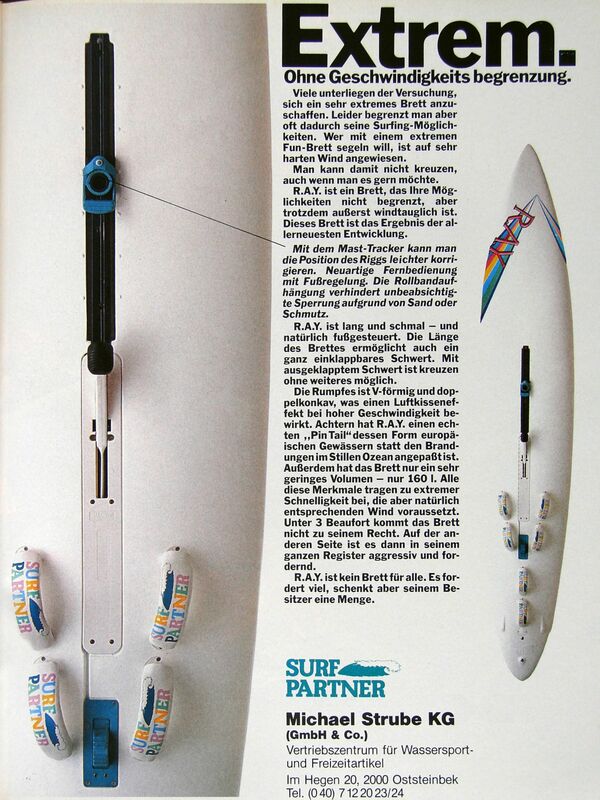 It would be great to have some gray-haired surfing sessions, as you say. Great page!. 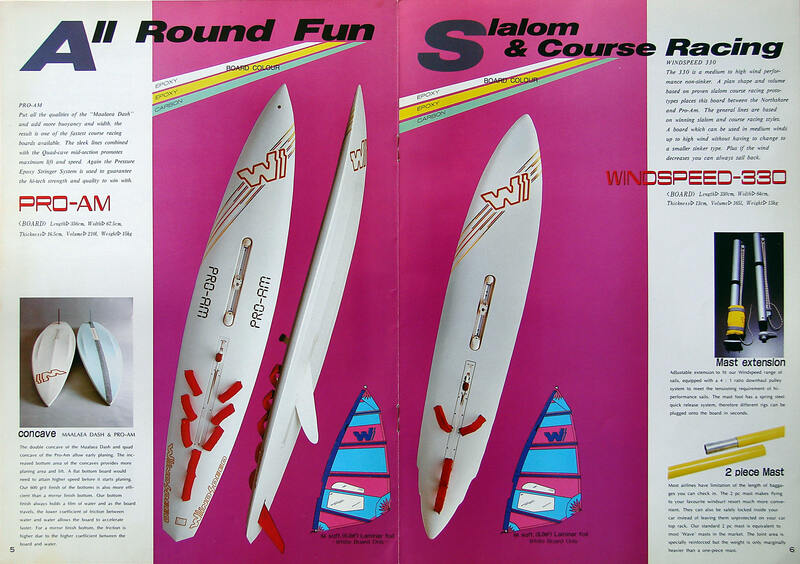 Fantastic remembering for all who love windsuf boards design. I sitill have some 90´s machines in my kiver. This is so great. 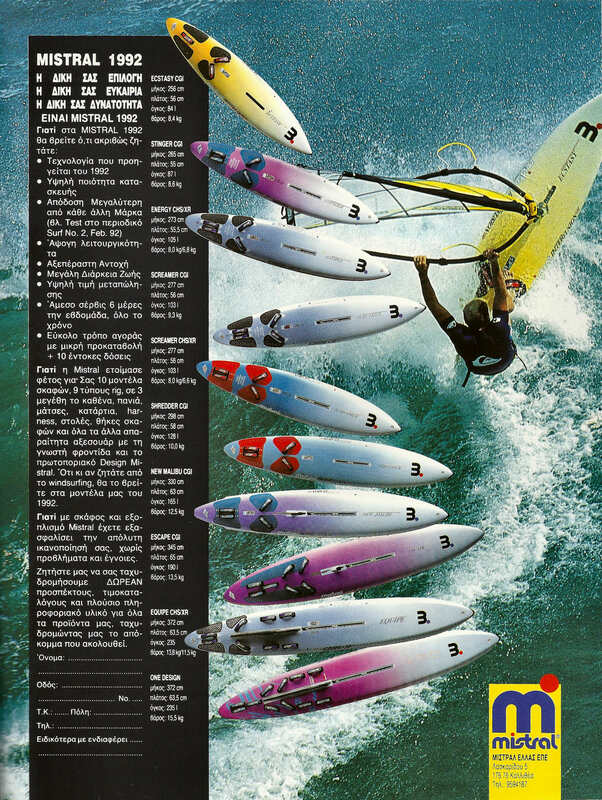 I remember back in the late 80’s & early 90’s when I used to read through Windsurfing magazine wishing I could have them all! I cut my teeth on a Fanatic Club 330. I’ve held onto it all these years and am a couple hours away from potentially selling it. I know I’l miss it, but am also glad it will help the next generation possibly get some experience on a great board to learn on. I’ve scanned through your pics a couple times and didn’t see it, but then again, I could have missed it. 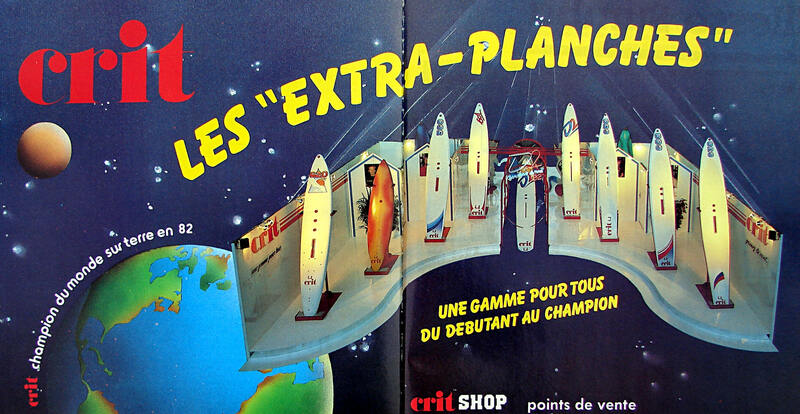 Would love to see an old flyer for it again though. Thanks for the trip down memory lane. Fanatic of years ’84, ’85, ’89, ’91 have been posted. Soon I will ad ’88 and ’96, contribution of a Dutch friend. Your Club 330 does not appear. Maybe you remember the date? I wish I could remember the year. It’s got to be somewhere between the ’85 & ’91 years I would think since I bought it in my high-school years. 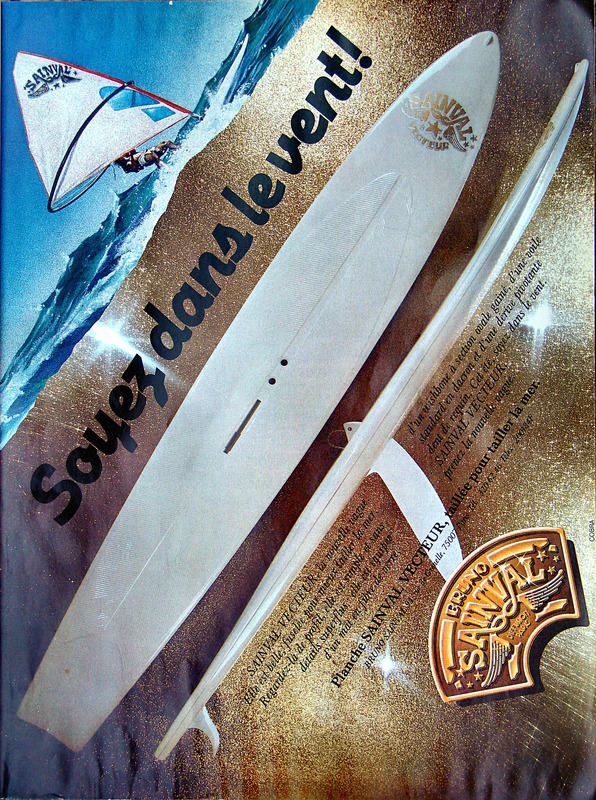 Have you the folder of the mistral PANAM 2000? 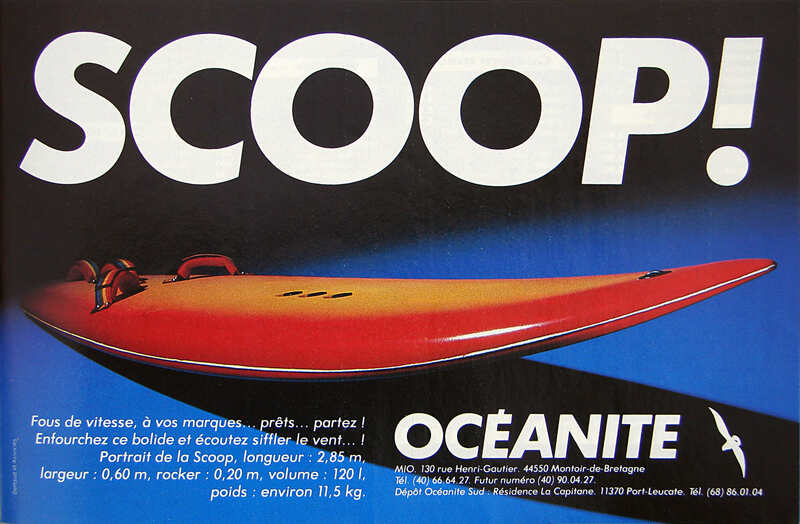 Which year was it available, because the Quai 34 catalog of 2000, does not include it and I do not post material any newer than that. I believe by that time, digitalisation was widely available and such information should be available by any brand still in the business that respect both it’s customers and it’s own name. Maybe you have it and want to contribute? Wow. I saw my original Alpha, F2 Bullit & Fanatic Ultra Cat. Brought back some great memories. Thanks for putting this together. 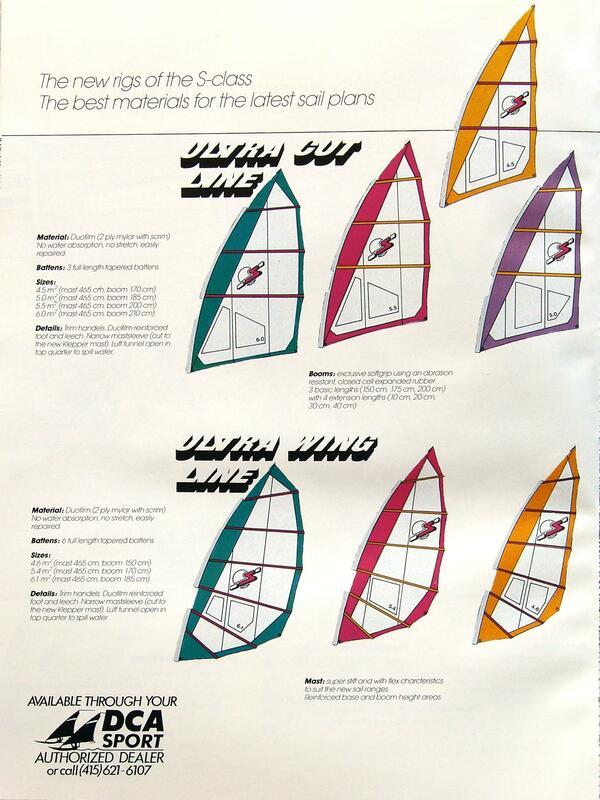 Stay tuned, because this season,I plan a strong raceboard comeback with a reconditioned Ultra Cat. 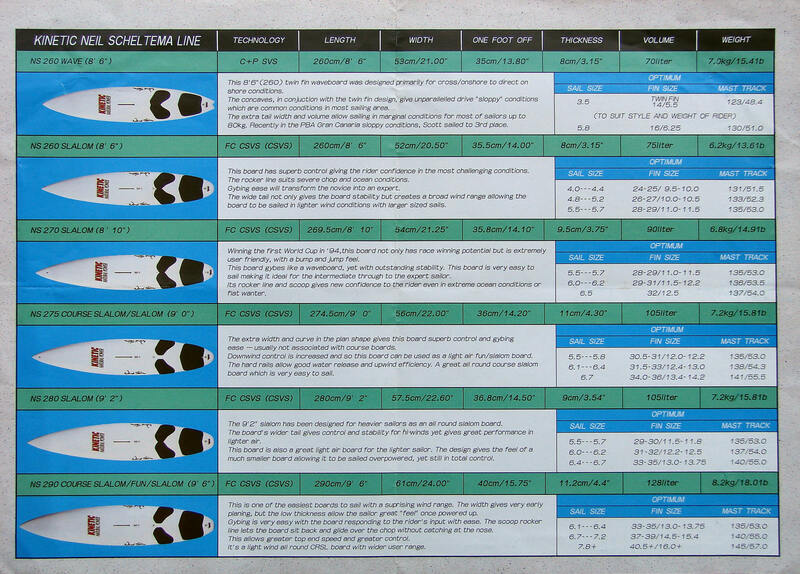 This an awesome resource, I’ve used it many times in the last 5 years. THANK YOU so much for maintaining it. 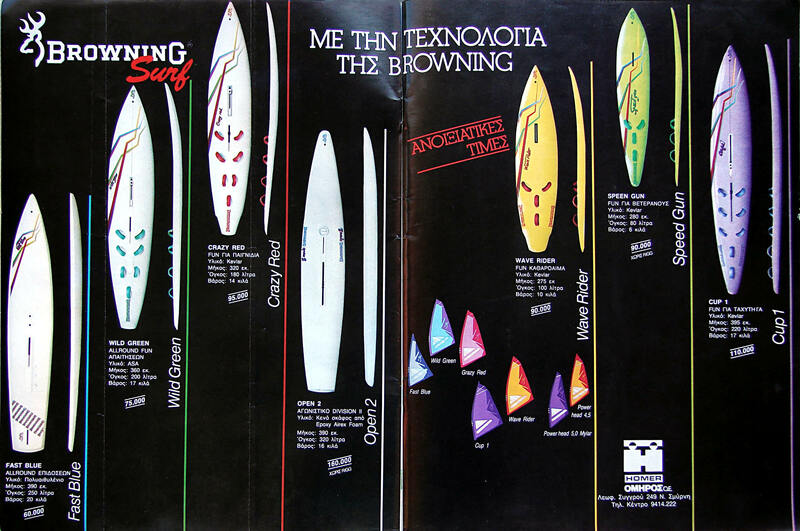 I bought my first board in ’81 it was a brand new Alpha Professional, and of course it’s included in this amazing collection of windsurfing history. 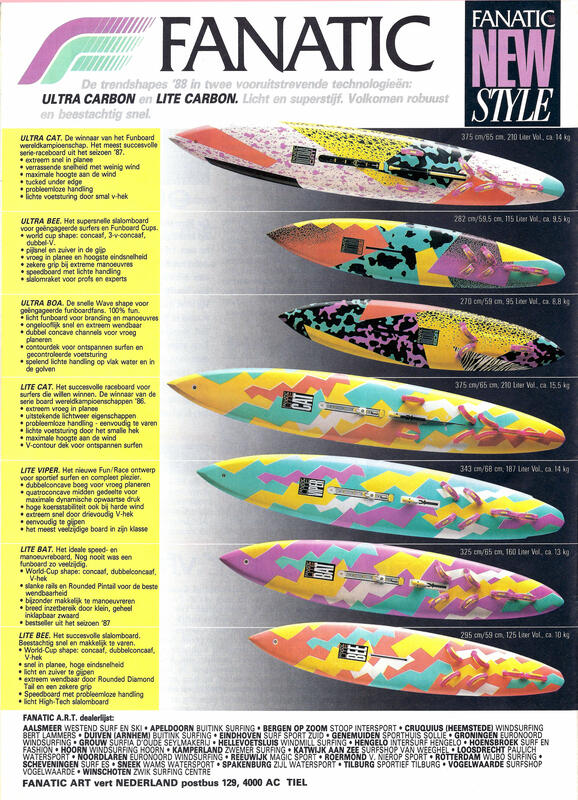 It’s long gone, but I still sail many 90’s boards and newer models. 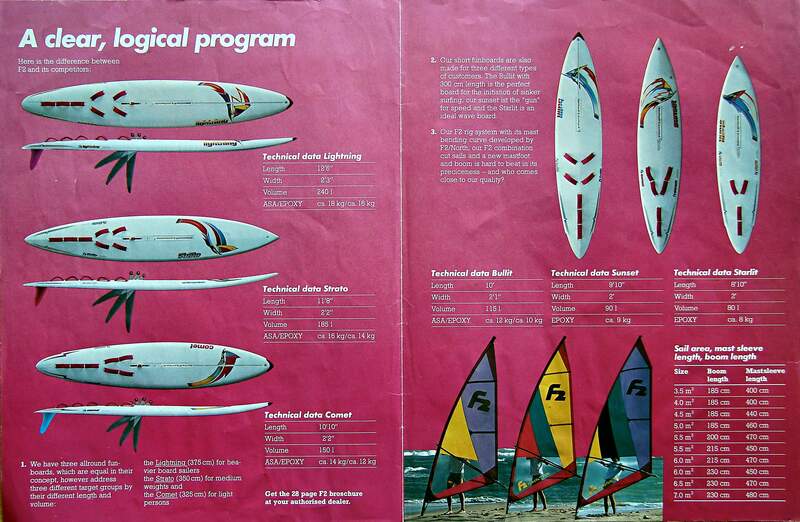 And I still teach beginning windsurfing to new people every year. My question is this. 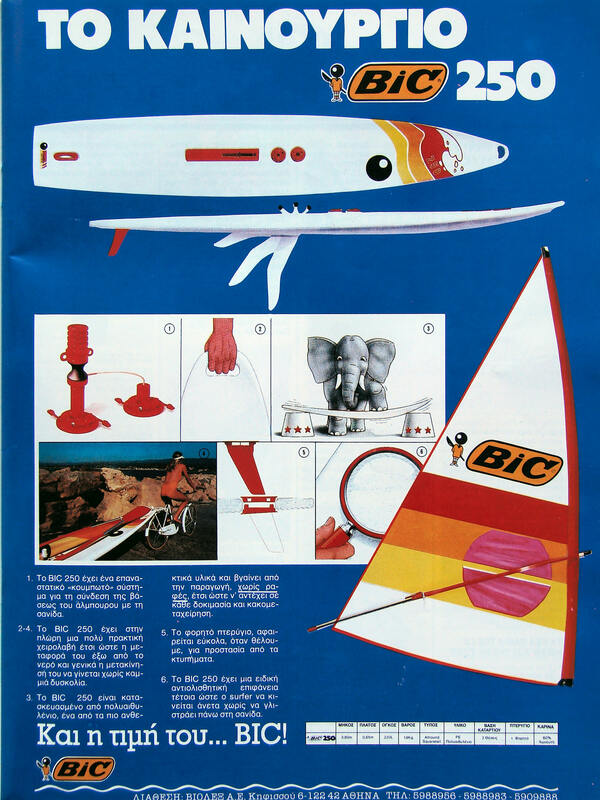 I thought there was a link here, a few years ago, with all the Bic boards from before 2000. 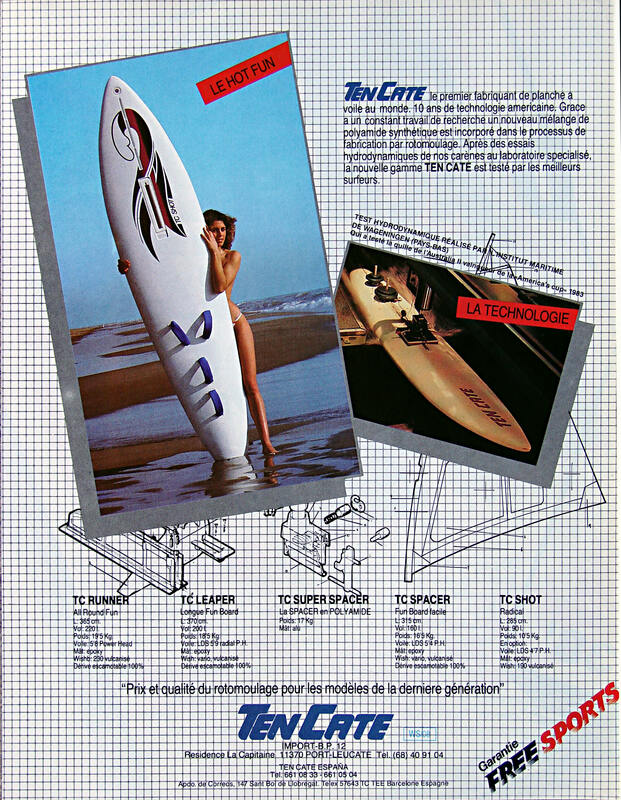 It was a huge list, with dimensions and specs of all the 80’s and 90’s Bic boards. But I’ve gone through your collection here twice, and I don’t see it any more. Do you recall the link I’m talking about? Thanks Greg for your encouraging words. 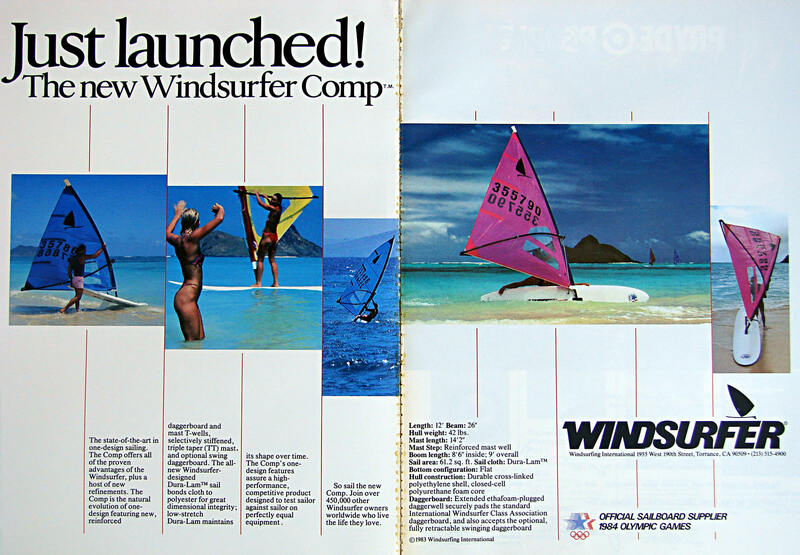 It is hard to believe that there are not more archiving windsurfing sites, and totally unacceptable still operating brands, not offering information from their golden windsurfing period. No, I never had a vintage BIC link and if you come across to it again, please let me know. 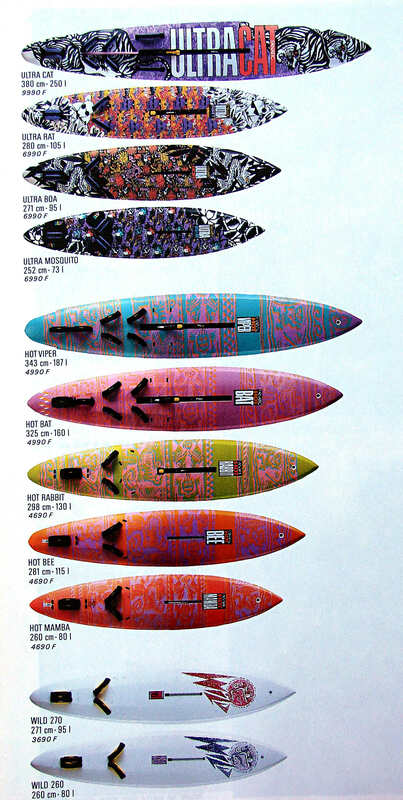 Hi, very cool to see how the boards / sails developed over the years. 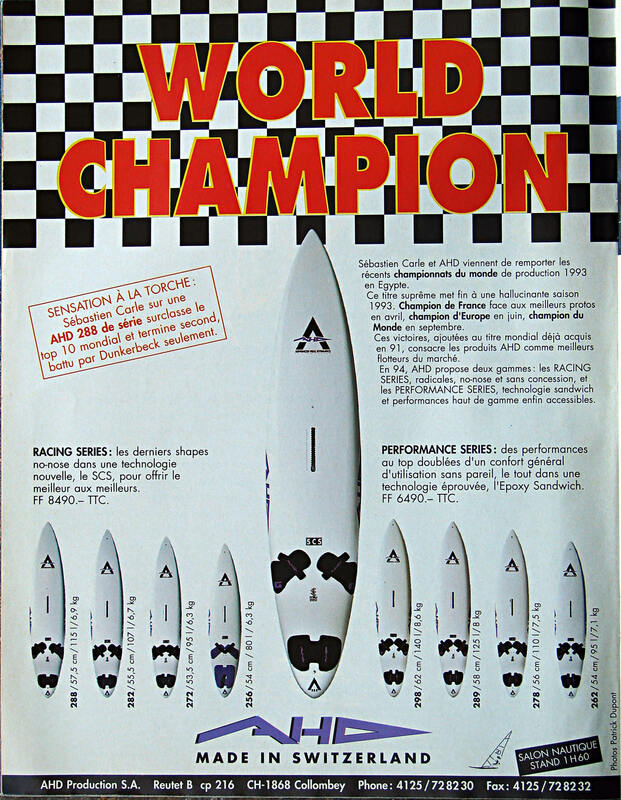 Do you have any good info on the AHD 67 Diamond race boards? Thx for doing this page. 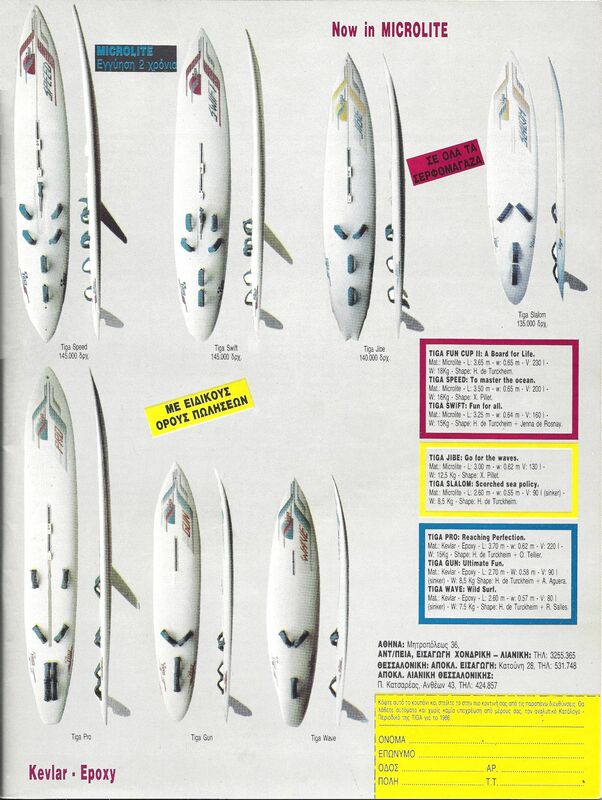 They were friendly boards – although called Race – still a good large board option and @ bargain prices nowadays. Thx for info. I have a AHD 67 Diamond board and im an Intermediate sailor i think, or hope so lol. Not sure if the board is right for intermediate sailor. 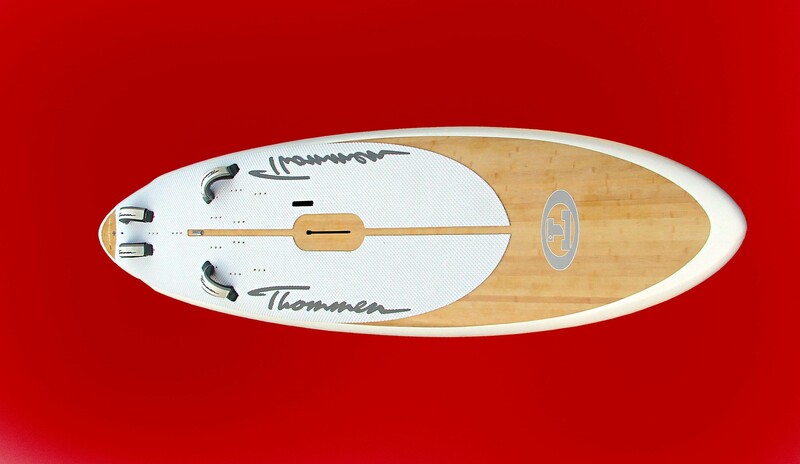 Does anybody know in which year the F2 Thommen board pictured here (https://hitthewave.files.wordpress.com/2012/09/a-thommen-experience-165-test-photo.jpg) was introduced? Thanks. It is not an F2 board. Thommen had left F2 and set up his own independent T1 brand. This board was introduced in 2010. The specific one pictured here as you can see, has serial no 42 and was made in May 2010. Thanks very much @zaosan. 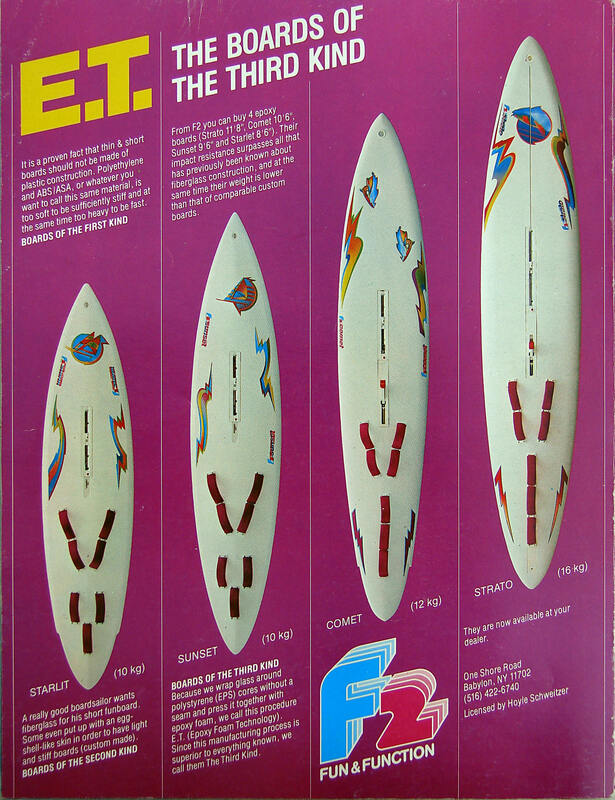 A dealer is offering me this board and I was wondering if it is worth getting it. 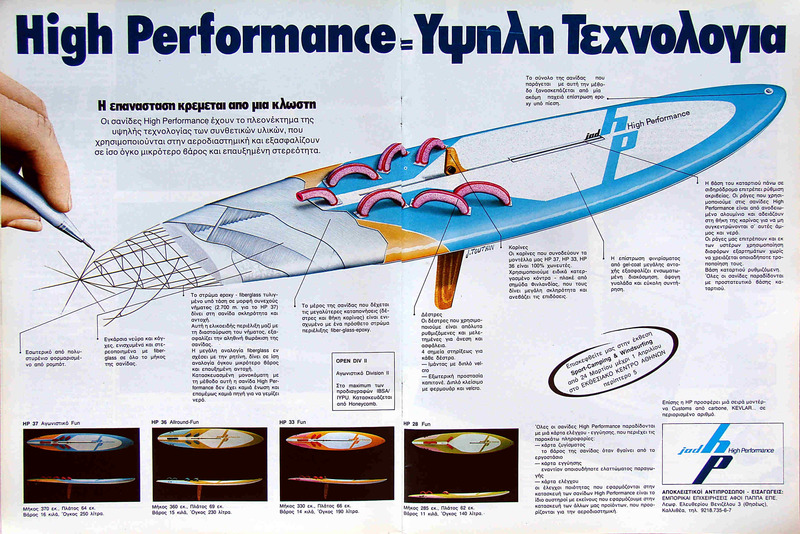 The design of the board is very good, aesthetically suits my taste, but finally the use of the bamboo skin is not without problems (you will soon read about my Exocet bamboo damage), and that was the reason Thommen switched back to carbon derivatives in 2013. I don’t know which version you are bargaining, but I believe very few carbon ones were sold. Thanks for the good old one’s!!!!! Haha!! Yesterday the wind was blowing in the Netherlands with a sweet touch of sunshine… I started out on my lightwind setup. 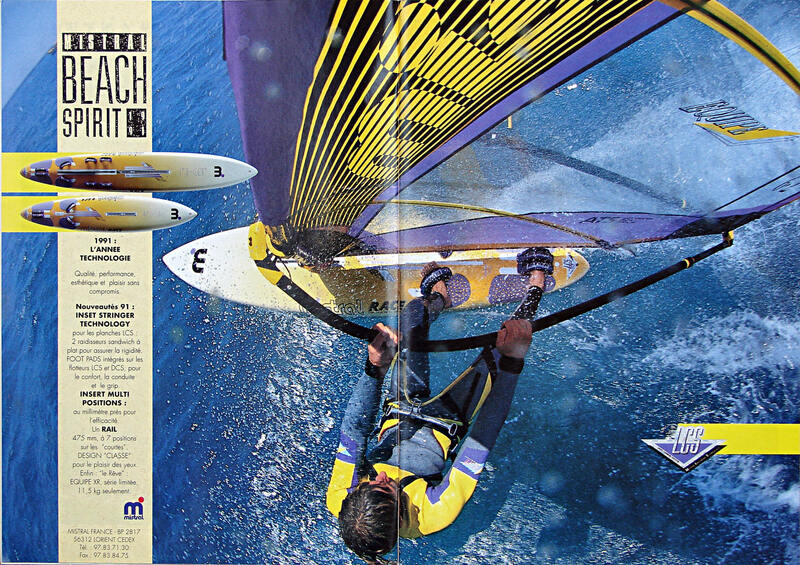 The ’92 Axxis 257 with a Naish Stealth 7,6 racing sail. The sail was poorly rigged as i blew the rigging wheels on my mast extension. I only had the cleat working so i couldn’t get the right downhaul…. An acquaintance commented me when i walked towards the water “wow! 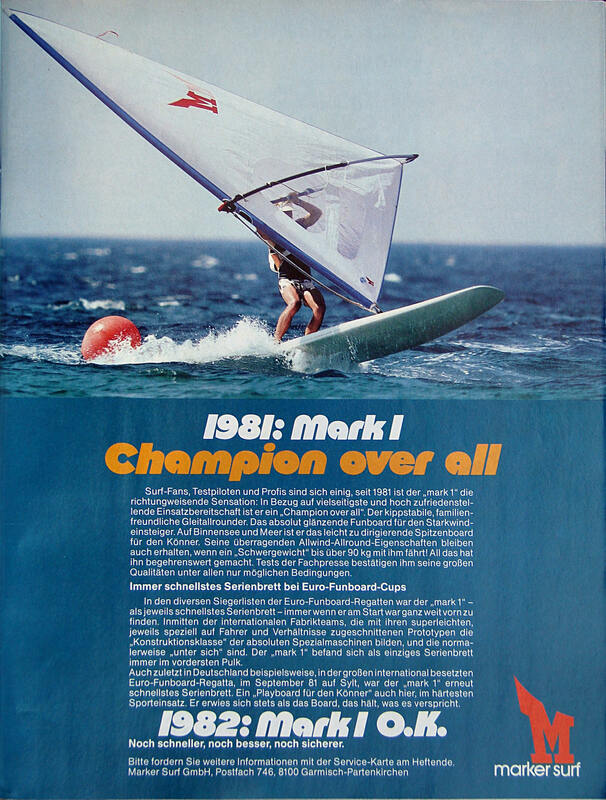 that’s an oldie!” He himself was carrying the newest stuff; some fancy Fanatic superfast race/slalom board with a brand new GA racing sail.. 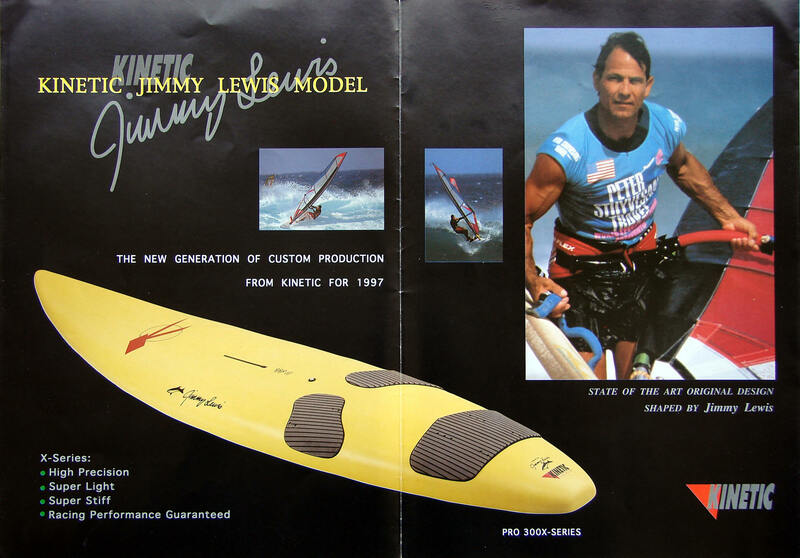 So point of the story… (i guess) is that you don’t have to have the most new and expensive shizzle to have fun on the water and never, never underestimate someones quiver…. True surfing comes from the heart&soul (and a little bit of bodystrength). .. 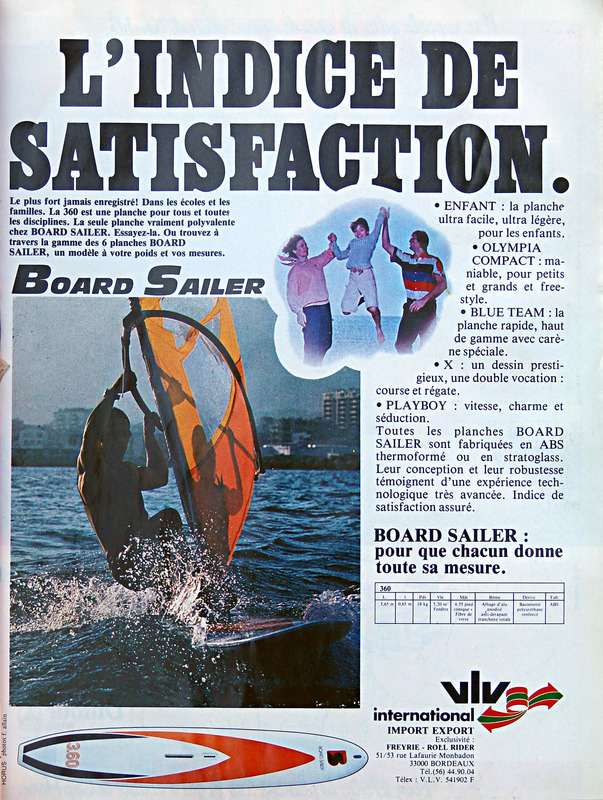 Yes, it’s always great fun to smoke the latest gear, while riding proven vintage boards & sails! yeah.. it gives some kind of extra kick to the already greatest kick in the world.. Knowing you have a total monetary worthless piece of equipment compared to the multi-multi-$$$$$$ setup that others have, that you can blow them out by having elementary fun (and a little bit of skills). 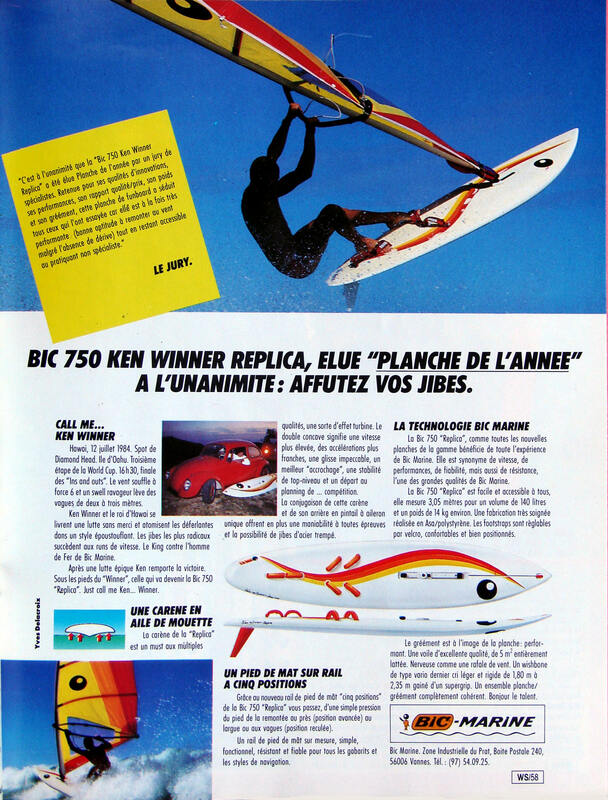 Can’t find the Airtech 2000 inflatable board. i have a flyer I can scan in if you want it. No, thanks. 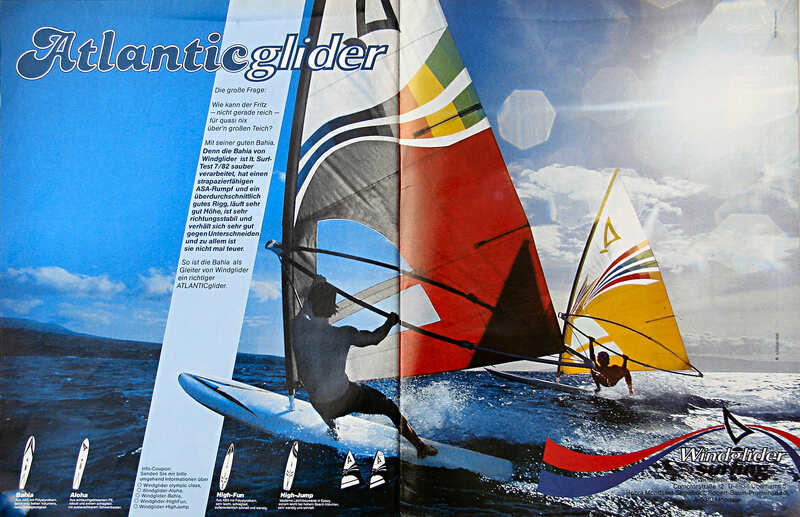 The first really properly sailing inflatable windsurf was launched last year by RRD. All previous efforts were far from offering decent performance. Thank you buddy! it’s a very looooong time I haven’t seen my beloved Fun Cup 2. Shame on me I sold it for an Electric Rock! Huge thanks for putting this together!!! 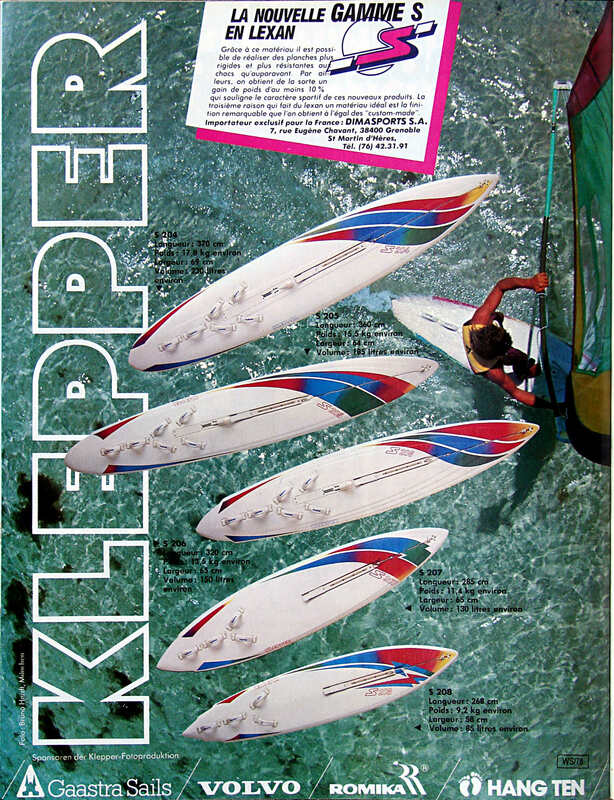 I could find a photo of my beloved 1983 Klepper 295, amongst the rest. Fantastic Collection. Thank you for sharing. This has brought back many fond memories from the 80’s and 90’s. swimming around when i was a kid, Question I have received a lightning 1984 but have no mastfoot, is there anyway to find out what kind of pin or mastfoot it had? 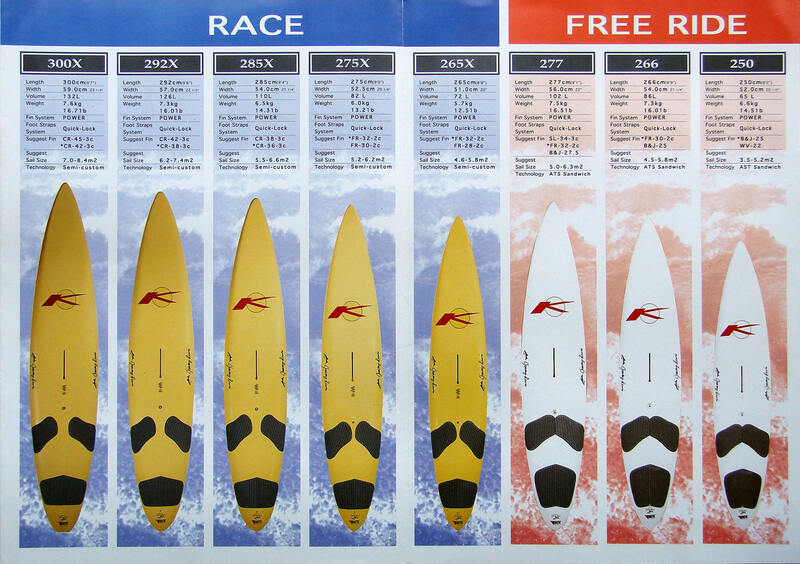 Long Raceboards clubs in your area (CH, I understand), may have similar boards to check. 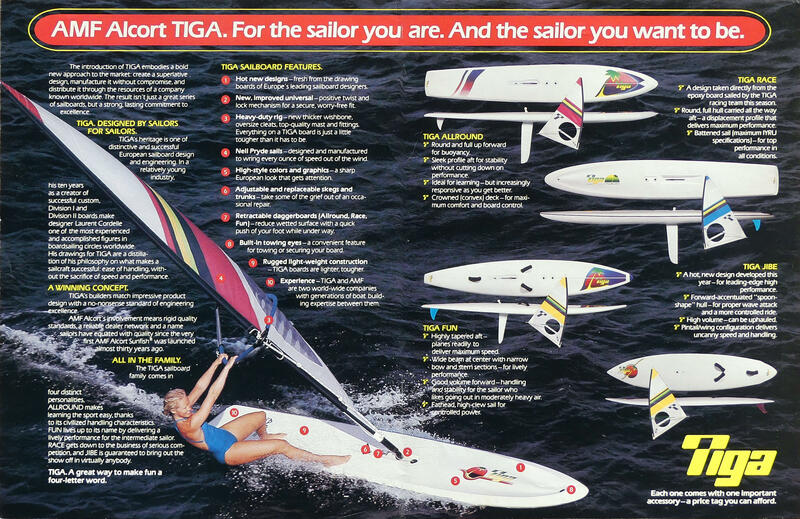 Good day I have recently received a tiga wind surfer as a gift with my fishing ski I would like to find out more about it. Tigas are very durable and it is easy to keep in good condition. Without photos (including specs labels) and dimensions of the board, how can anyone identify yours? Oh my god! I think a tear has just left my eye!! 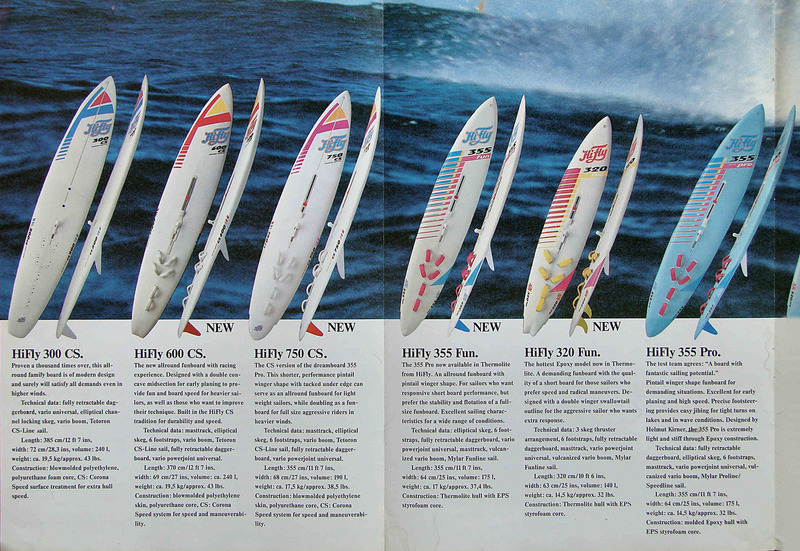 Brilliant effort in preserving these pre-digital brochures and ad campaigns. A golden era for me. 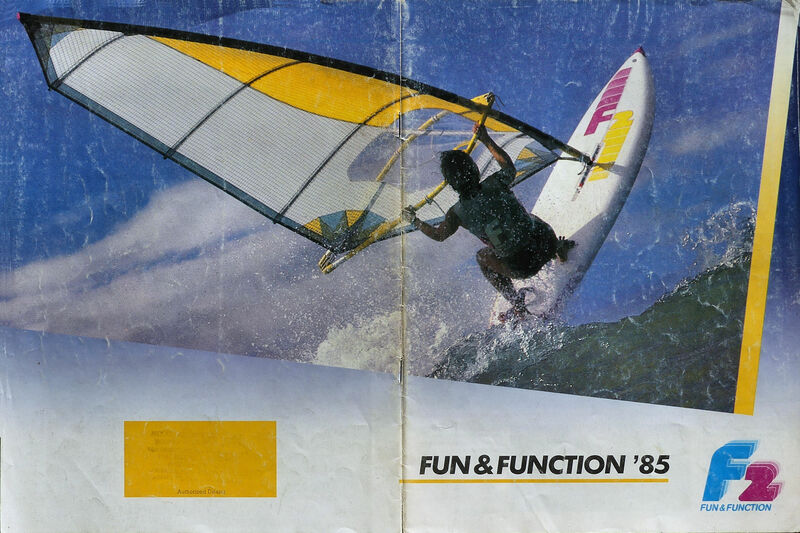 I started windsurfing in 1983 aged 10. Based in the UK my friends and I became hooked on the sport. 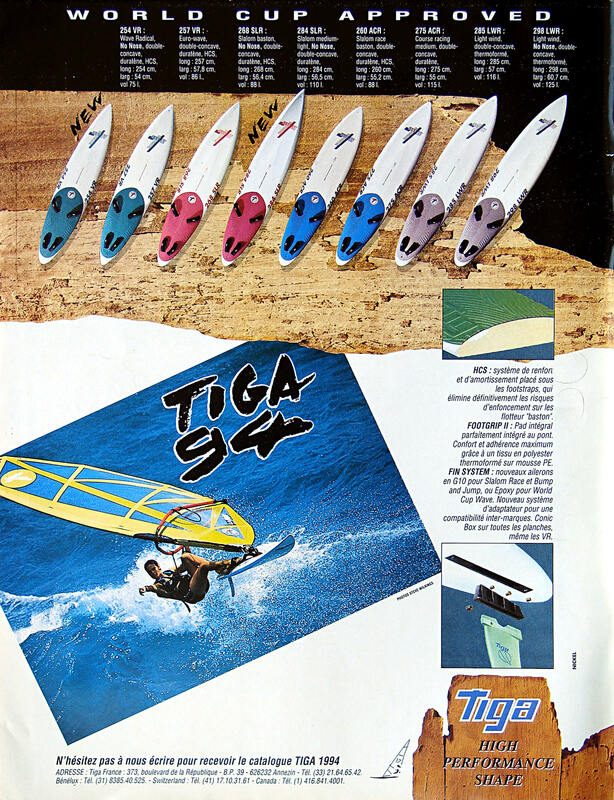 Owning Tiga boards until the late 90’s. We all still sail and love getting out in the waves of North Cornwall. 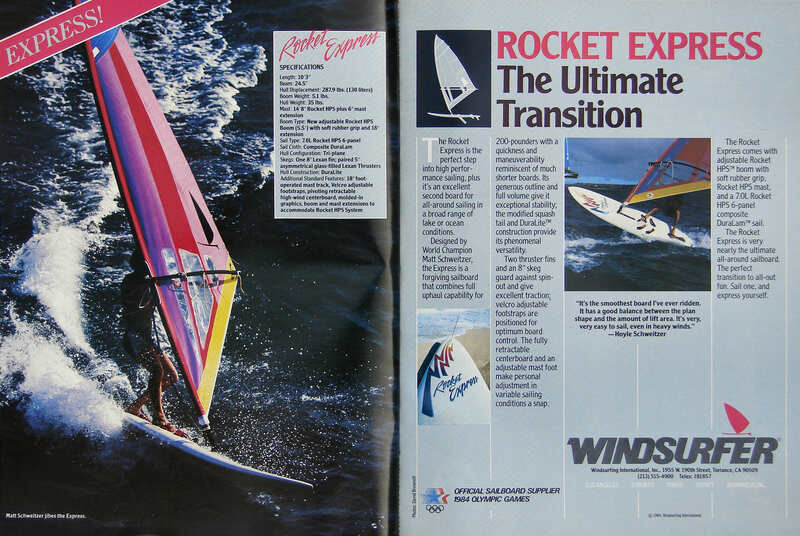 I’ve just found 4 copies of windsurf magazine (1986, 1988, 1989) during a house move and they are absolutely mint condition. I’ll scan them and send you the images!! Thank you so much for making my day!! I’m glad you enjoy and appreciate my effort. 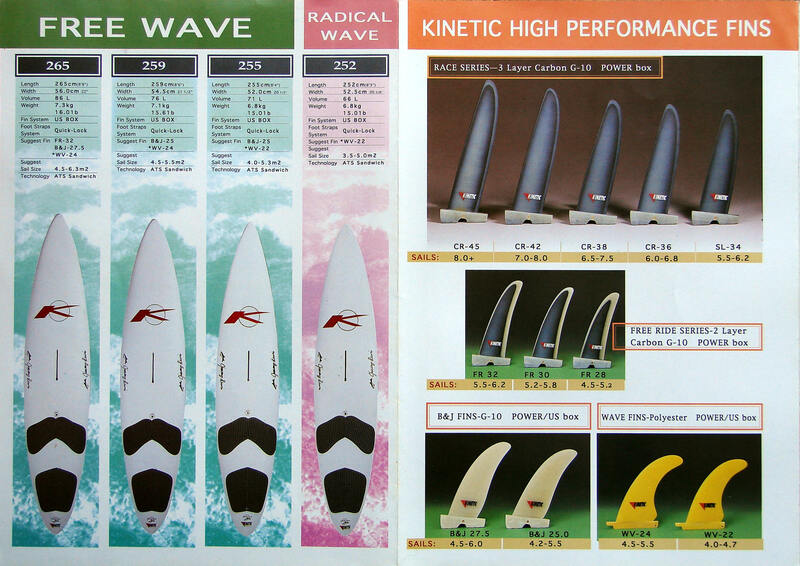 Any scan of material not yet uploaded is welcome, especially those showing complete ranges of boards with specs. Keep on sailing with your buds!